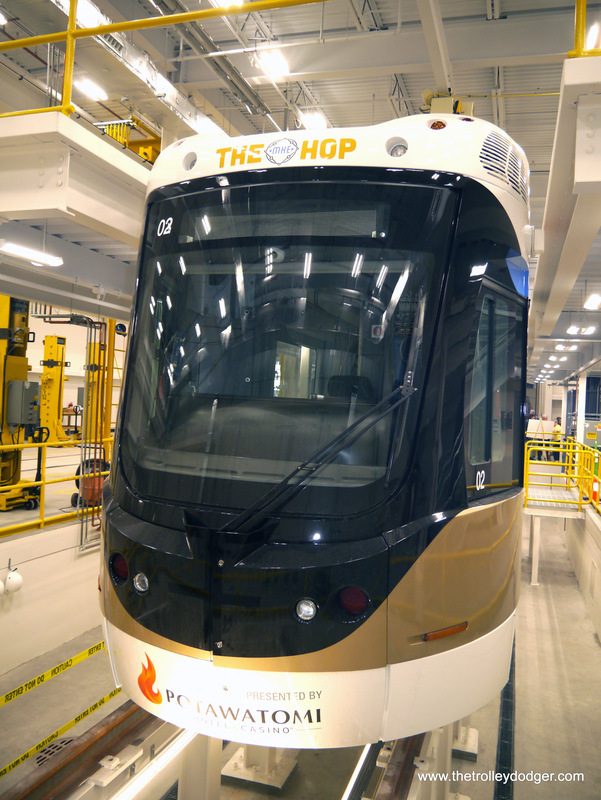 Ultimately, there will be five vehicles to start, and they are being delivered at the rate of about one per month. 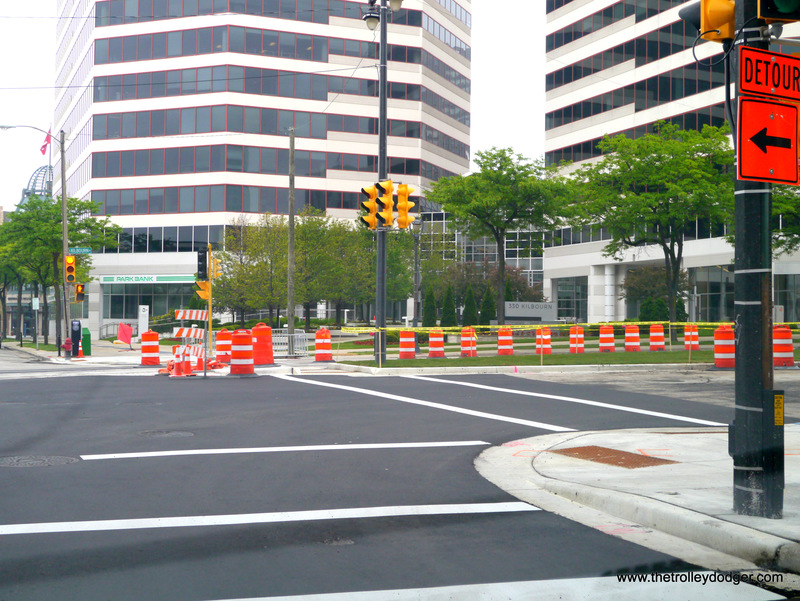 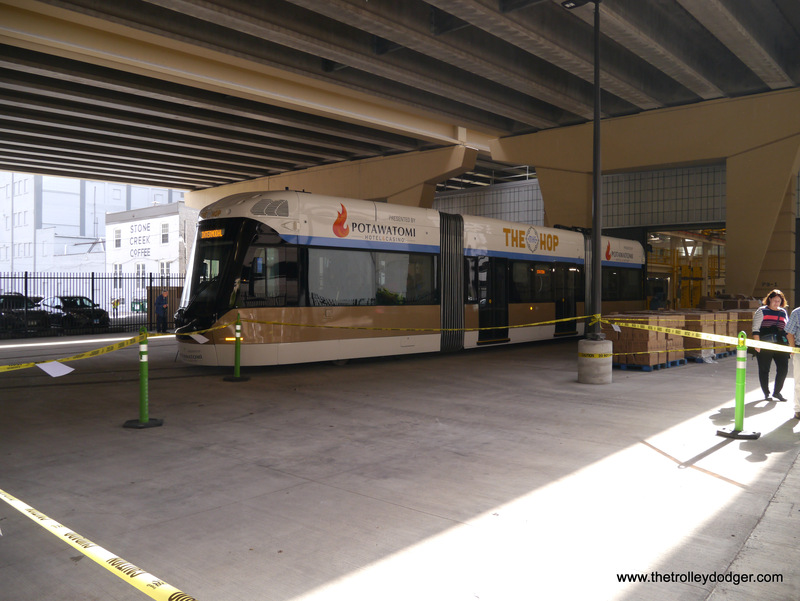 From the looks of things, it may be another month or so before testing begins along the line. 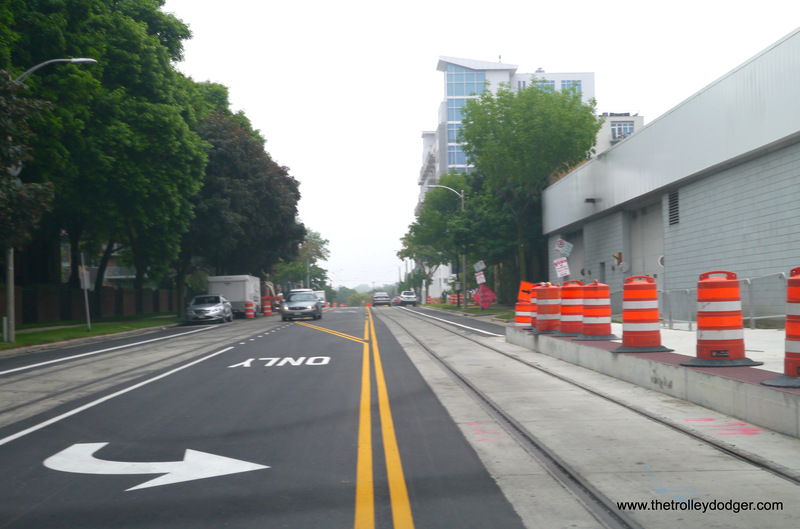 The day after the open house, we drove around, taking numerous pictures that we hope will gave you an idea of how track work is progressing. 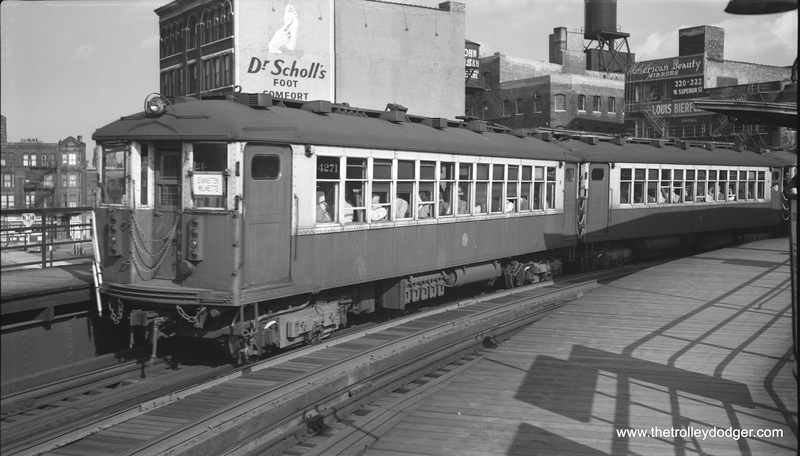 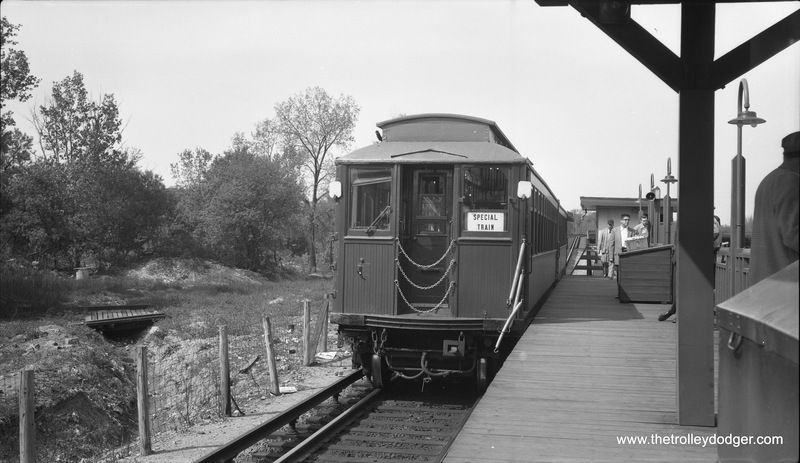 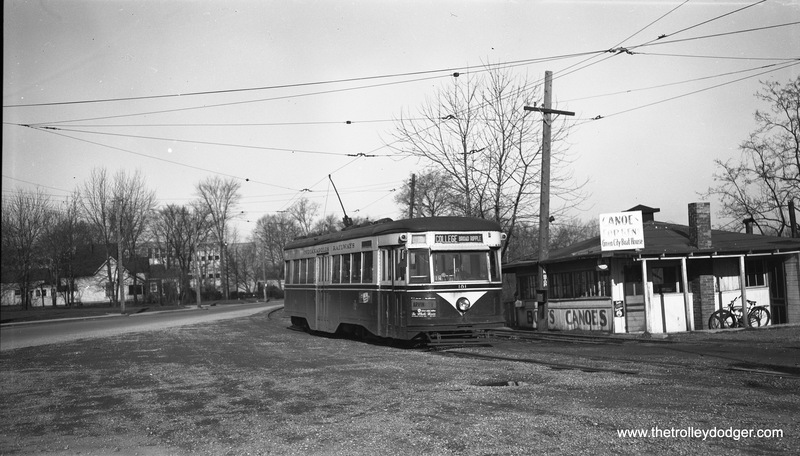 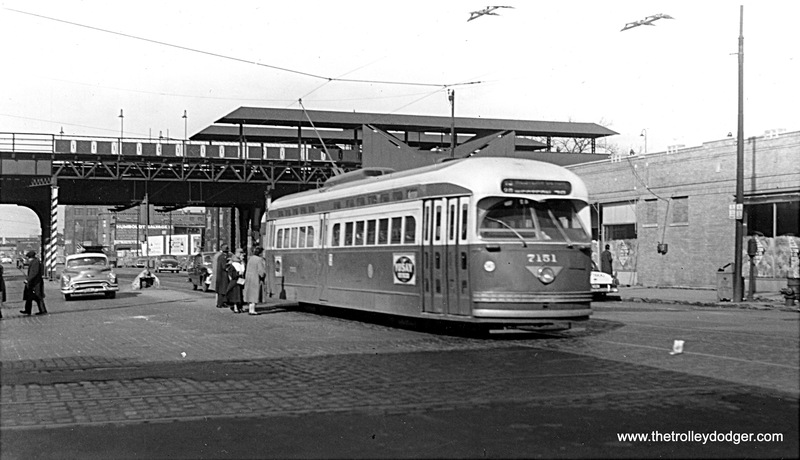 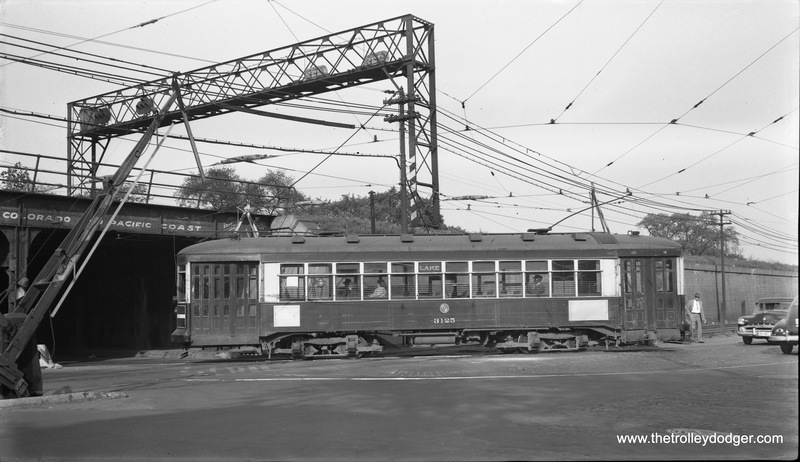 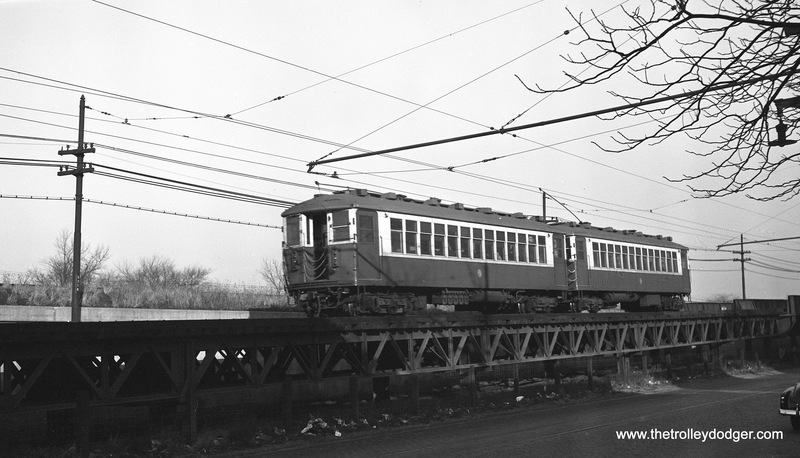 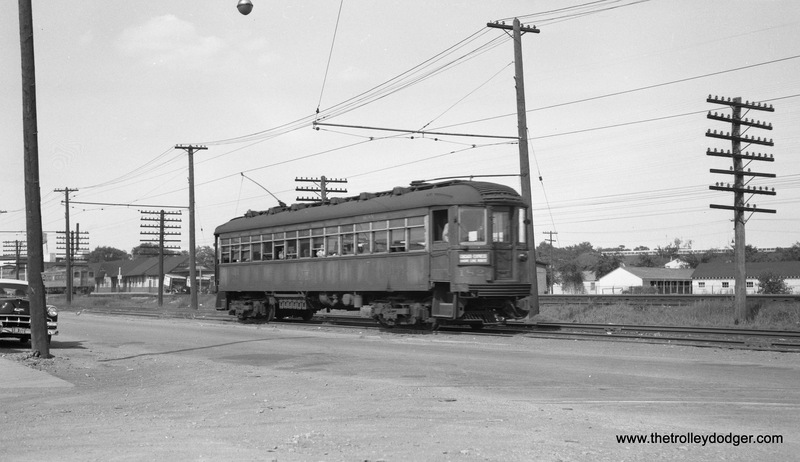 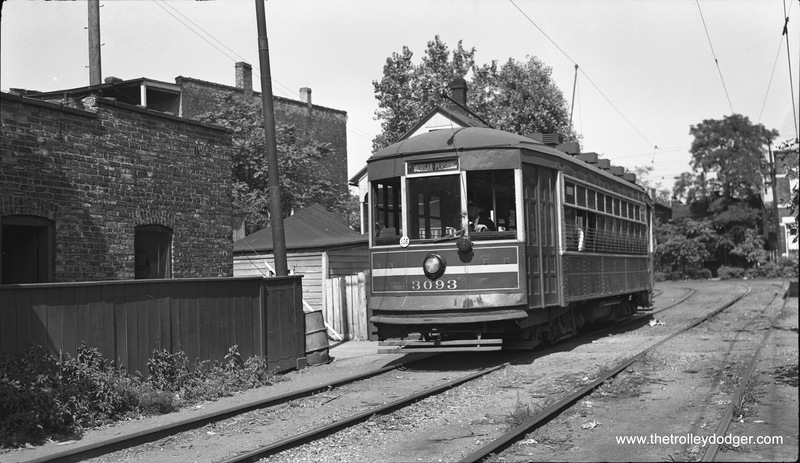 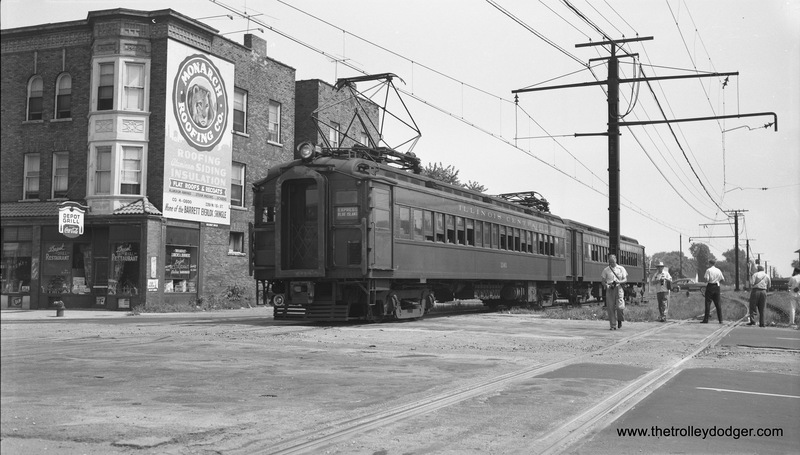 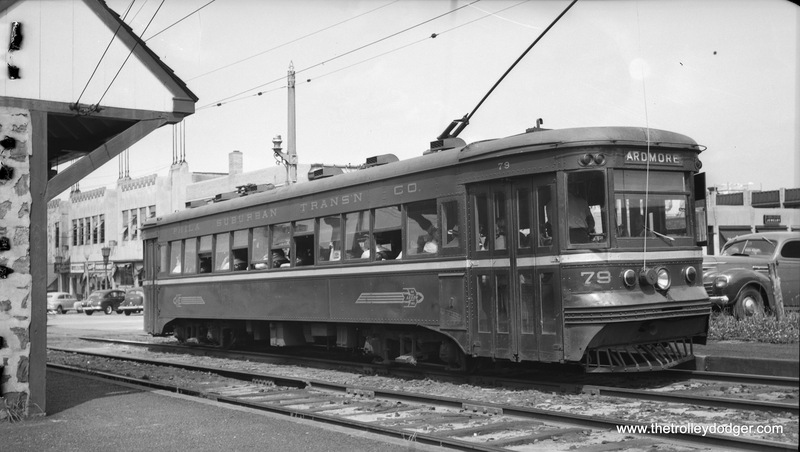 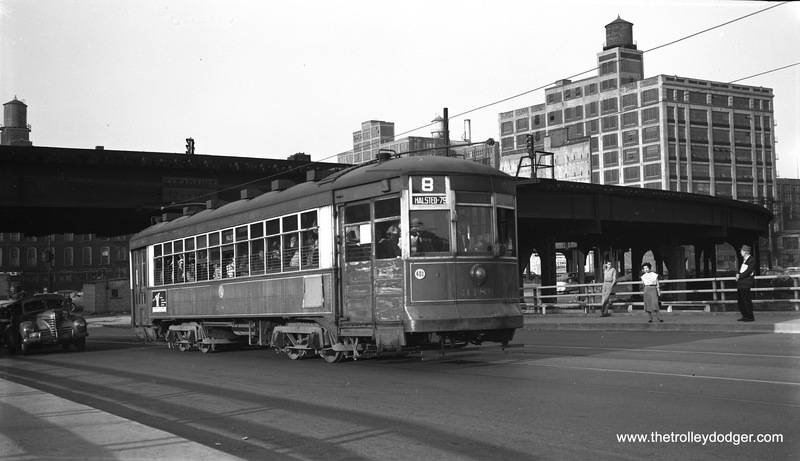 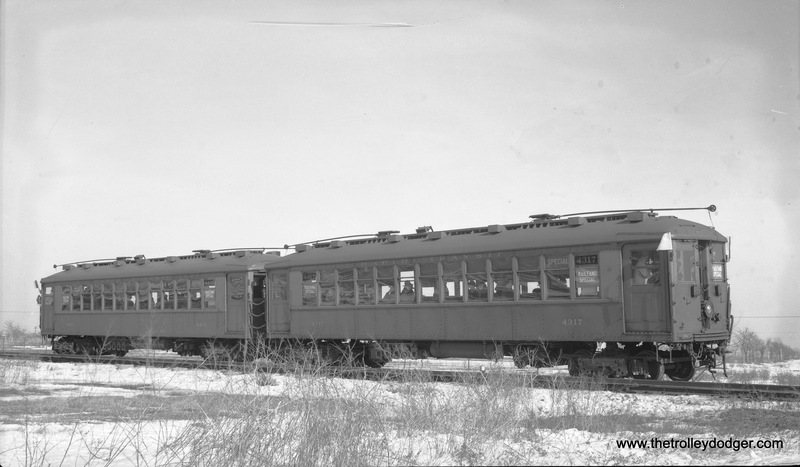 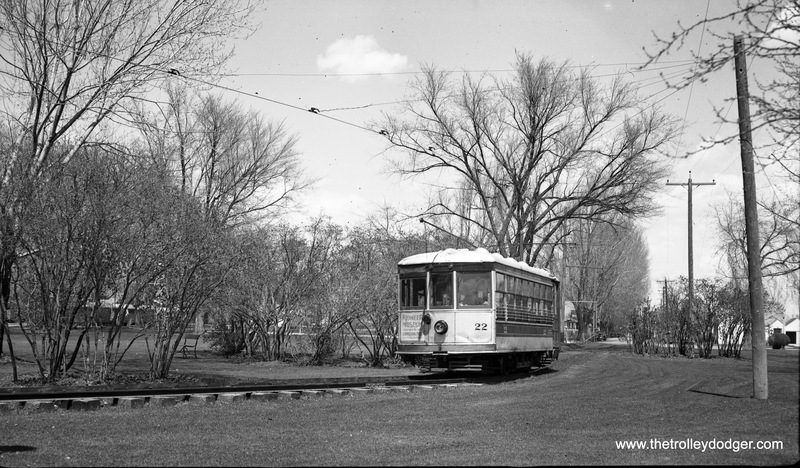 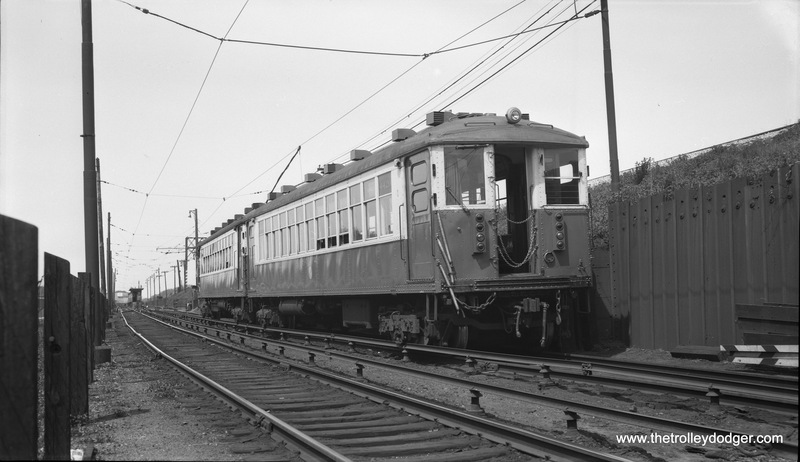 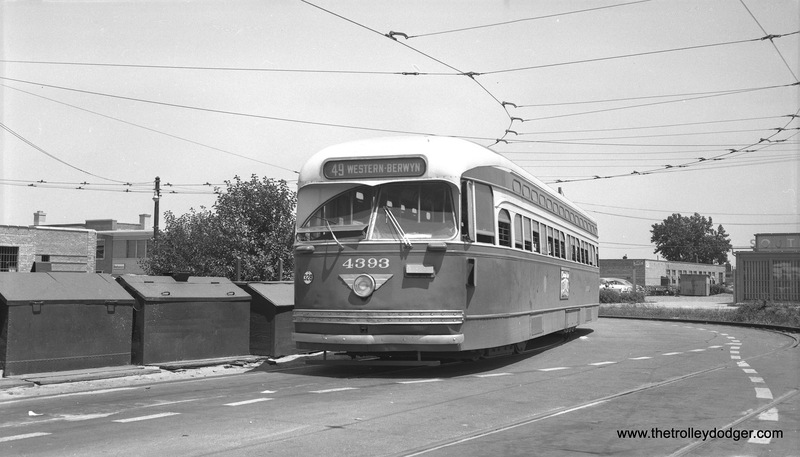 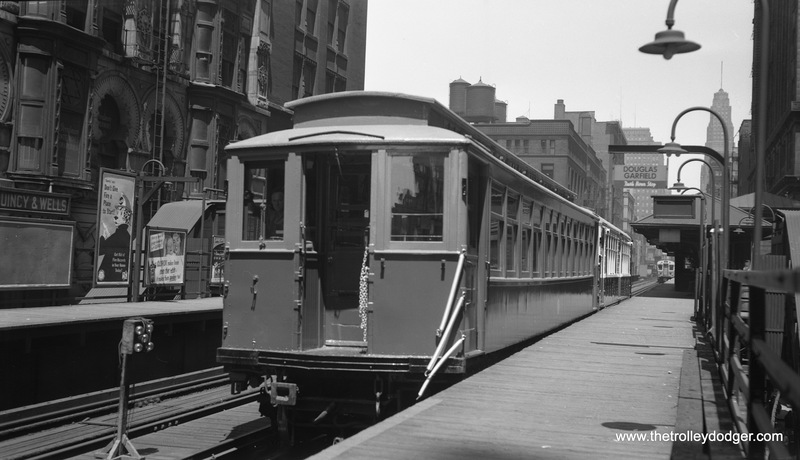 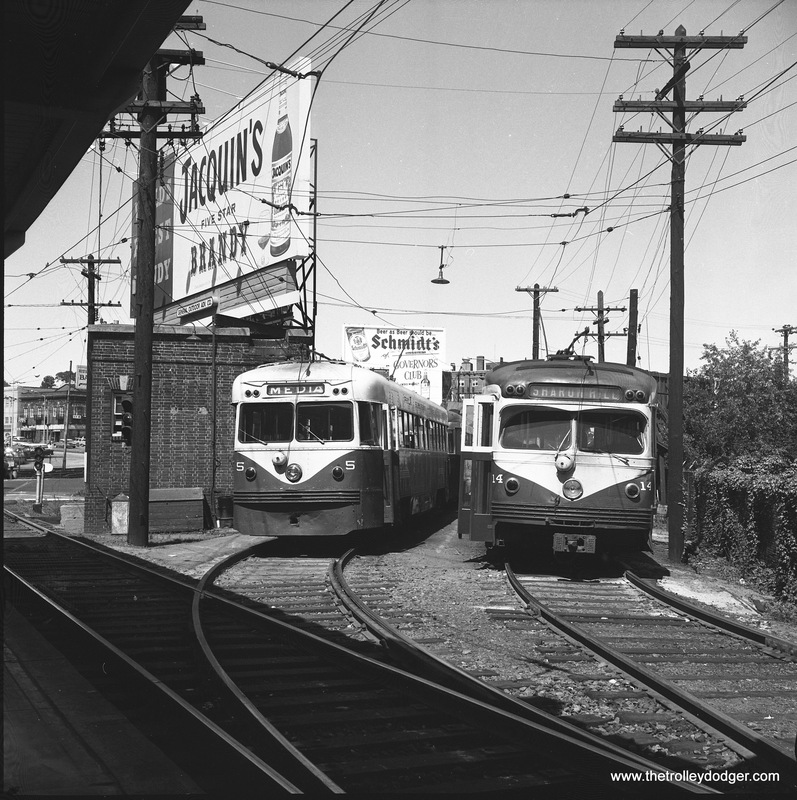 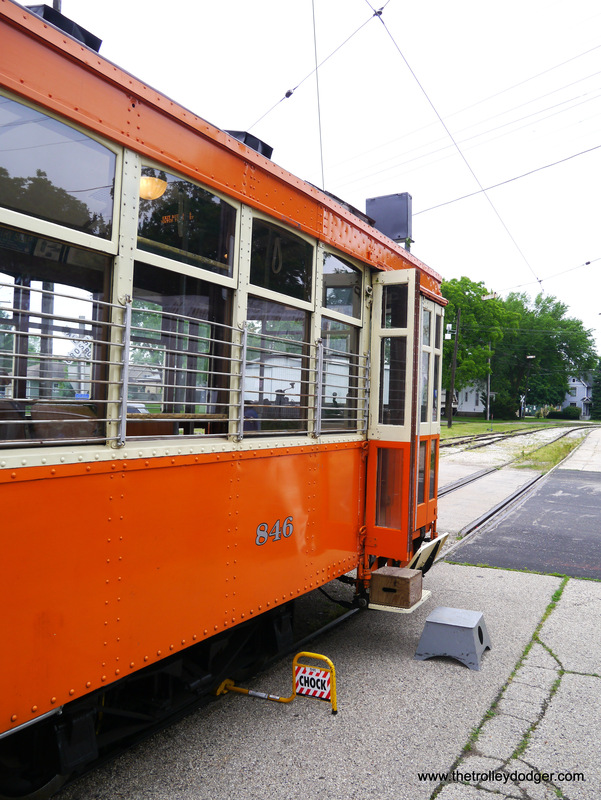 Not all portions of the route will use overhead wire, as modern streetcars have batteries too. 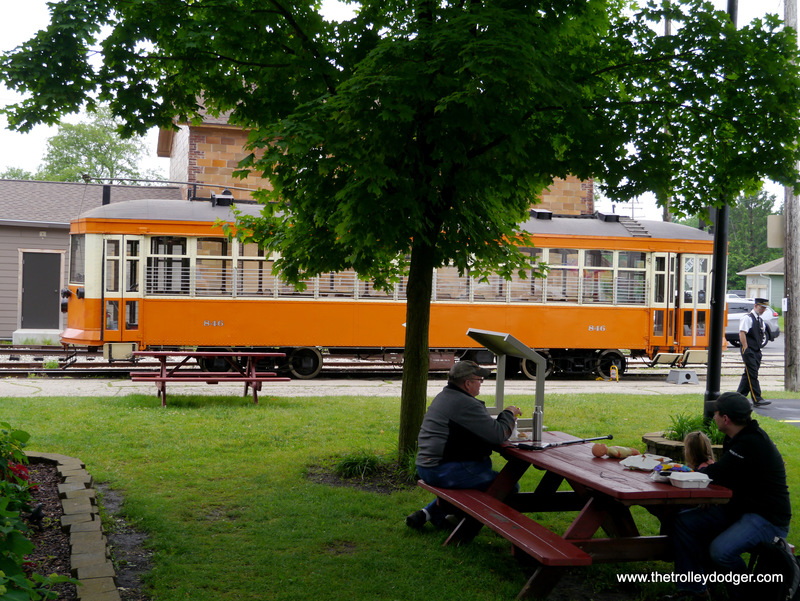 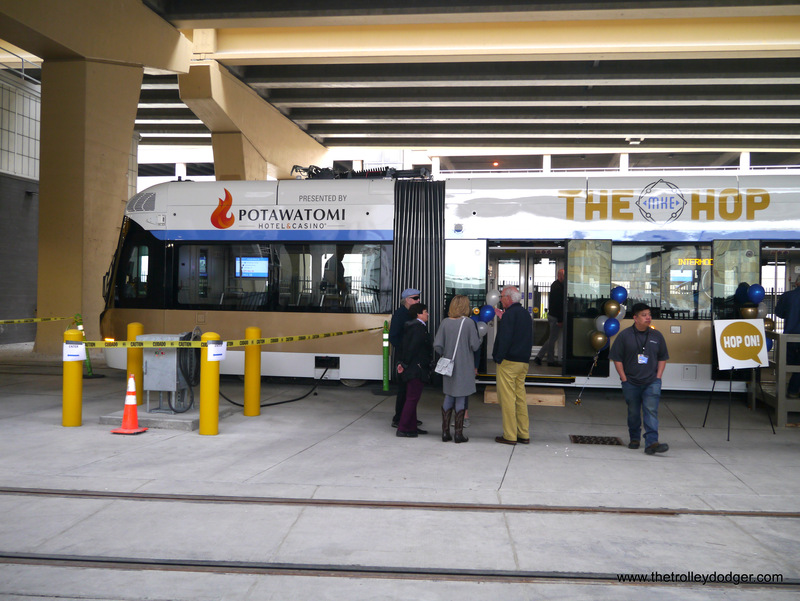 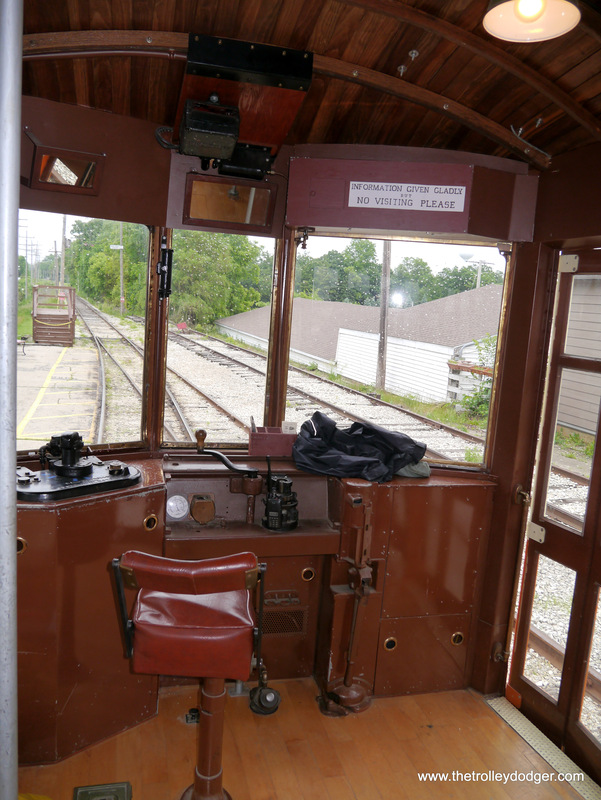 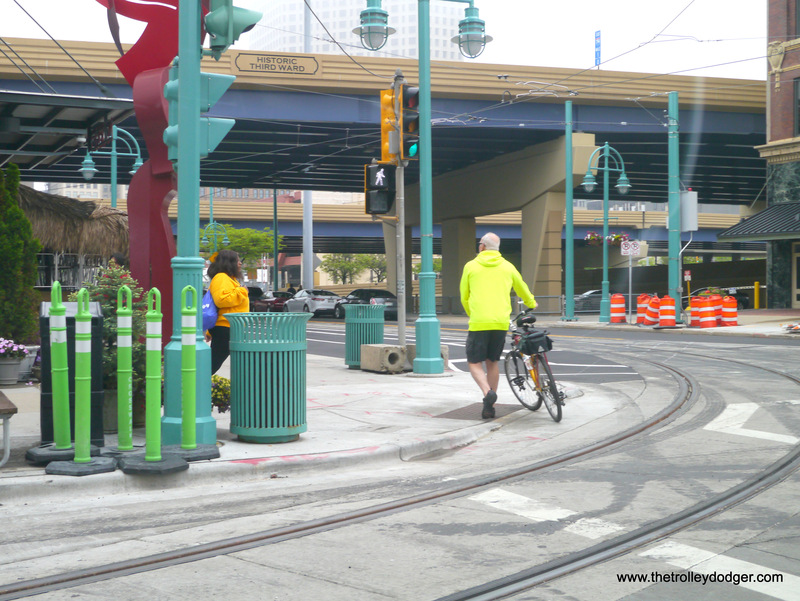 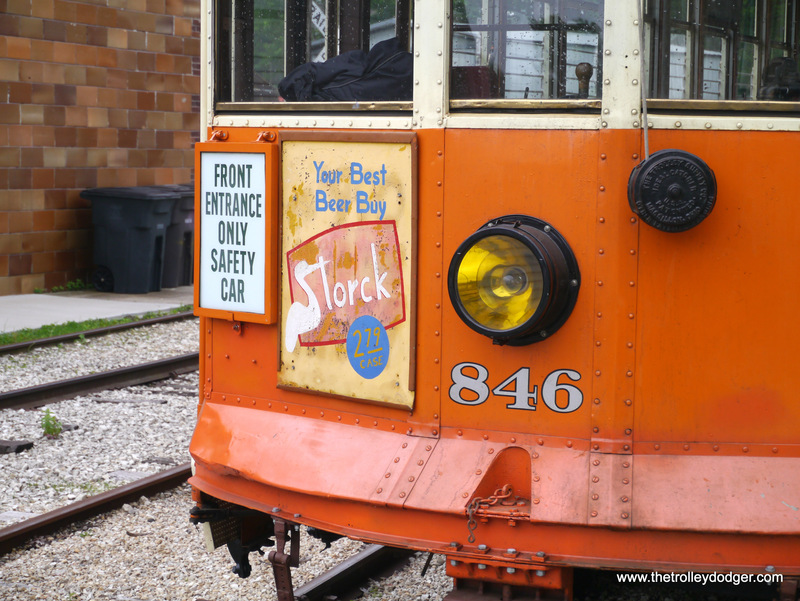 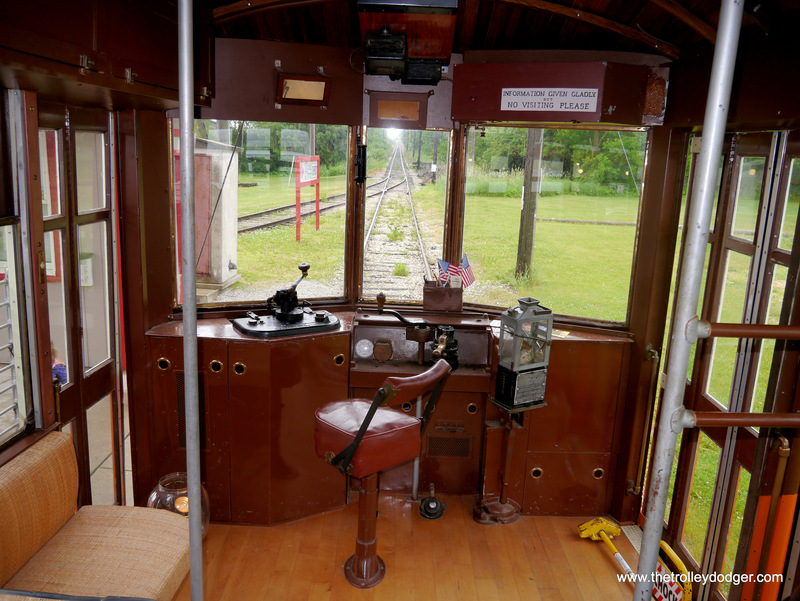 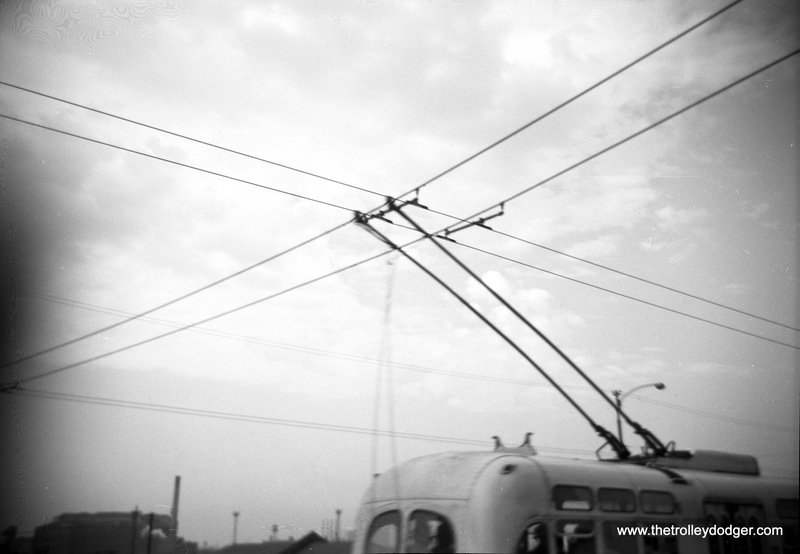 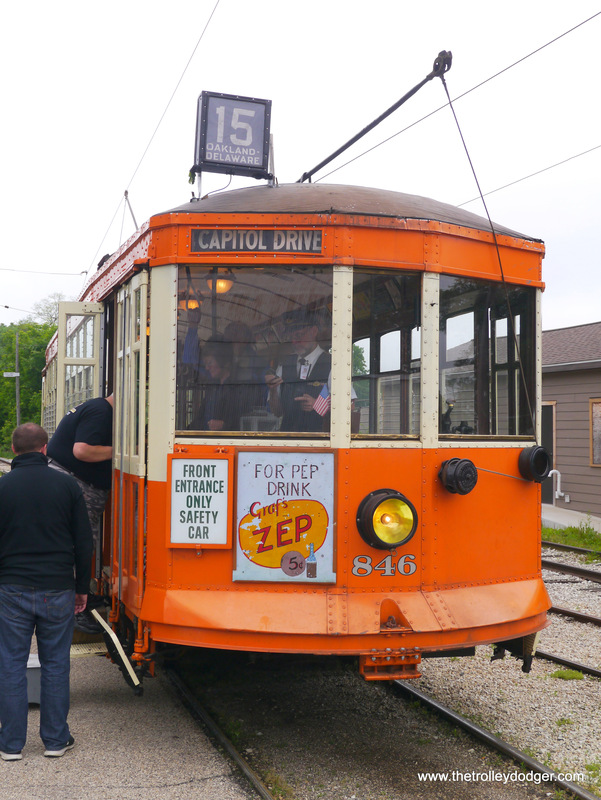 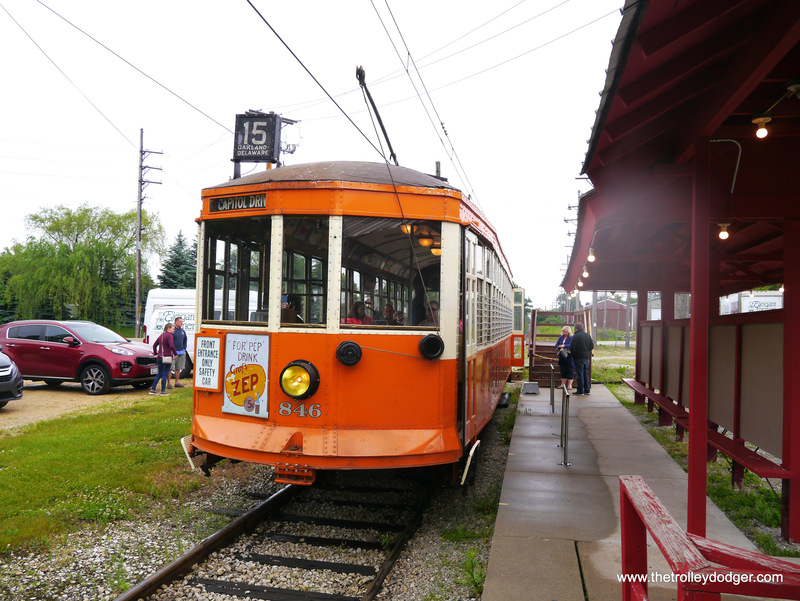 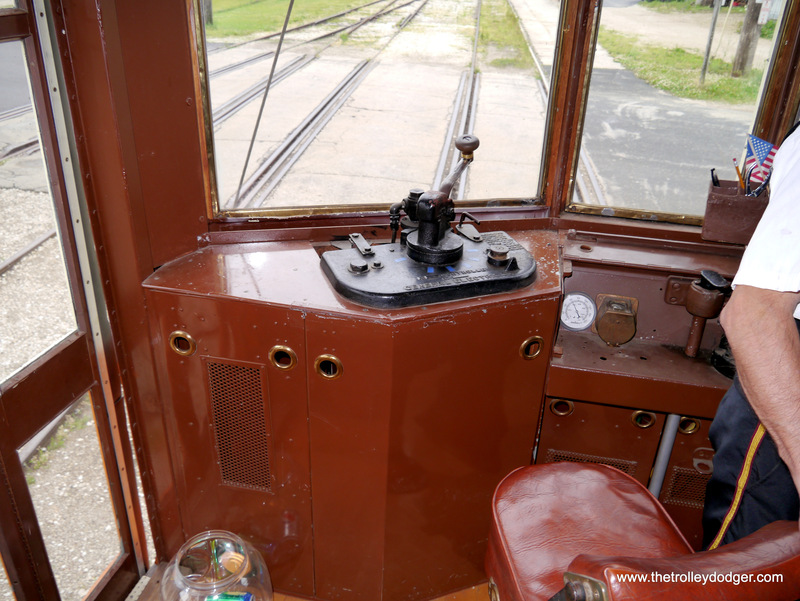 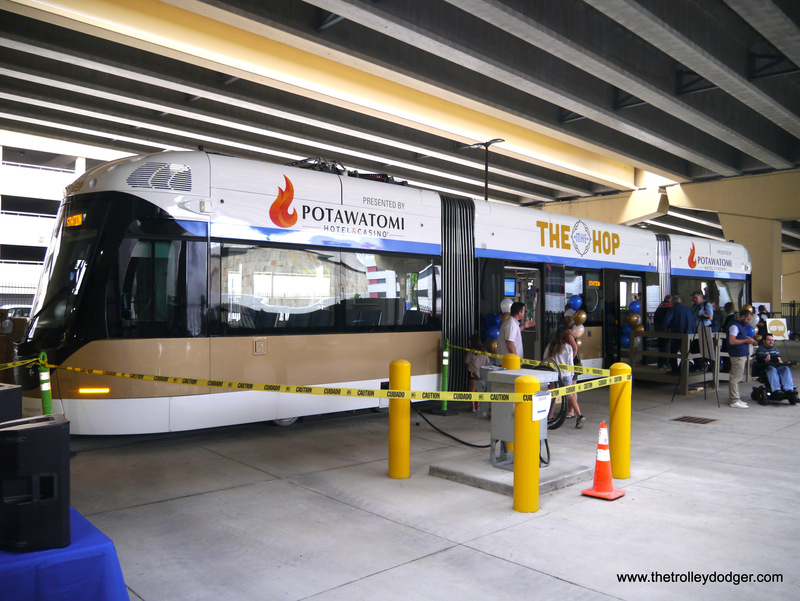 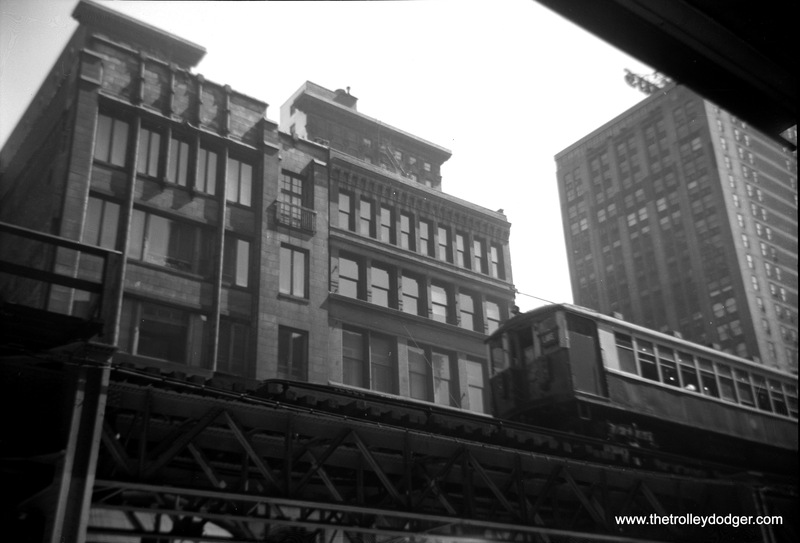 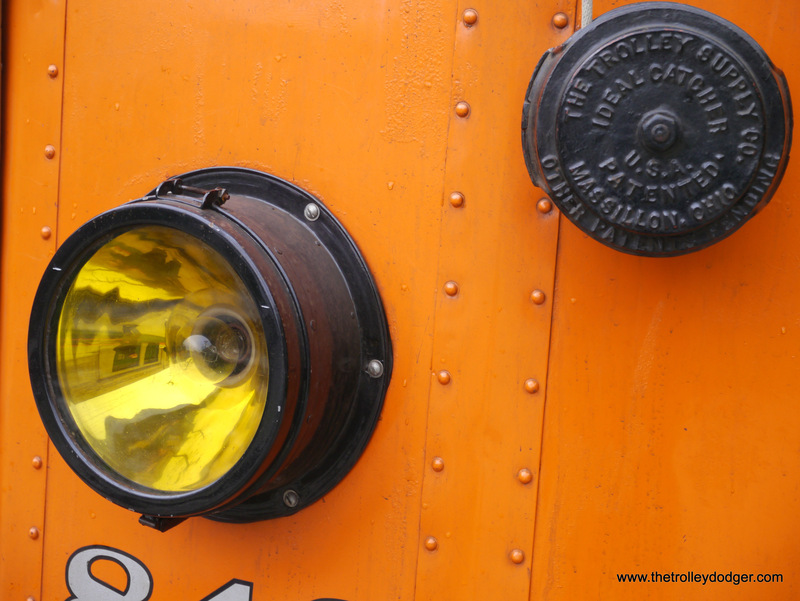 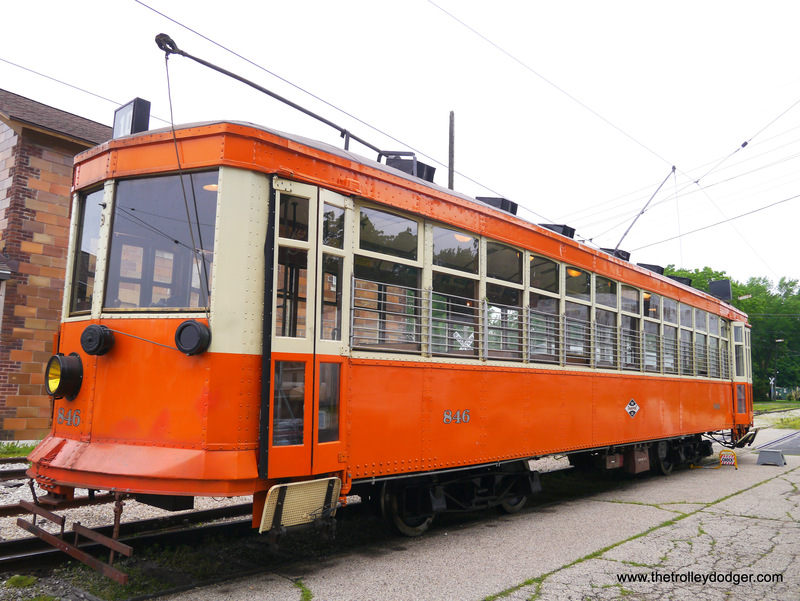 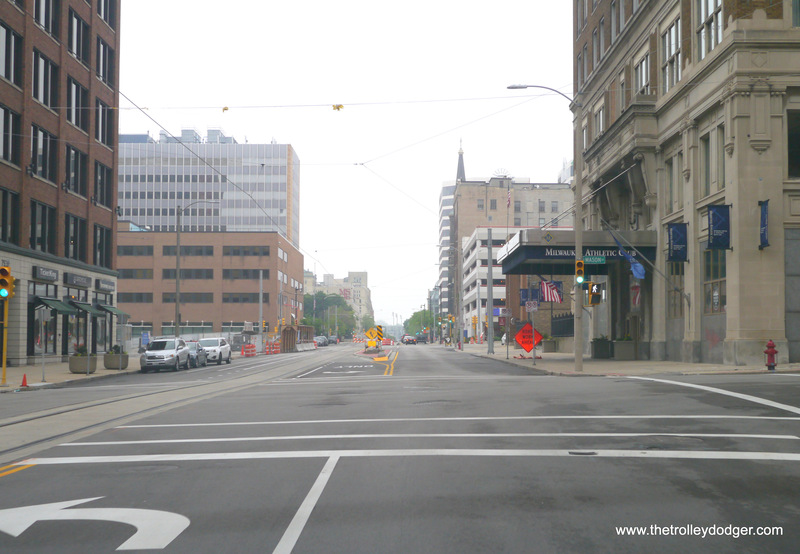 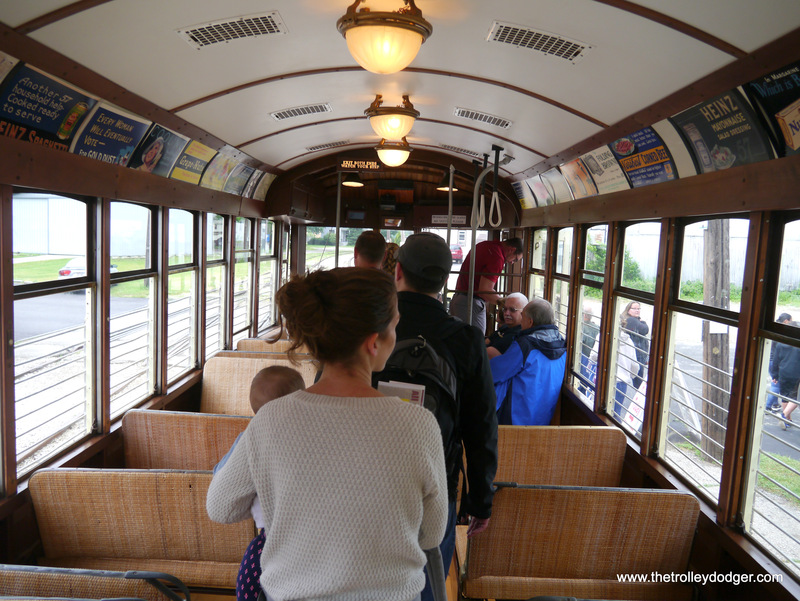 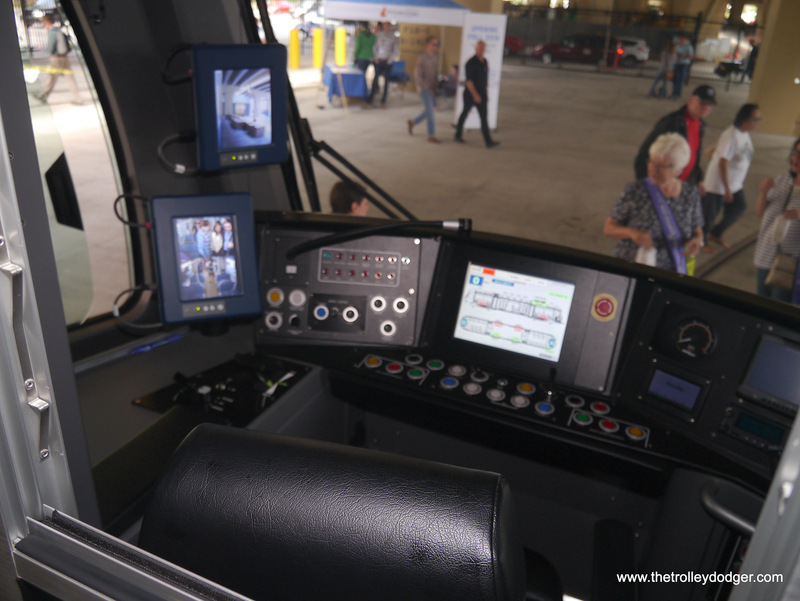 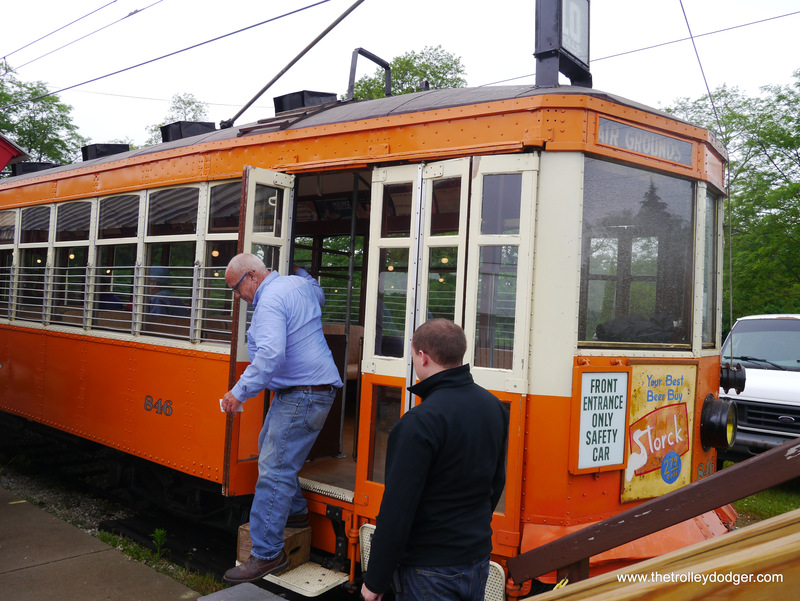 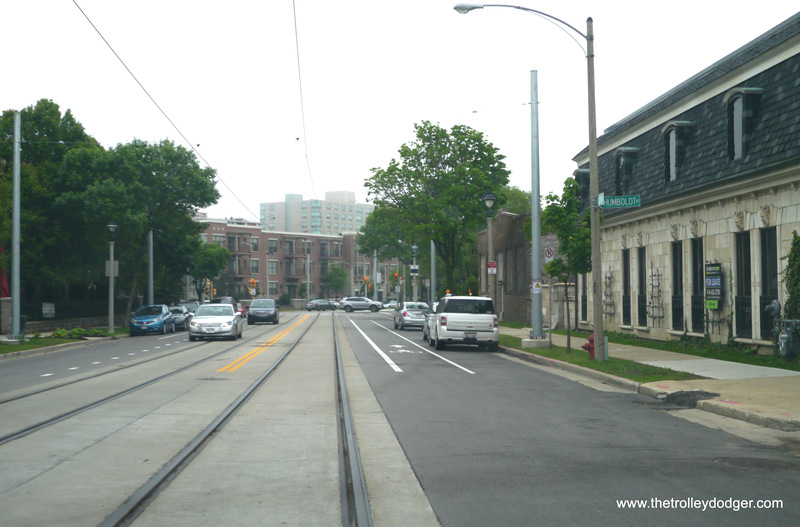 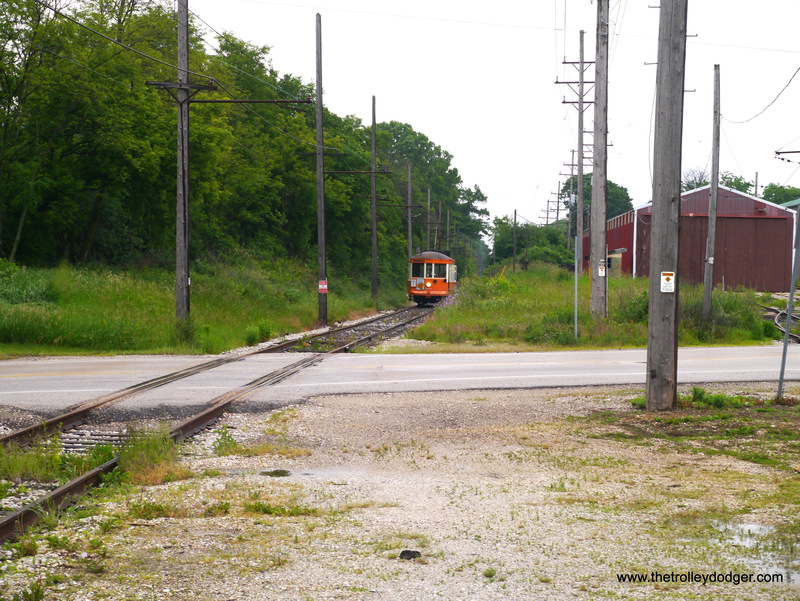 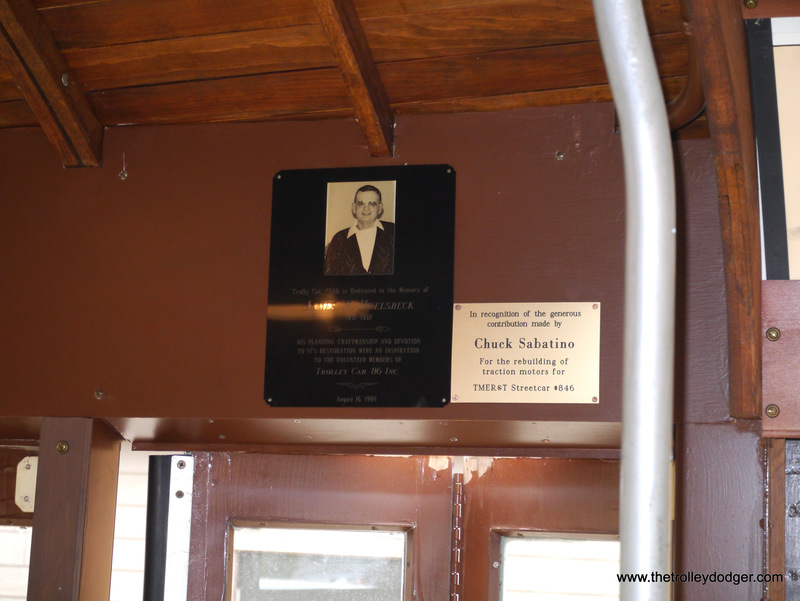 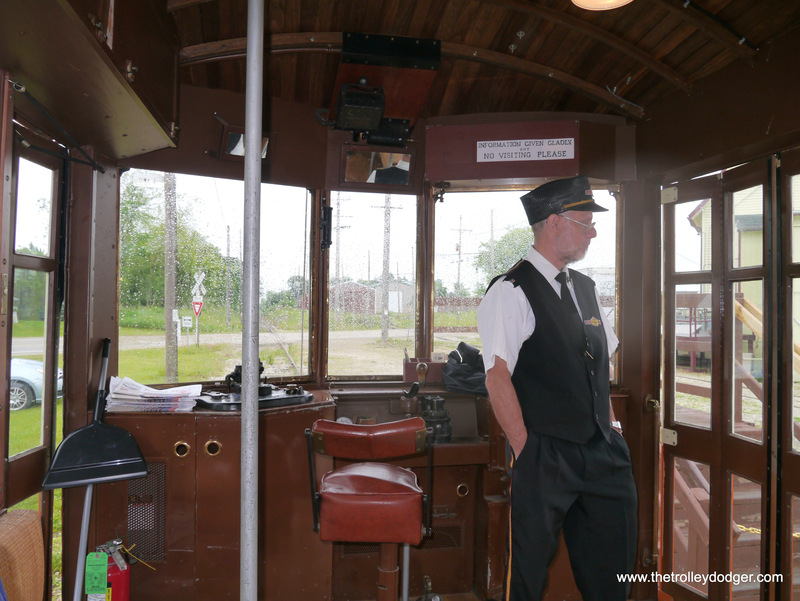 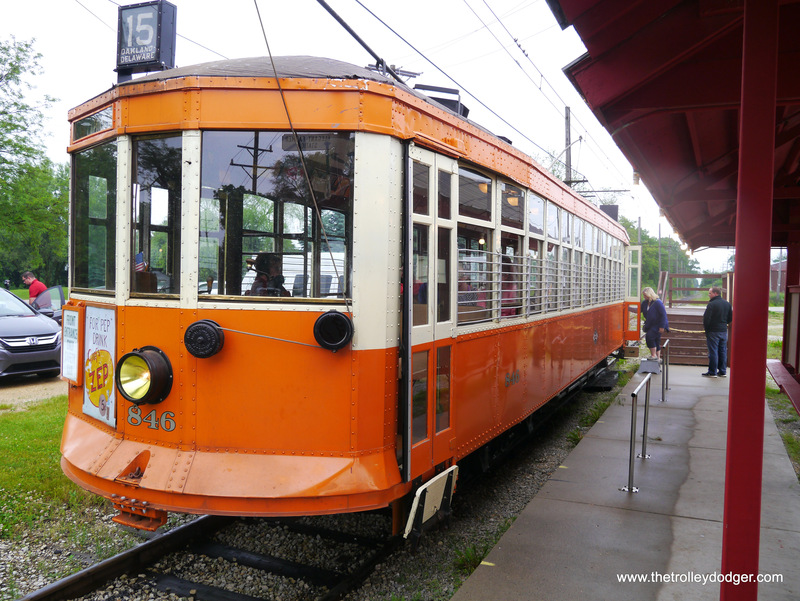 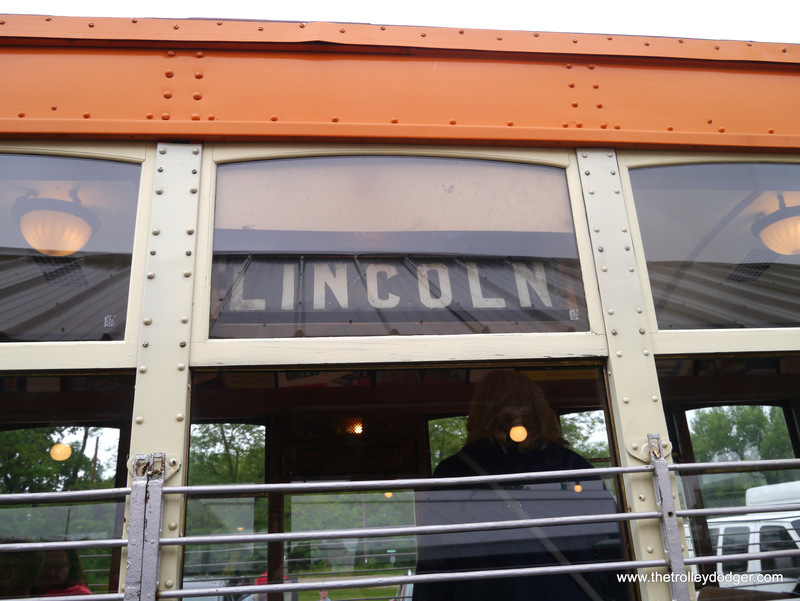 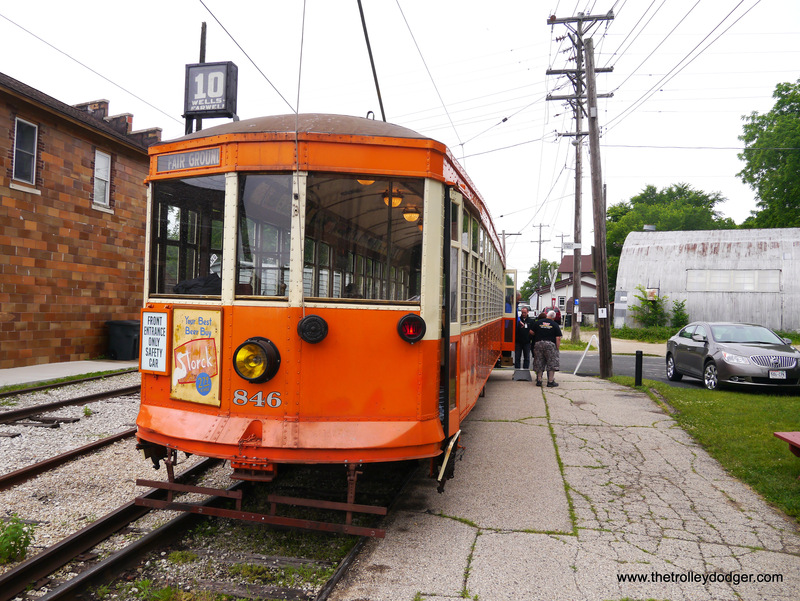 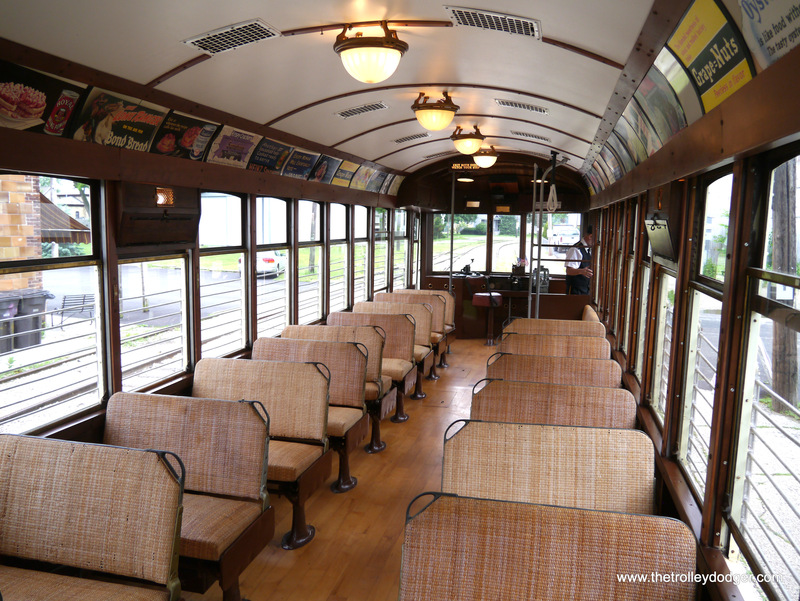 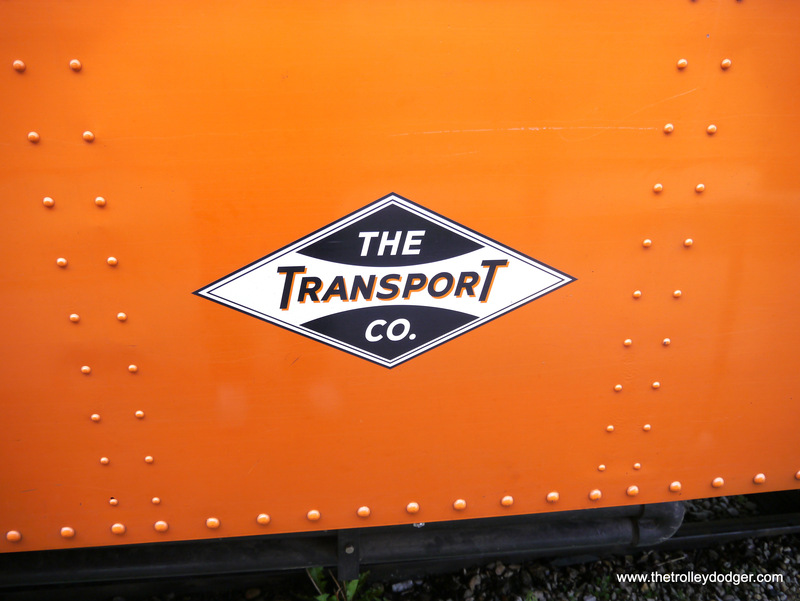 Finally, on Sunday the 10th, we journeyed to the East Troy Electric Railroad, where we were fortunate to ride Milwaukee streetcar #846 for the first time. 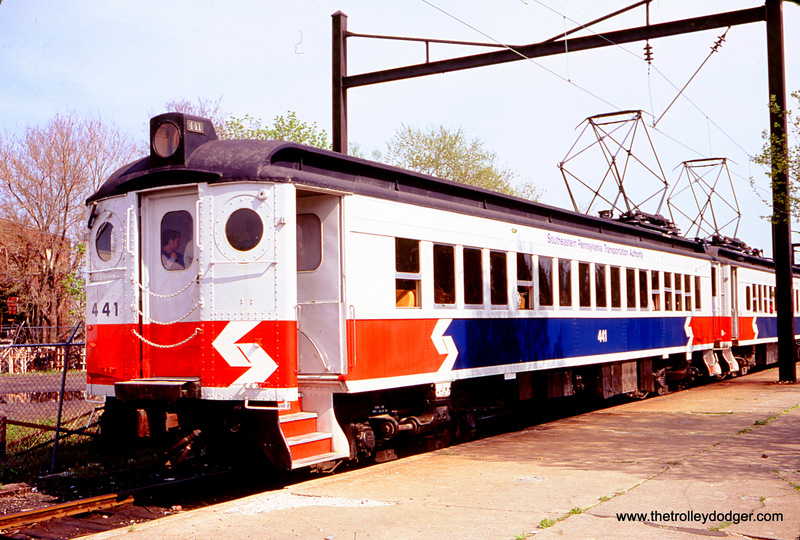 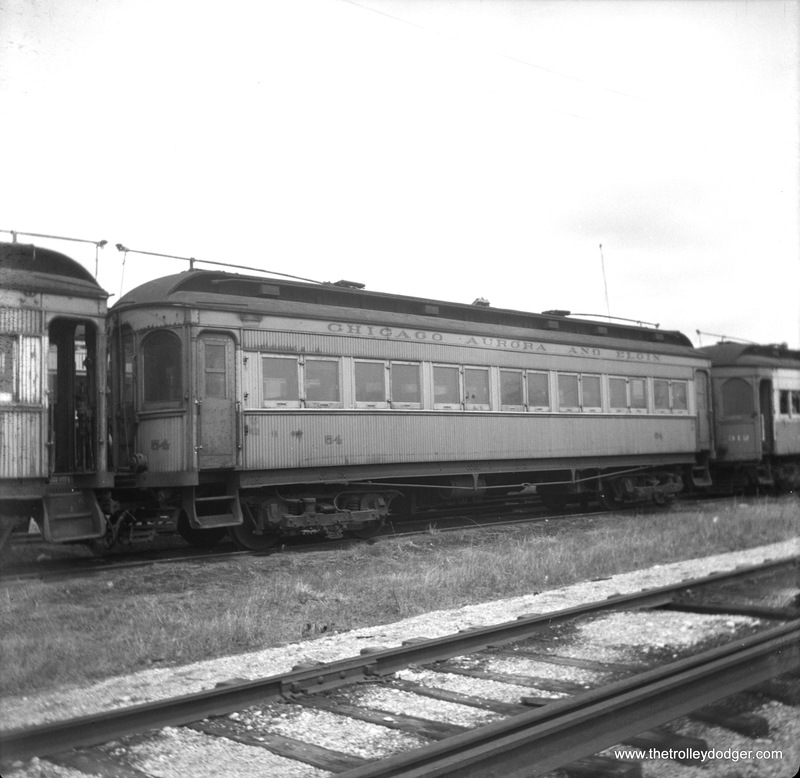 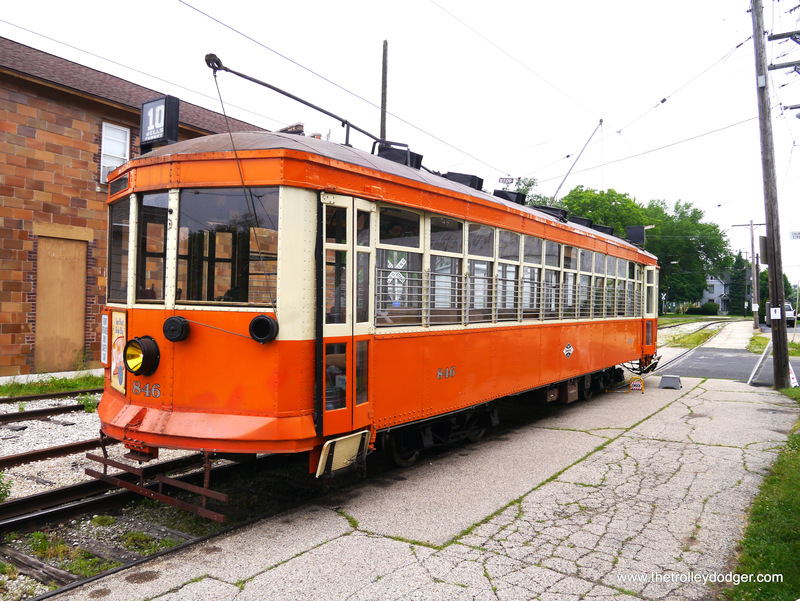 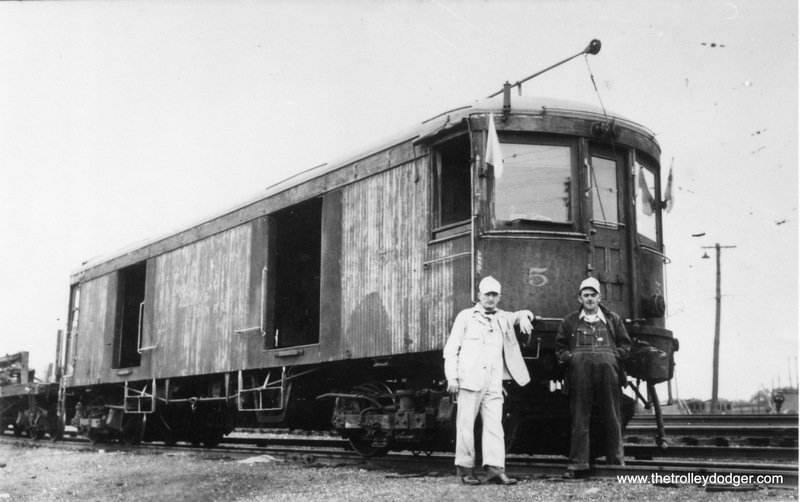 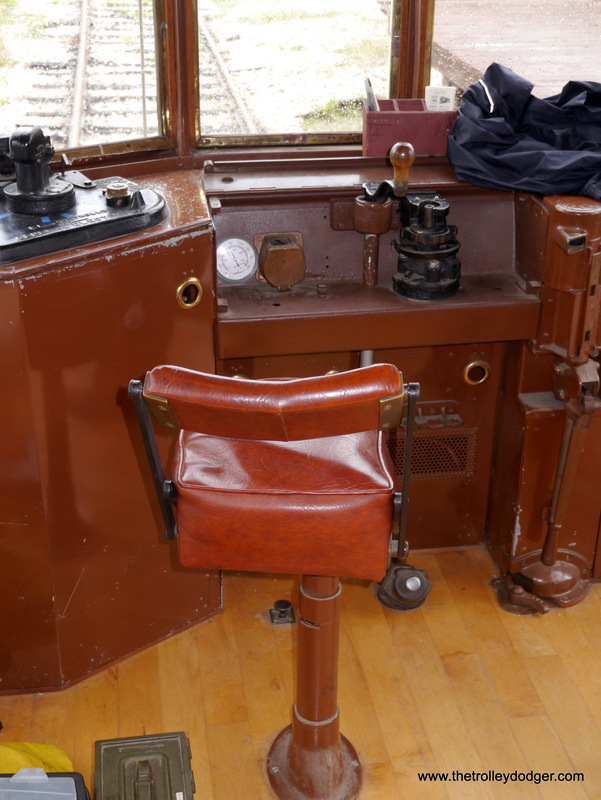 While 60 years may separate the running of the old and the new, there’s nearly a century between lightweight “safety” car 846, built by St. Louis Car Company in 1920, and its modern equivalent. 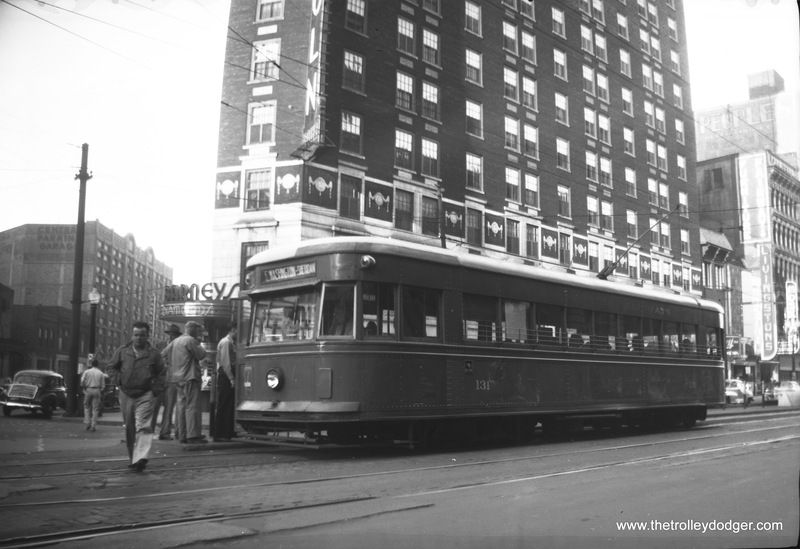 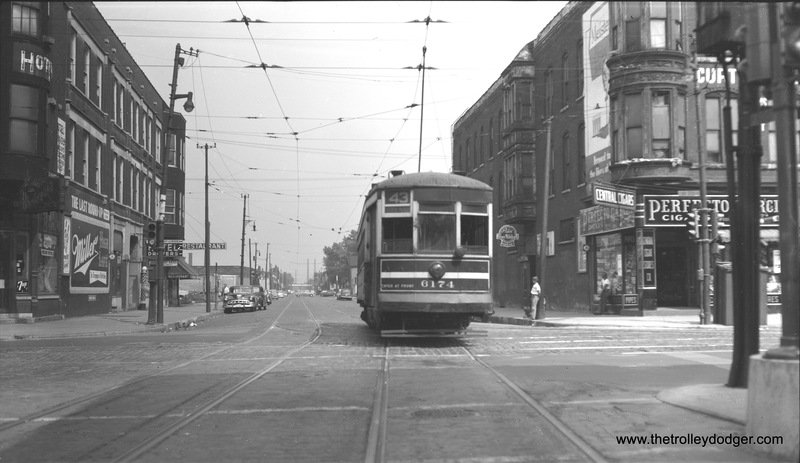 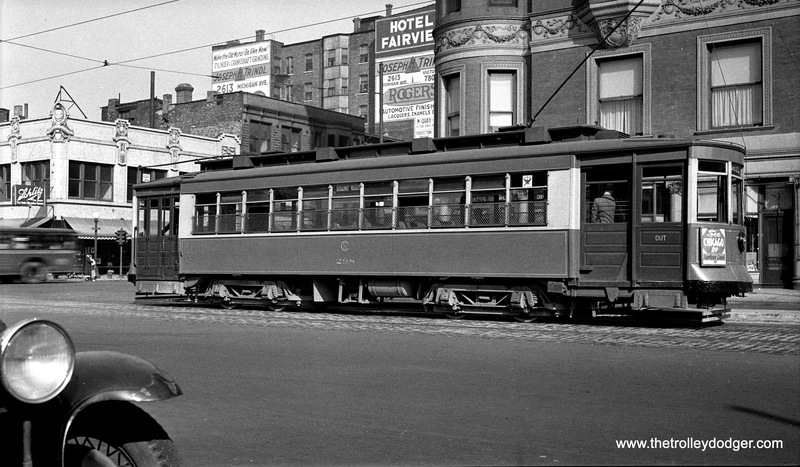 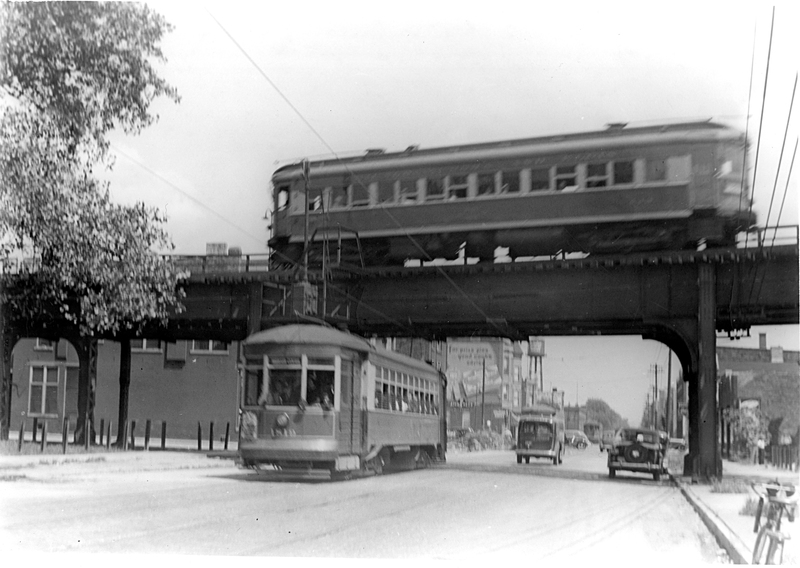 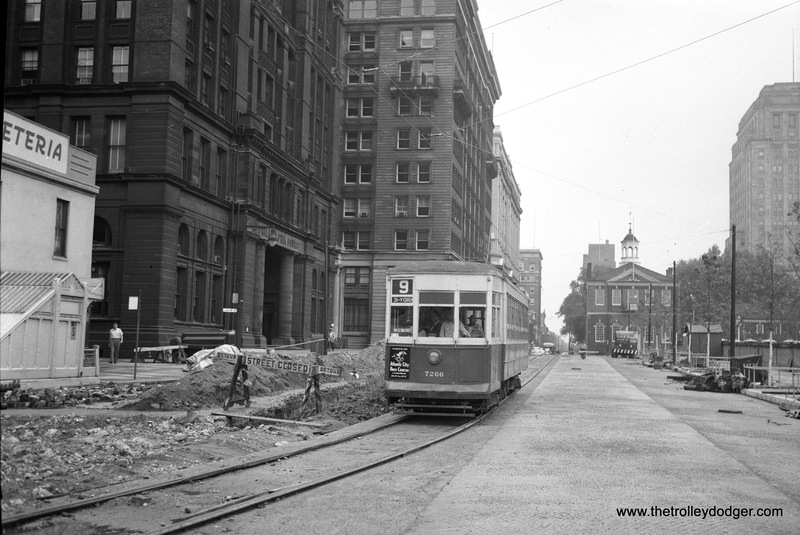 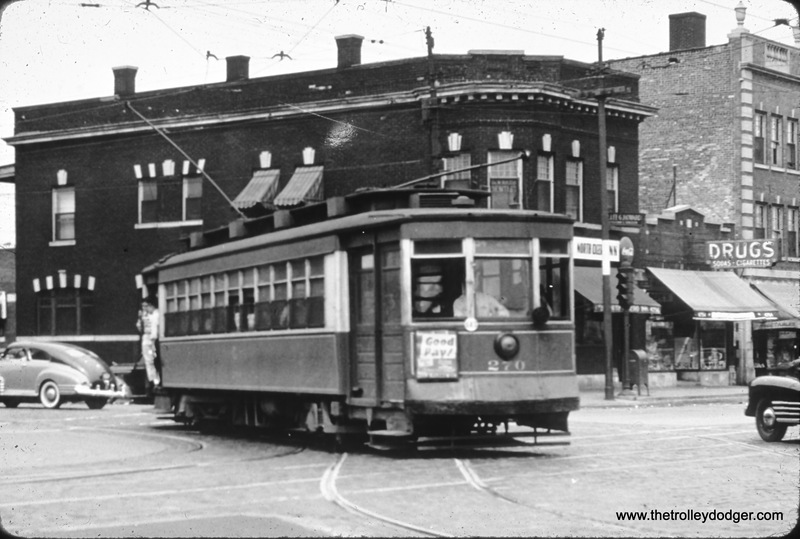 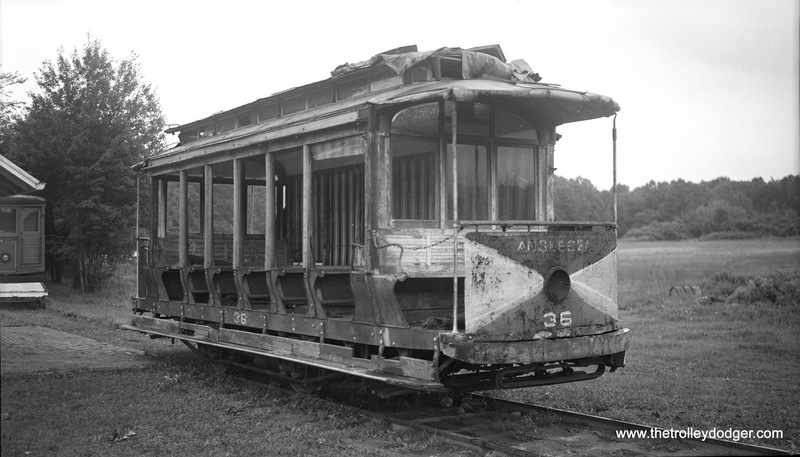 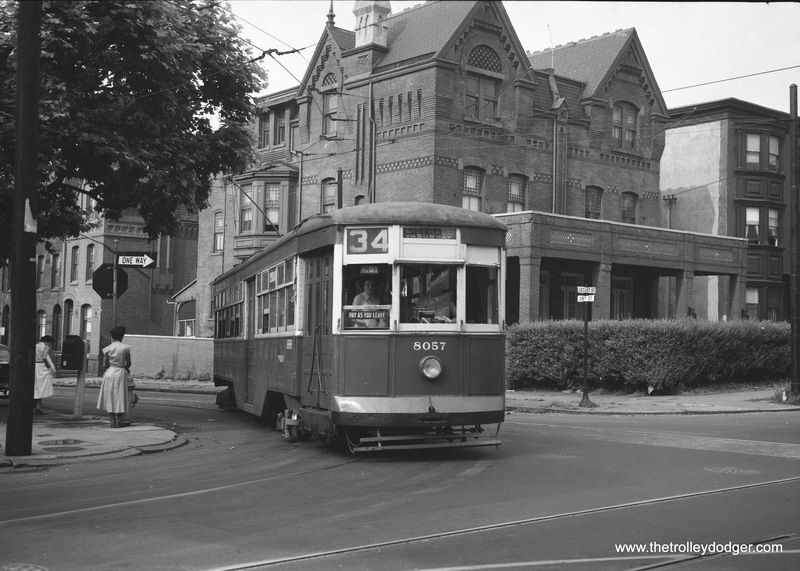 That just goes to show how much our expectations of what a streetcar should be have changed and grown over the last 100 years. 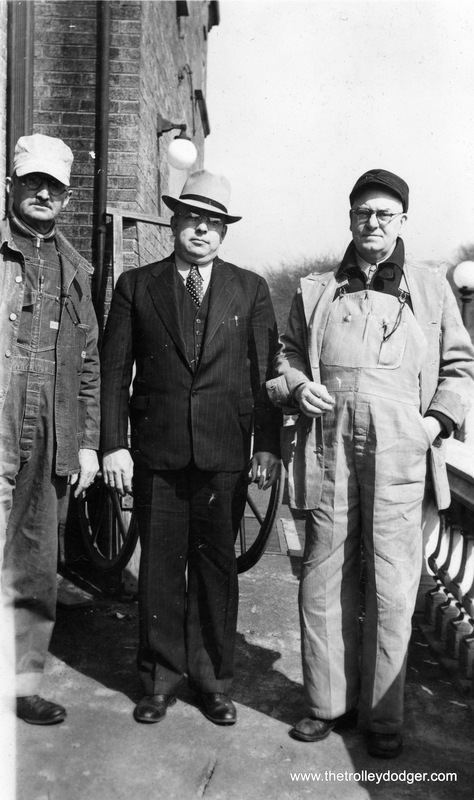 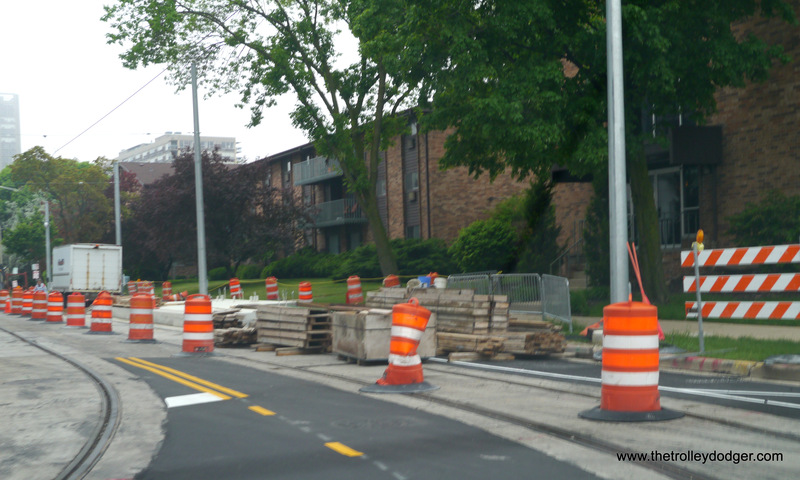 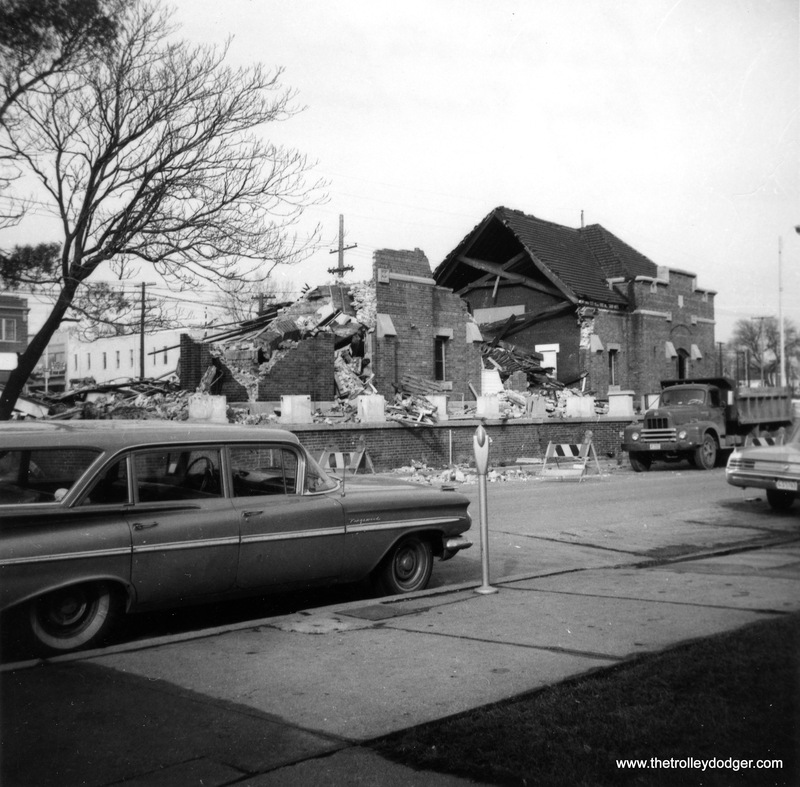 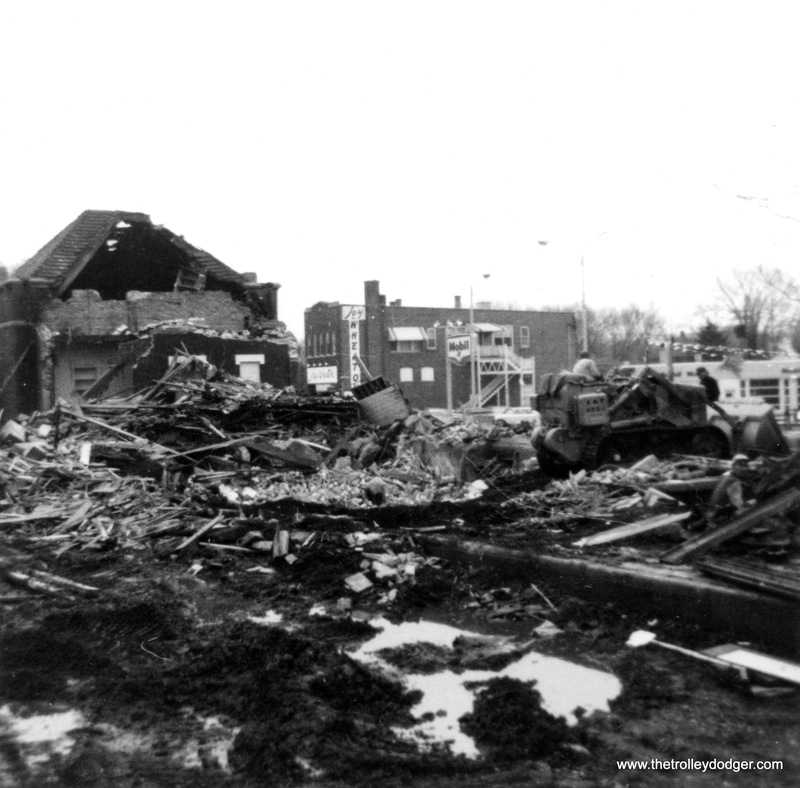 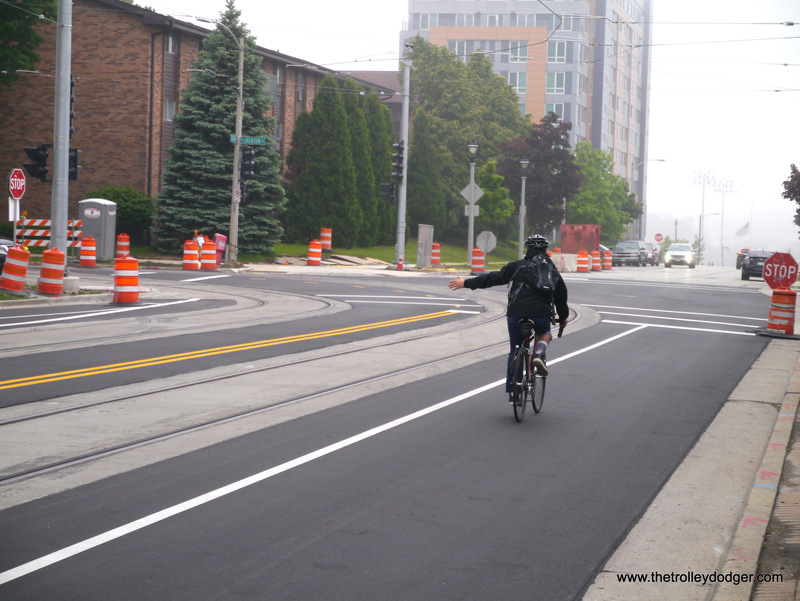 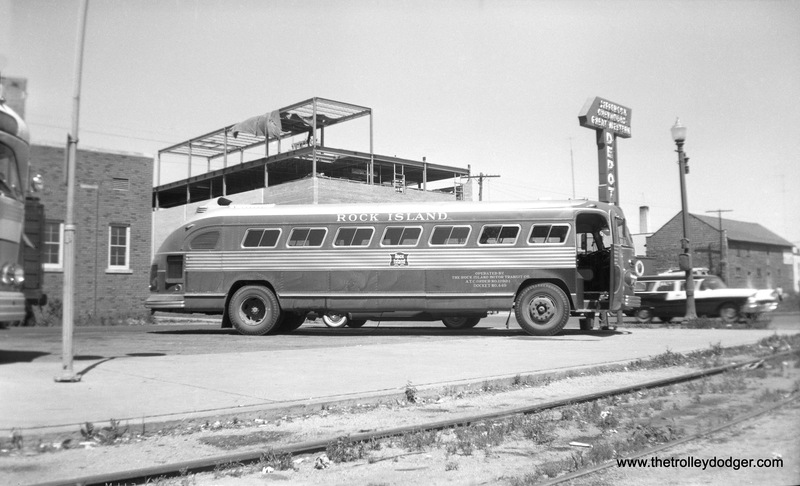 We expect better safety, performance, comfort, and accessibility than our grandparents and great-grandparents did. 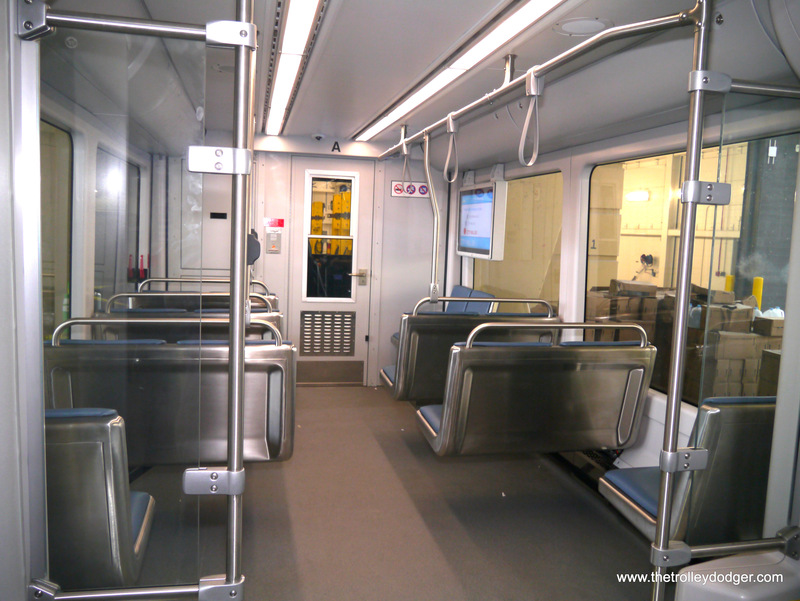 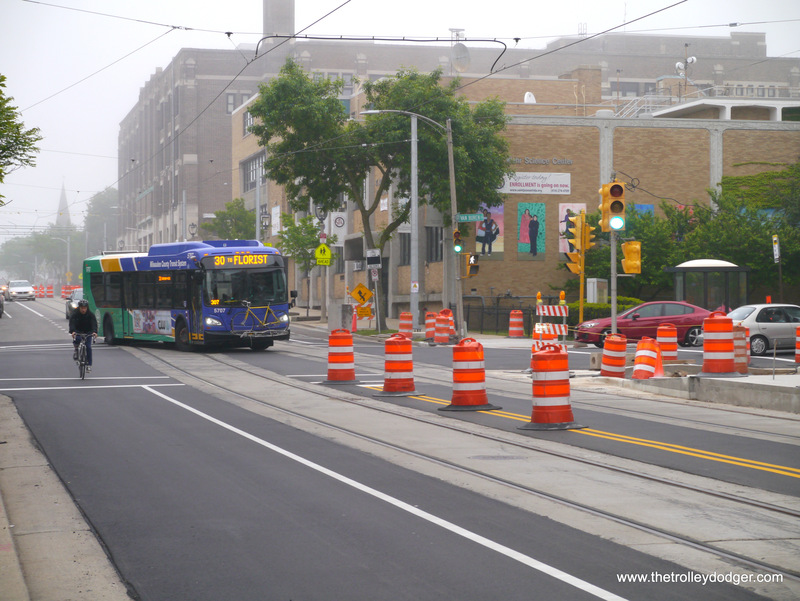 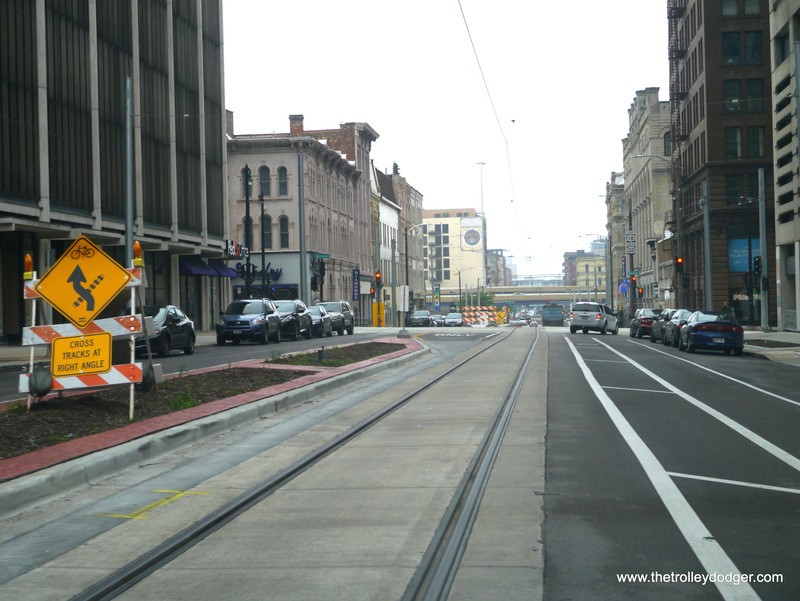 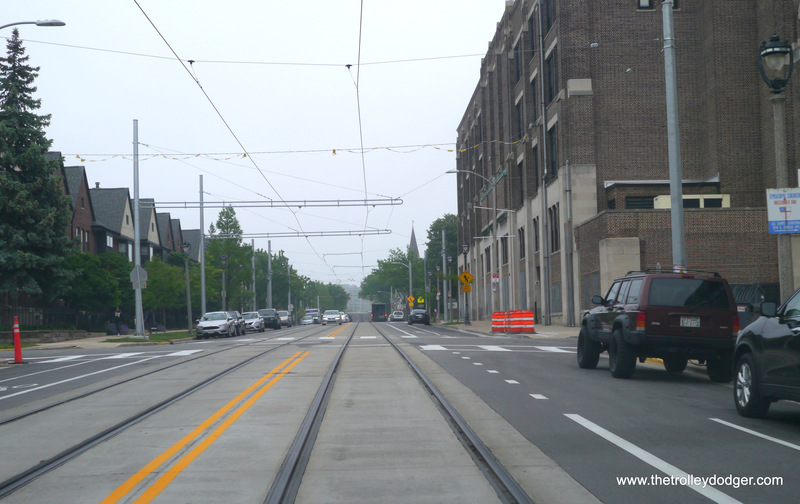 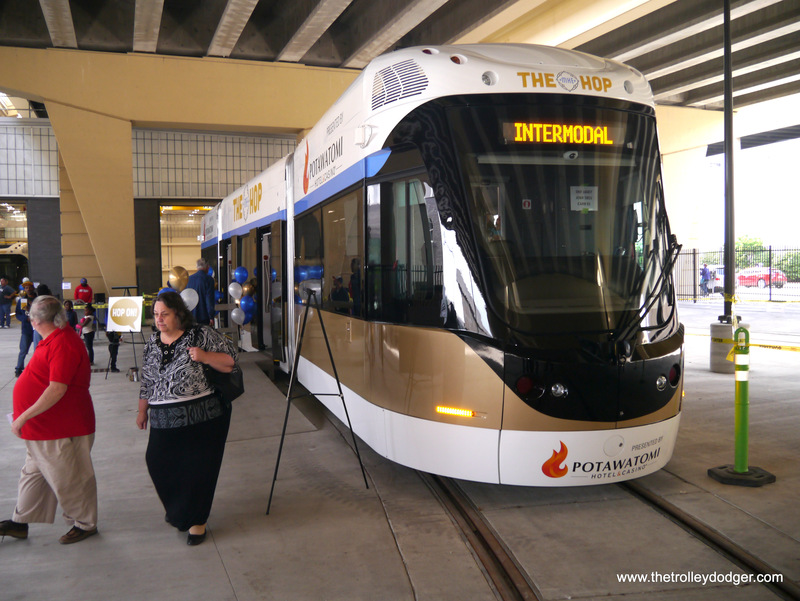 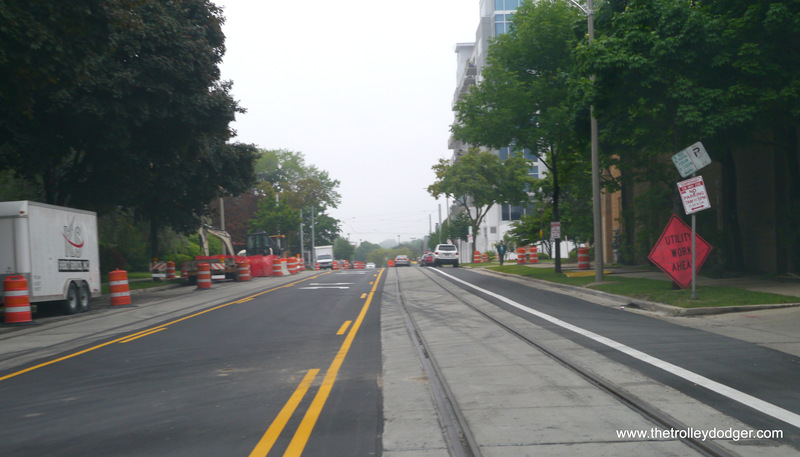 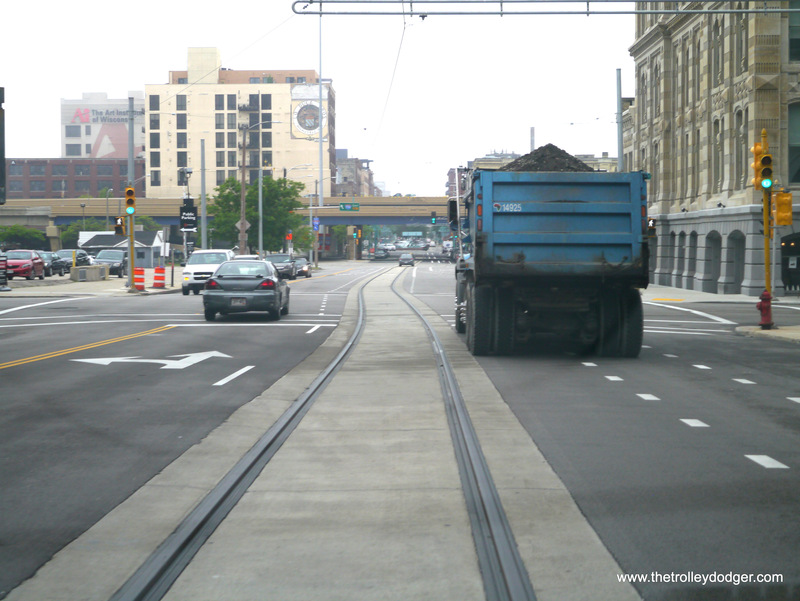 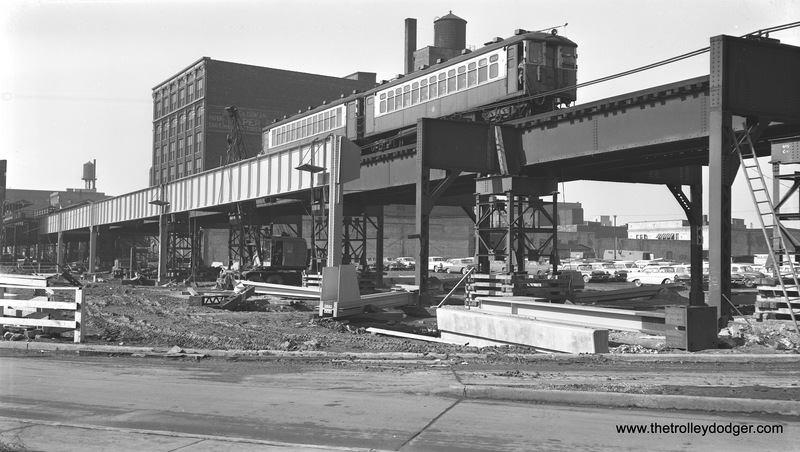 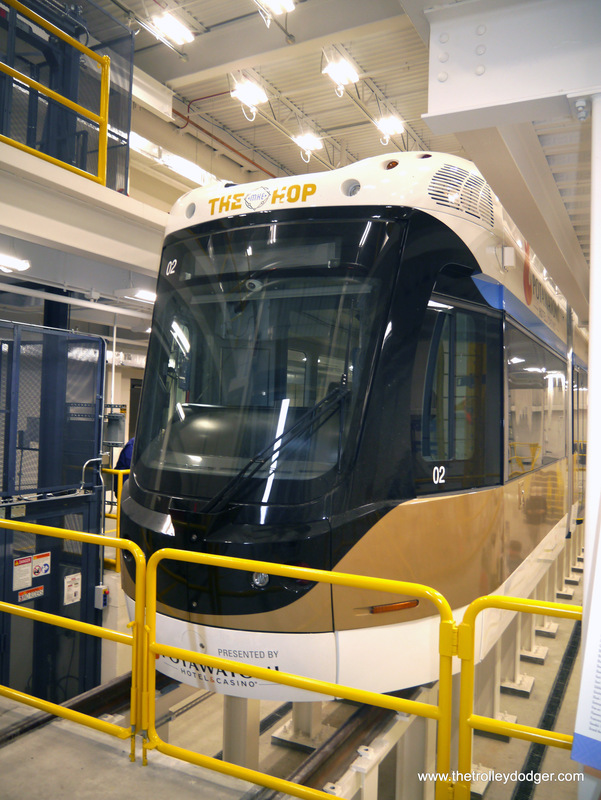 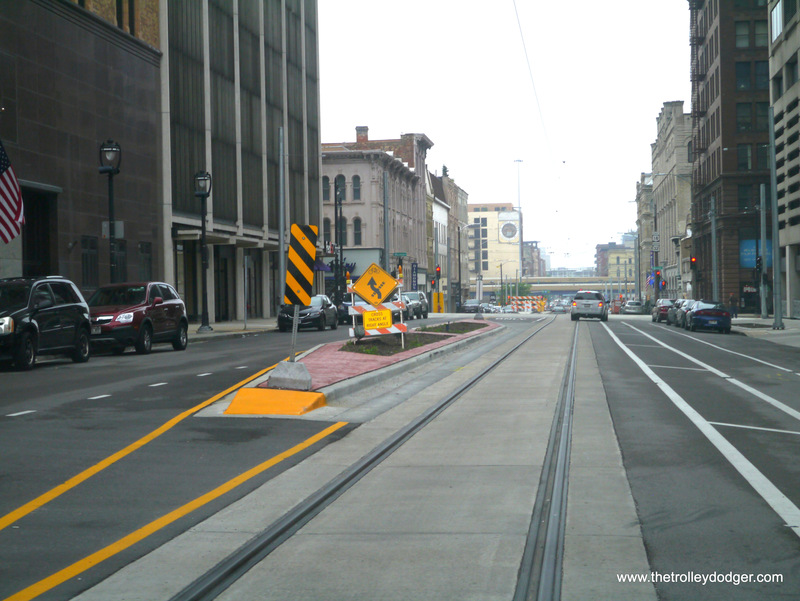 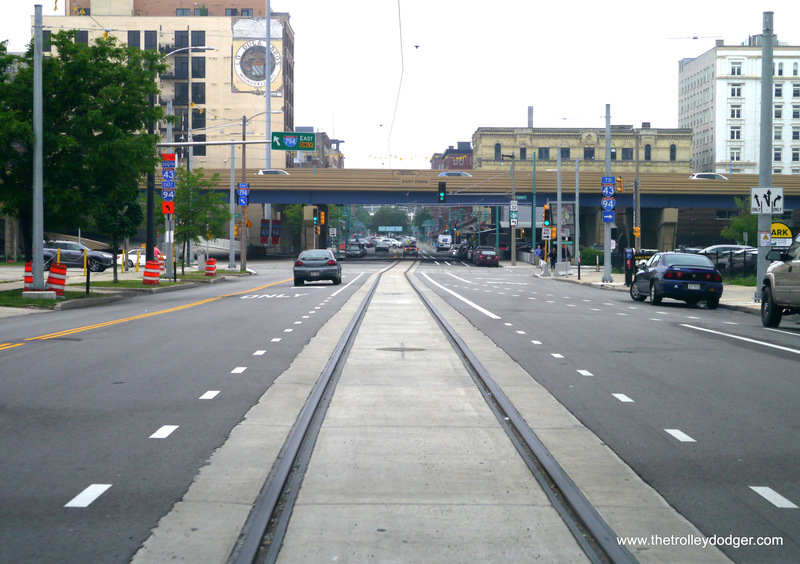 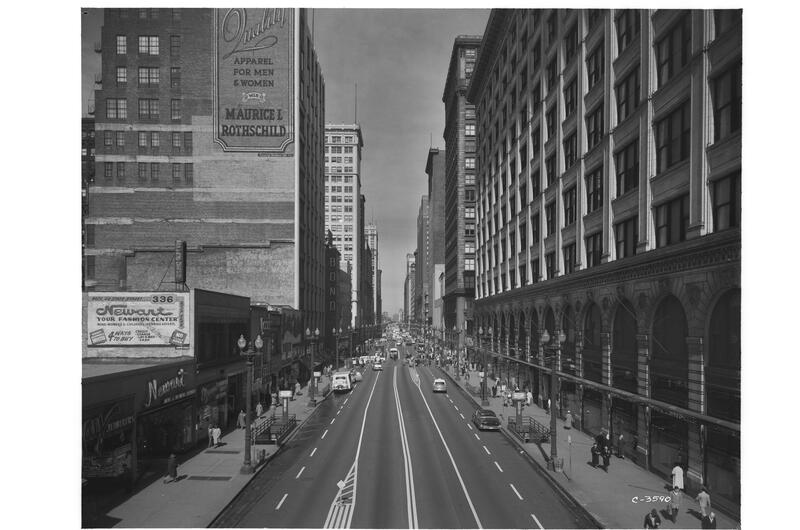 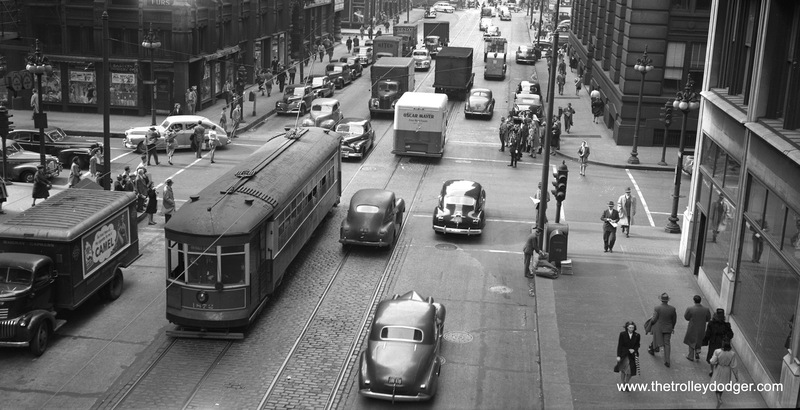 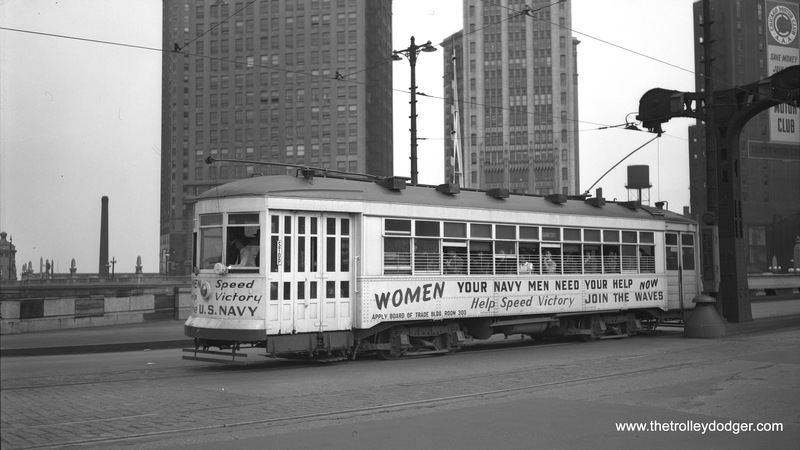 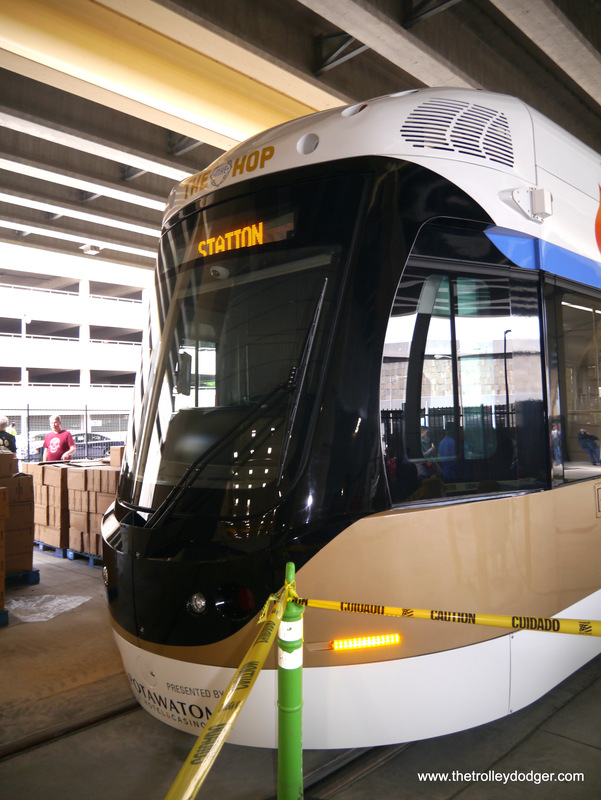 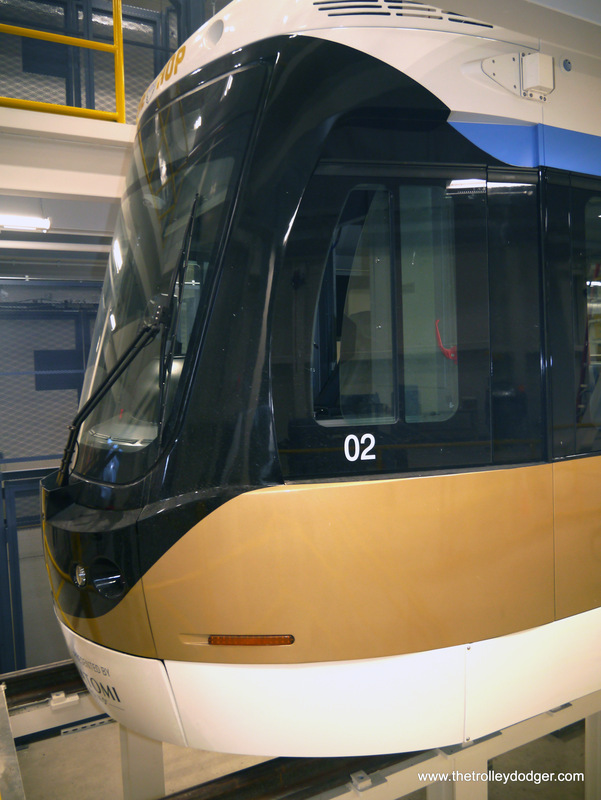 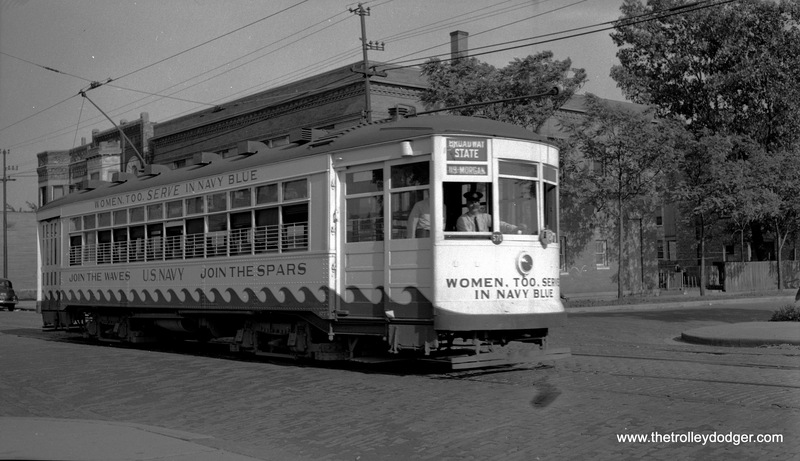 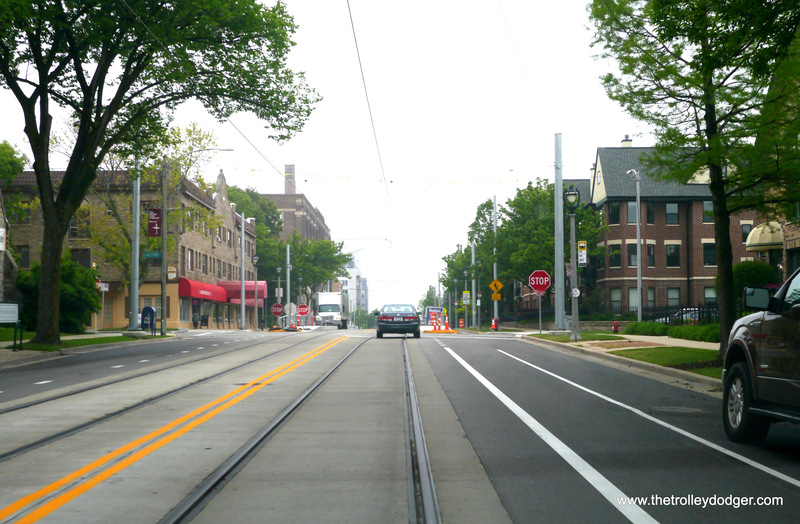 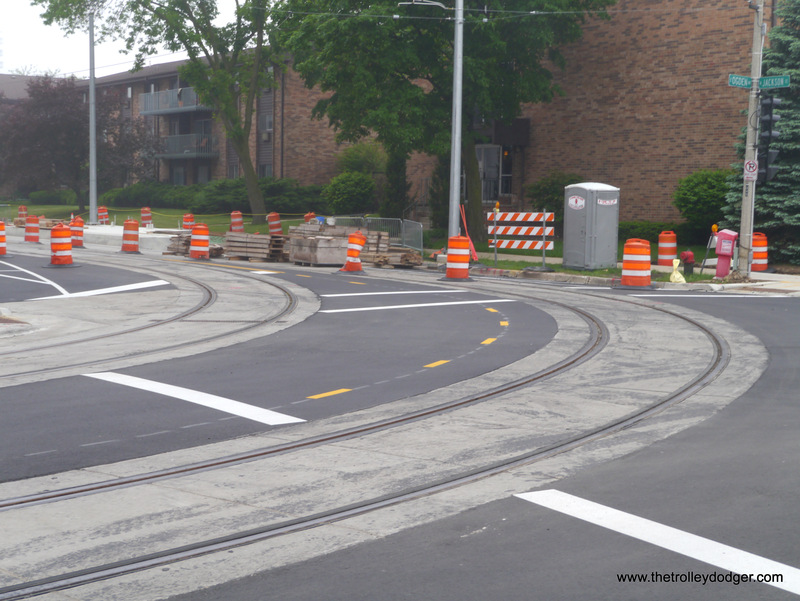 When the new Milwaukee streetcar was first proposed, there were plenty of nay-sayers who thought it was a useless idea, didn’t go anywhere, was pointless, and that no one would ride it. 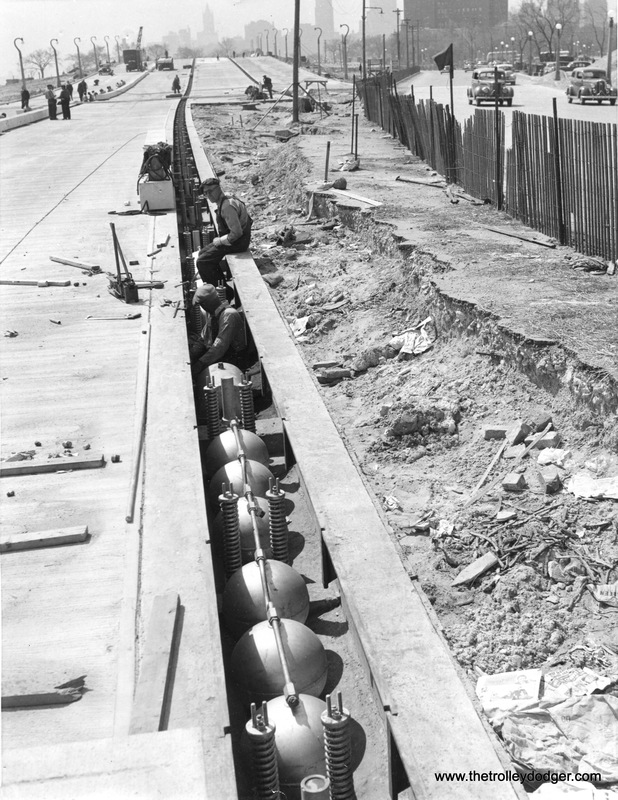 But as the time draws near to actual operations, many of these same people have changed their tune. 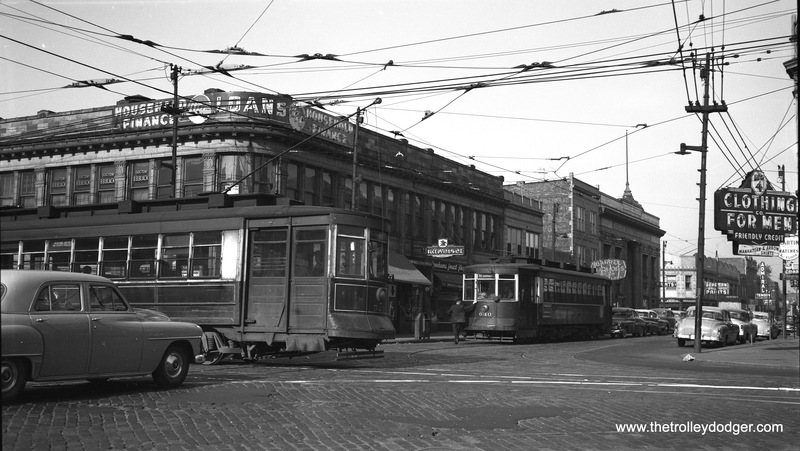 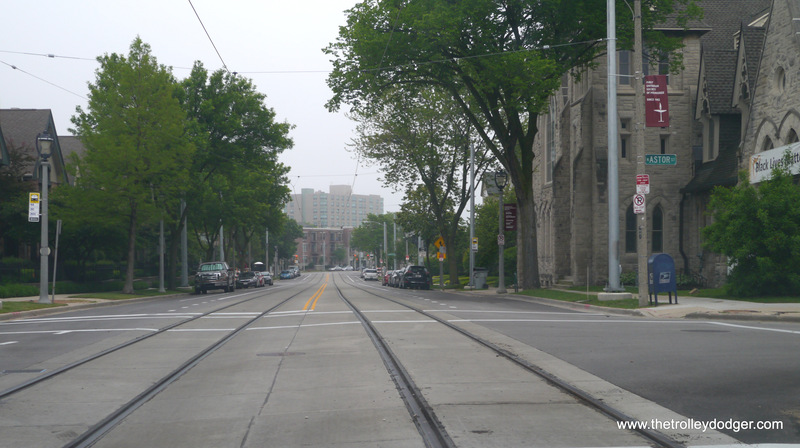 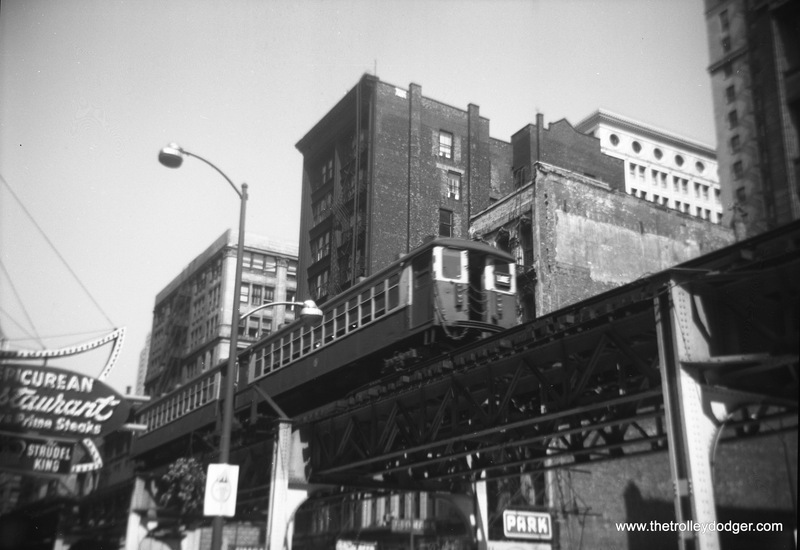 While modern streetcar lines may not work for all cities, or even some cities that have started them, I feel confidant that Milwaukee’s will be successful. 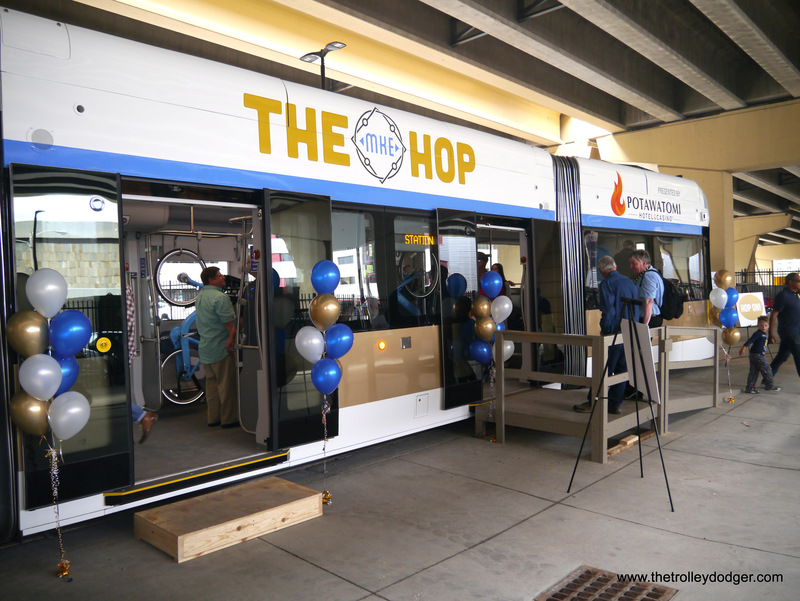 PS- Our congratulations go out to Russ Schultz, who has for some years been driving a bus for the Milwaukee public transit system. 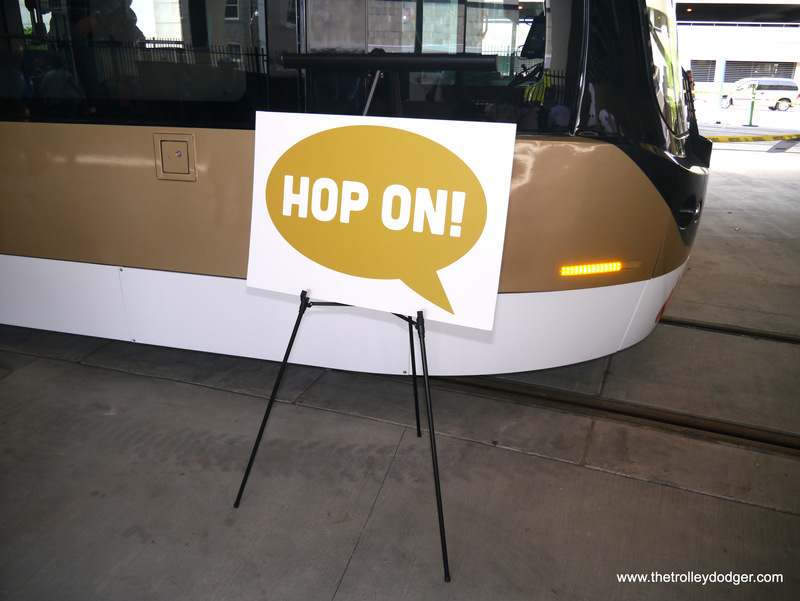 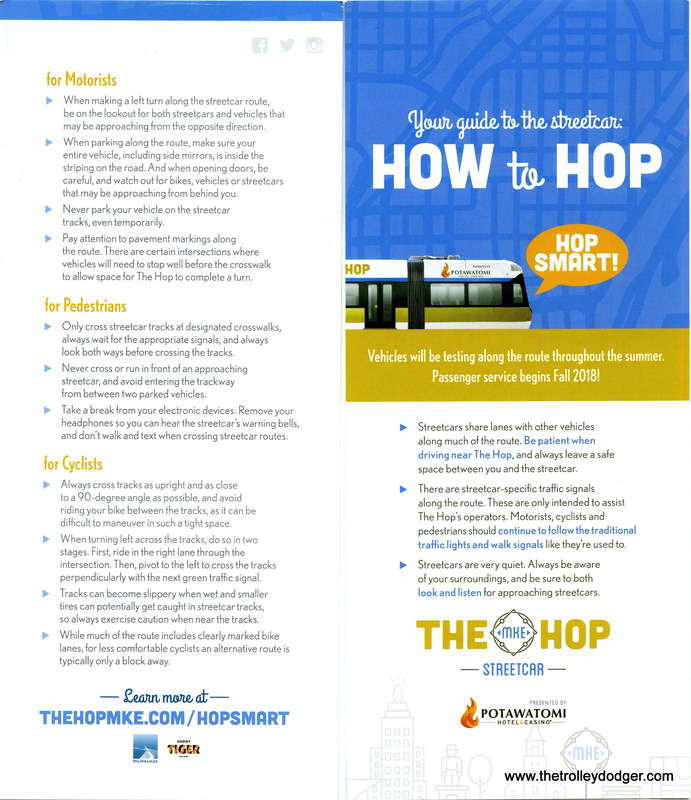 He will now cap off his career as one of The Hop’s new streetcar operators. 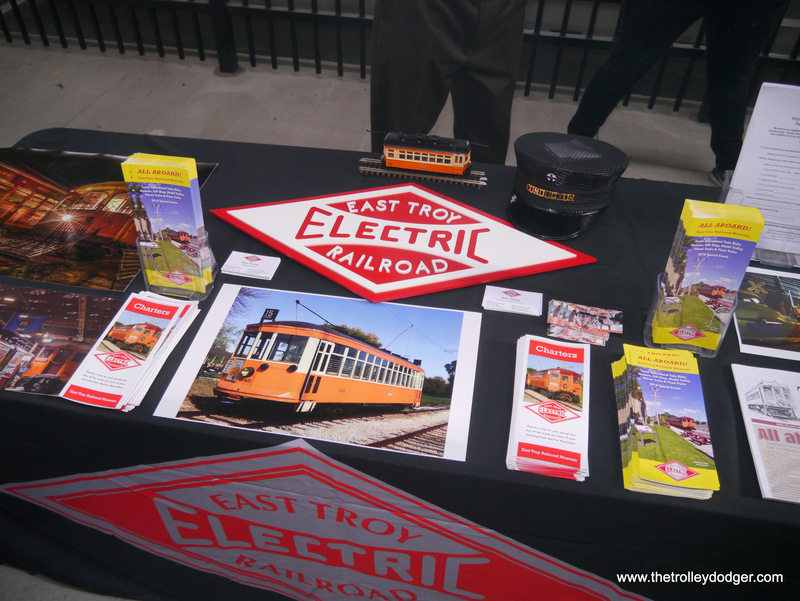 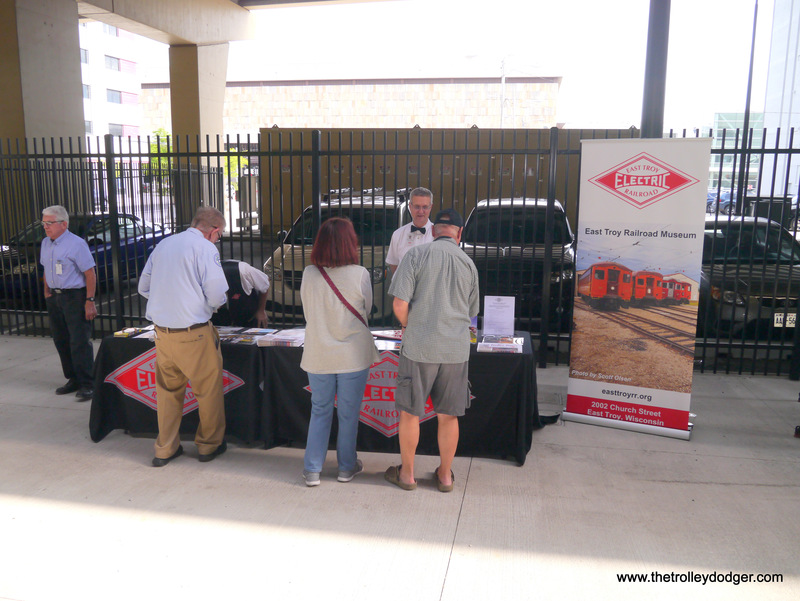 The East Troy Electric Railroad had a table at the open house. 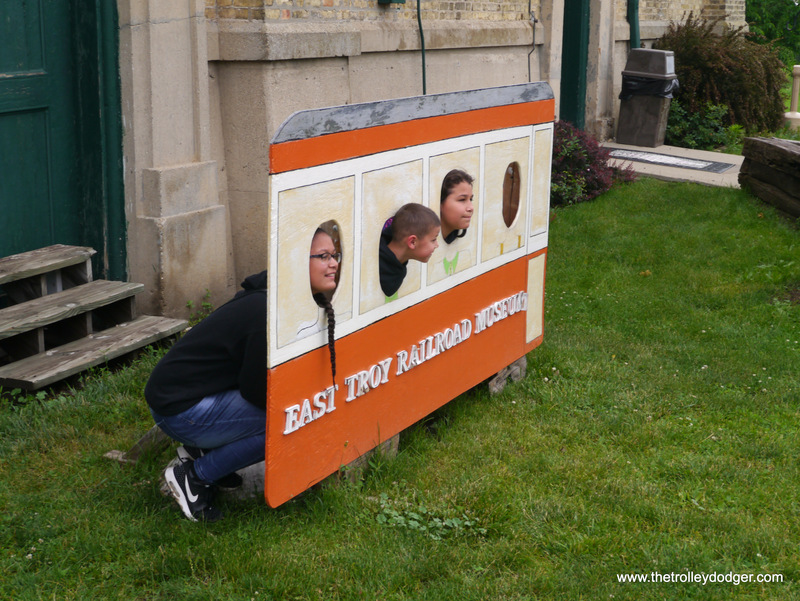 Part of the East Troy Electric Railroad display. 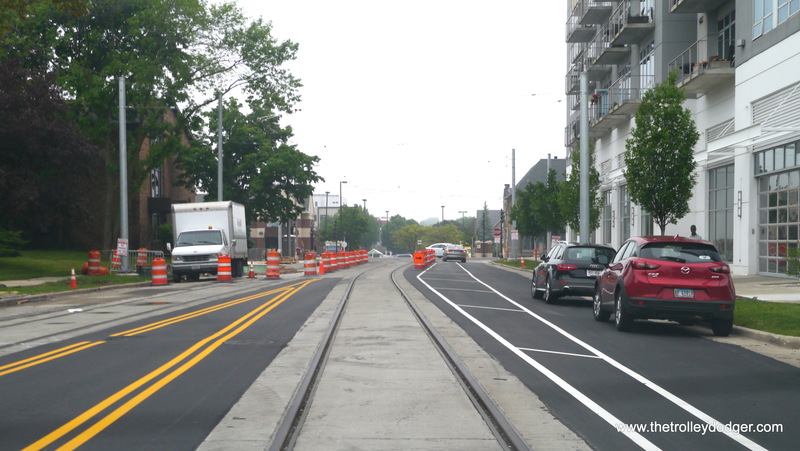 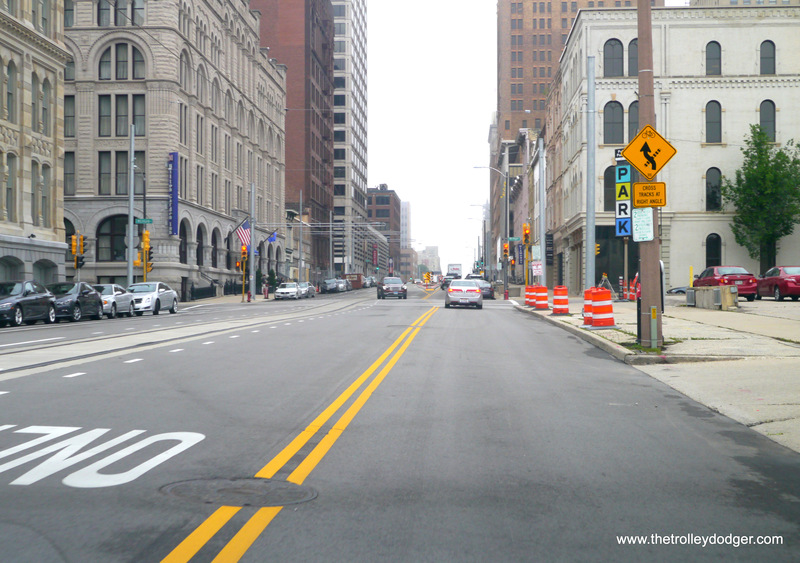 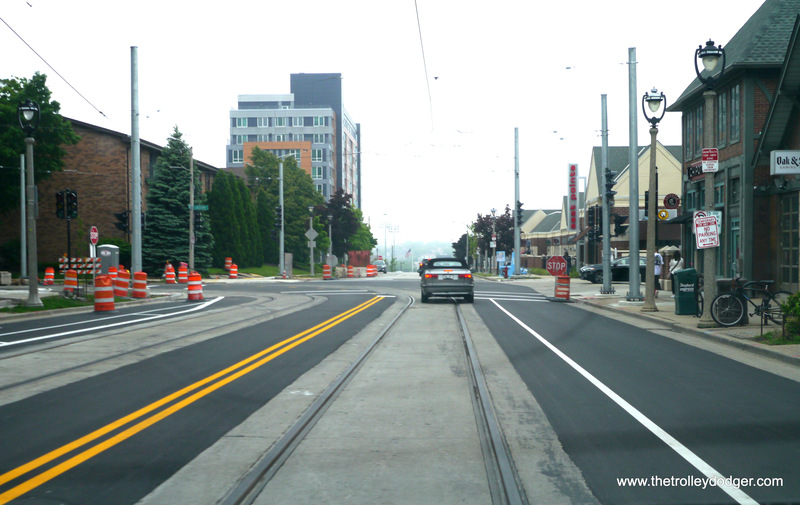 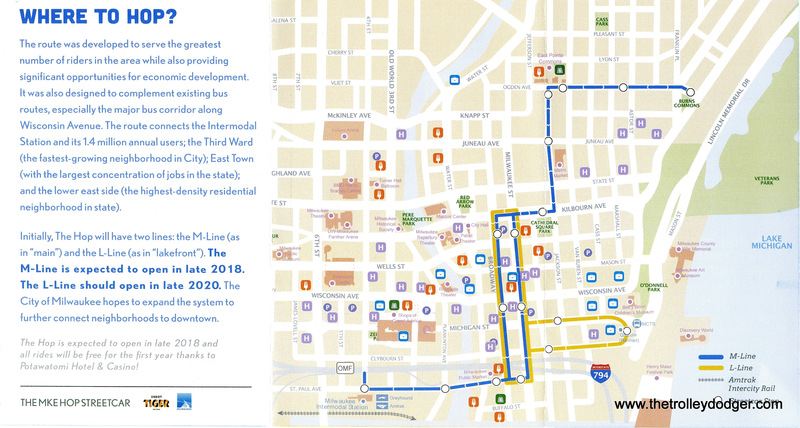 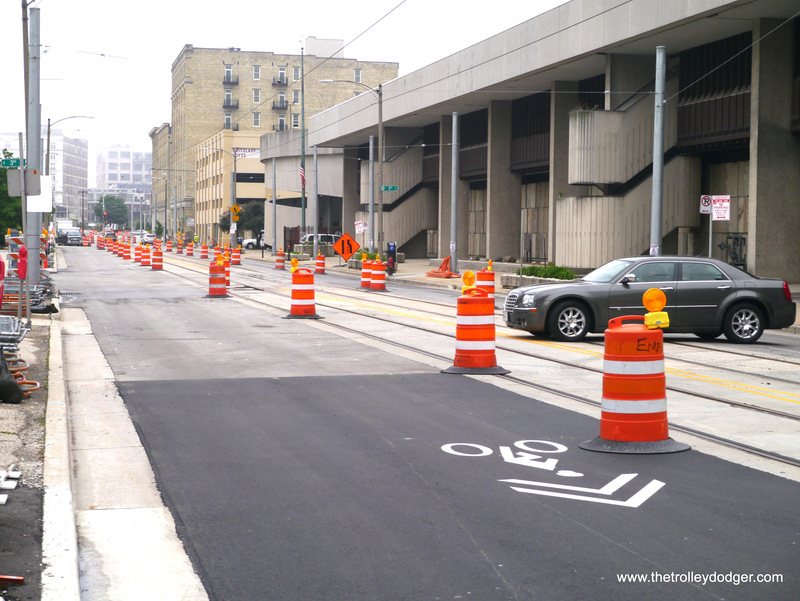 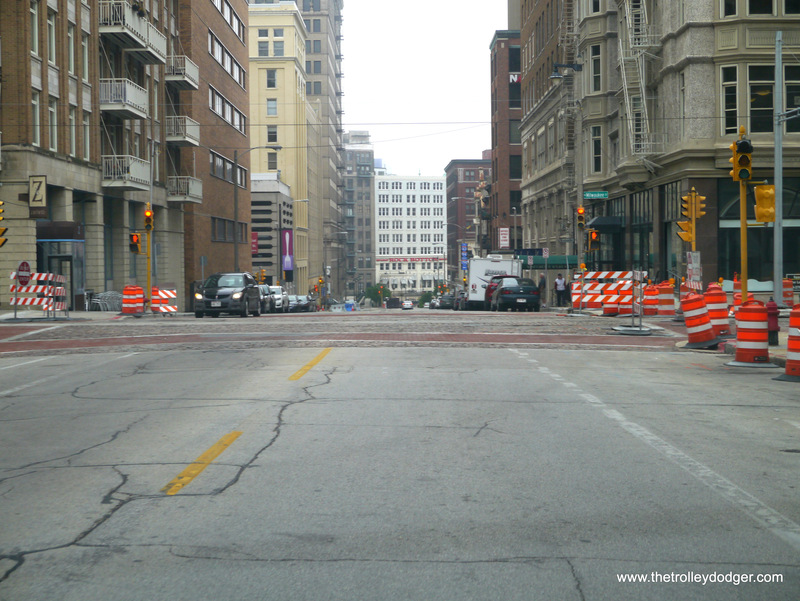 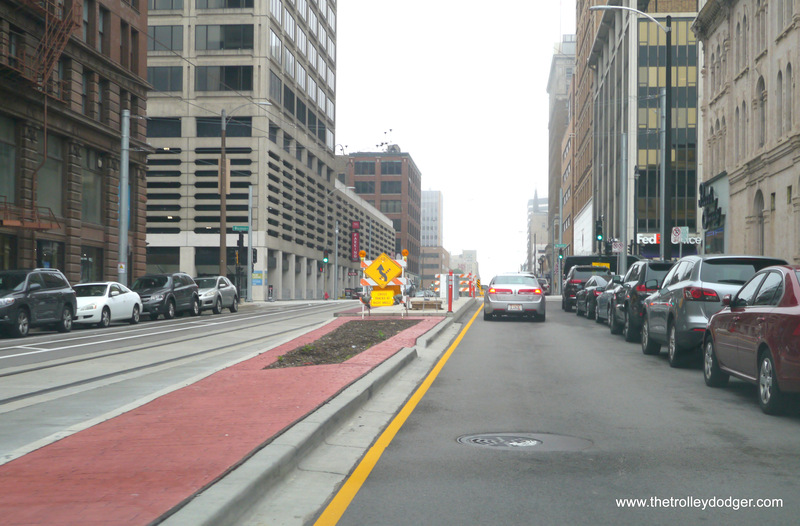 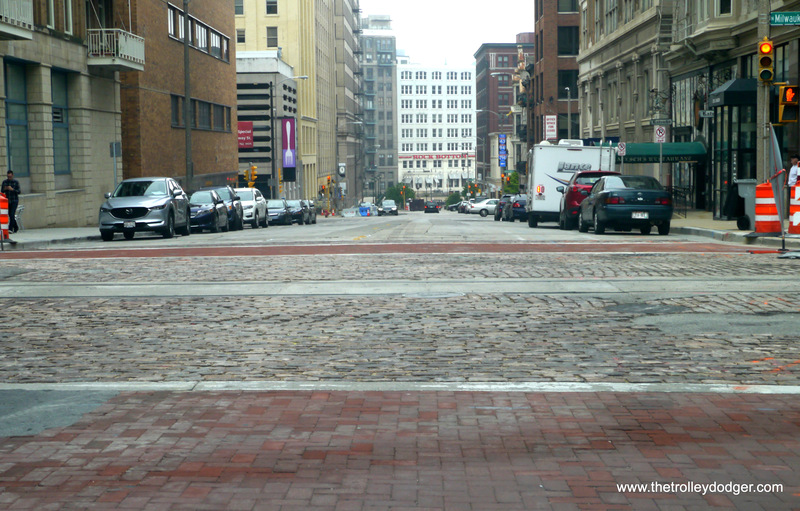 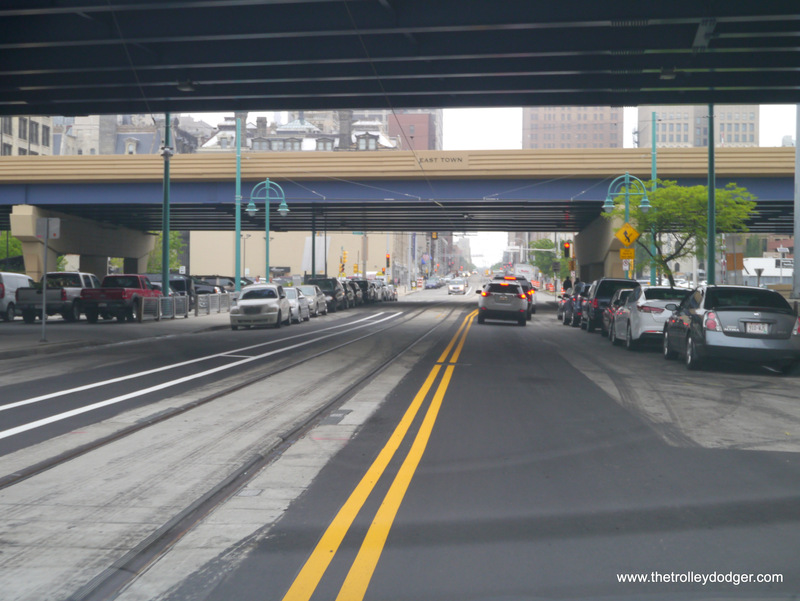 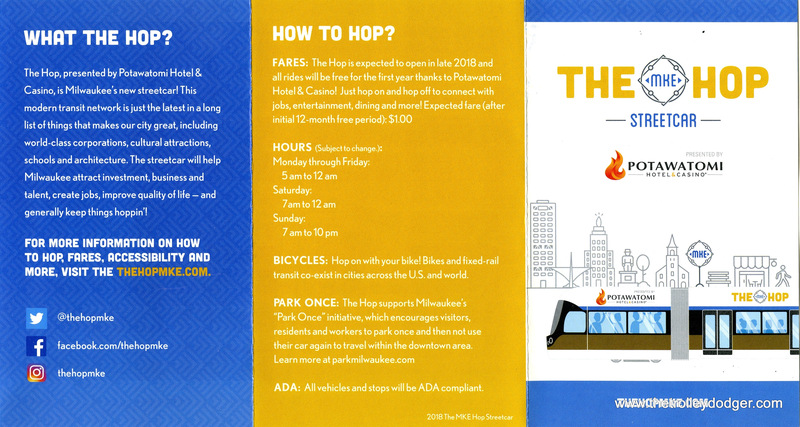 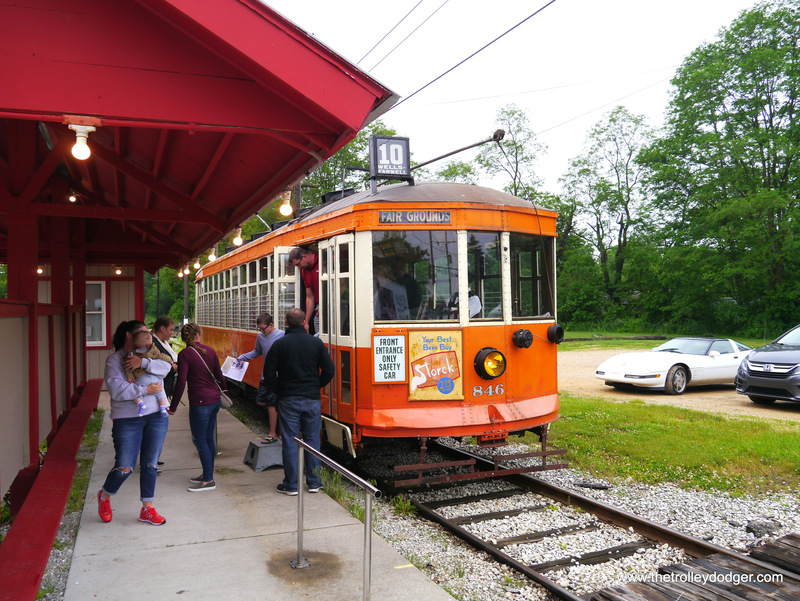 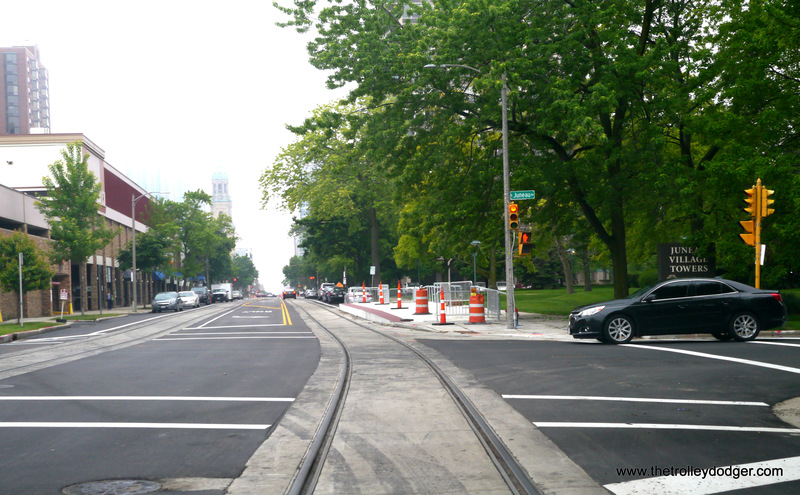 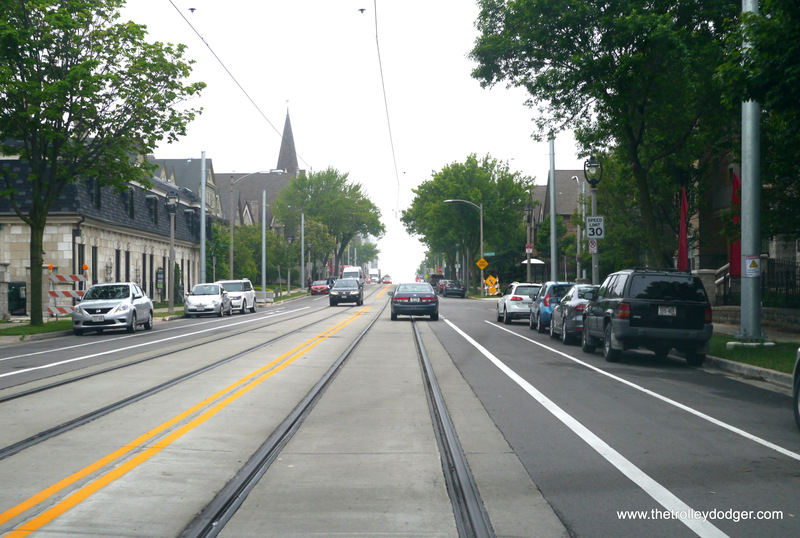 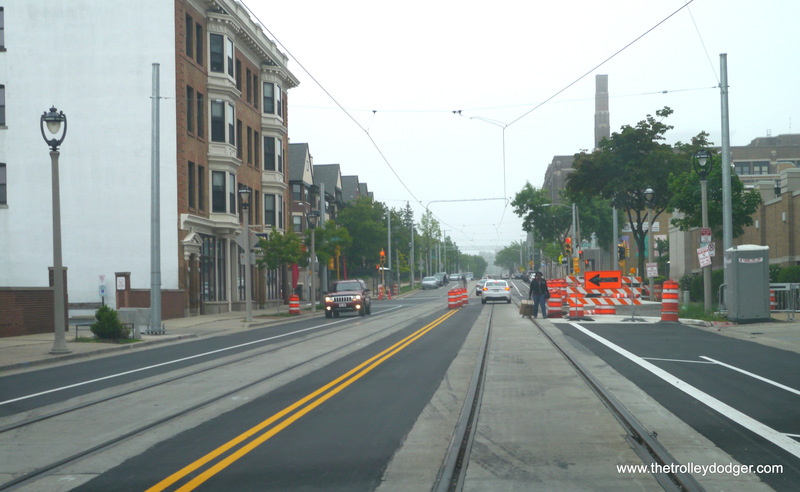 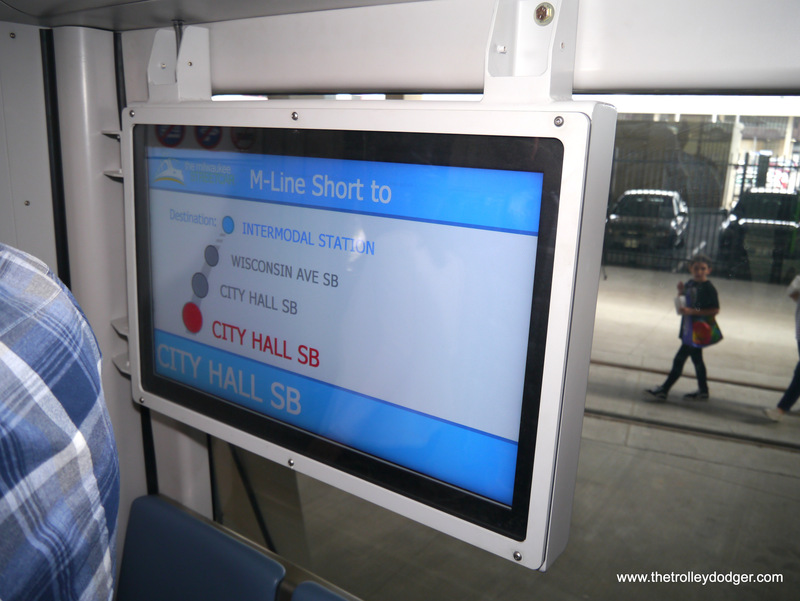 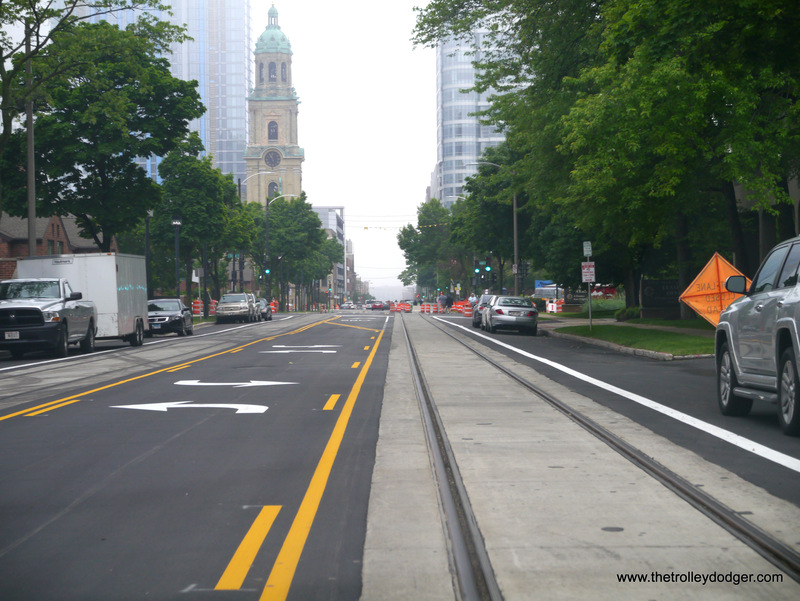 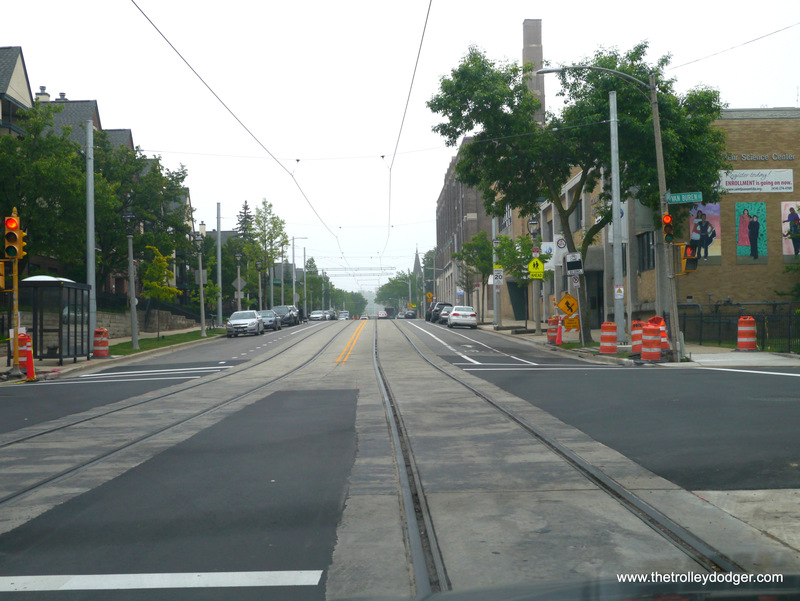 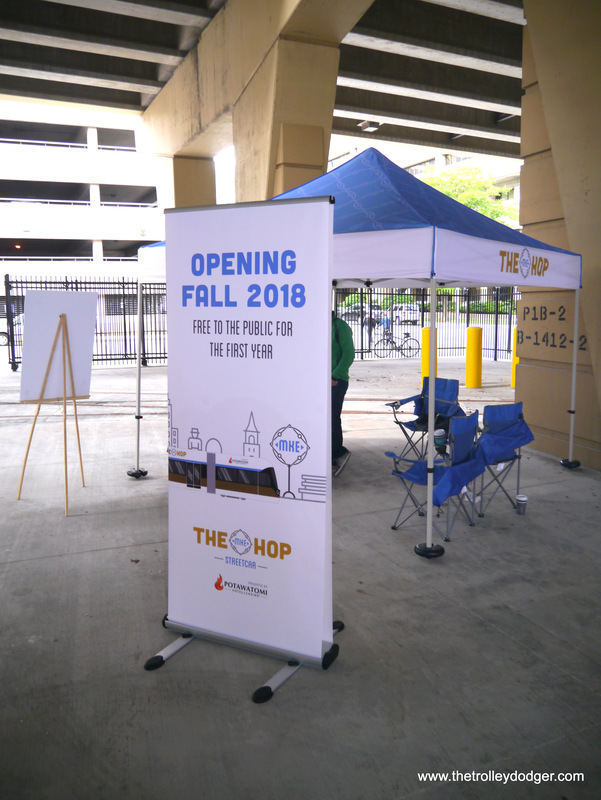 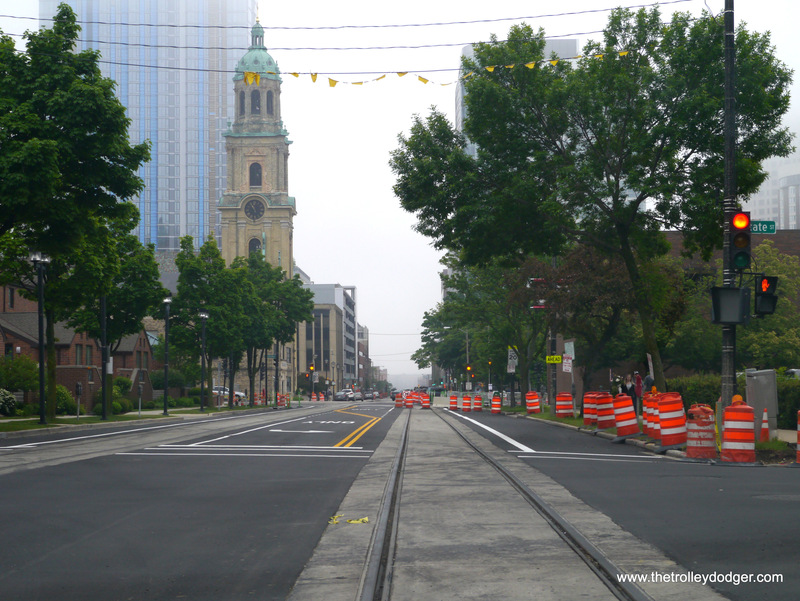 The idea behind Milwaukee’s approximately two-mile-long first streetcar line is park your car, then hop on and off the streetcar as you make your way around the center city. 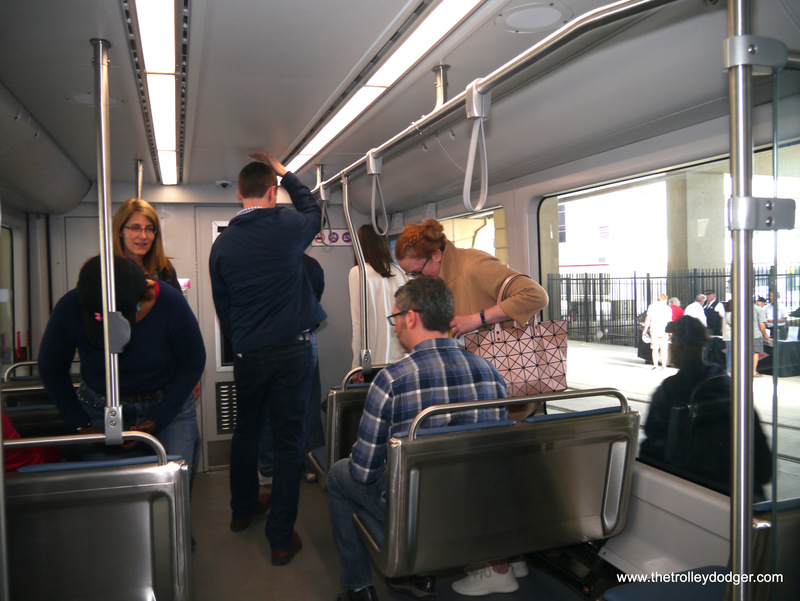 Thanks to a generous donation from a local casino, fares will be free for the first year, and probably $1 after. 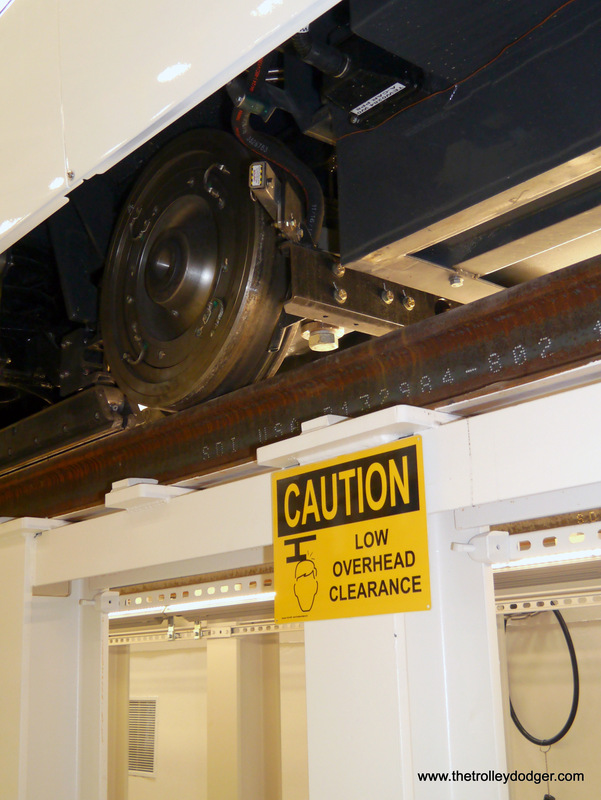 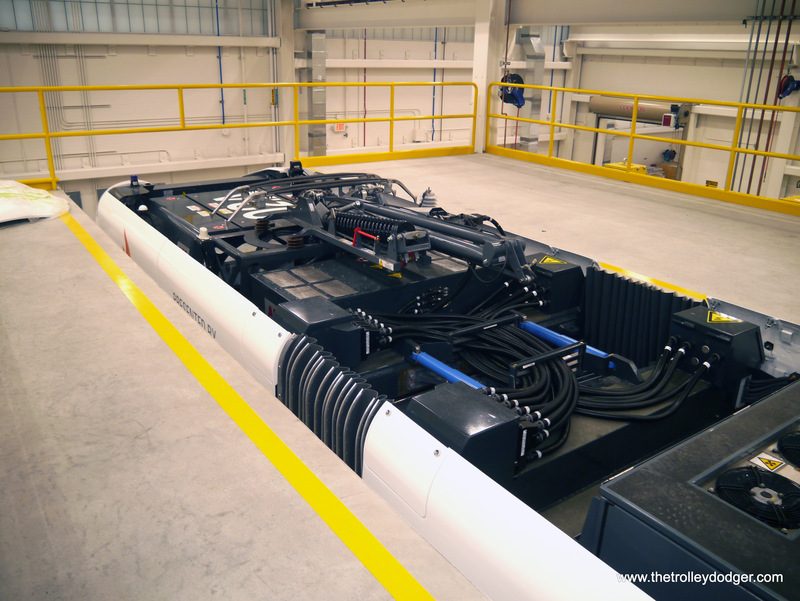 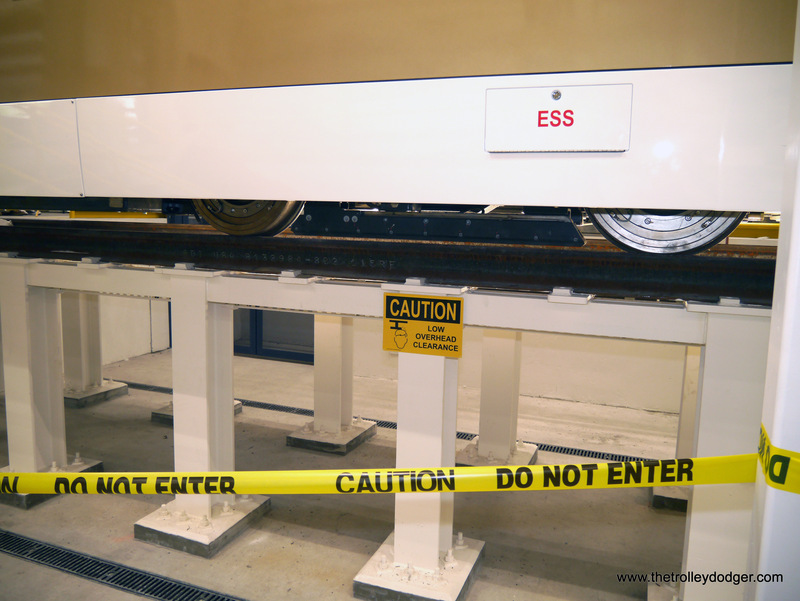 It’s not often you can get a close-up look at the pantograph on a streetcar. 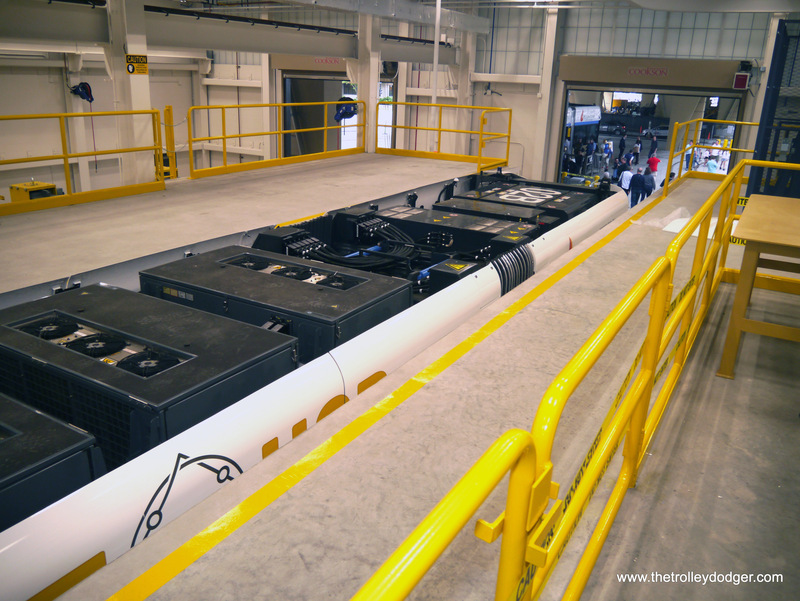 There were no wires in the maintenance facility, so in all likelihood, the cars will enter and leave by either using battery power, or being towed. 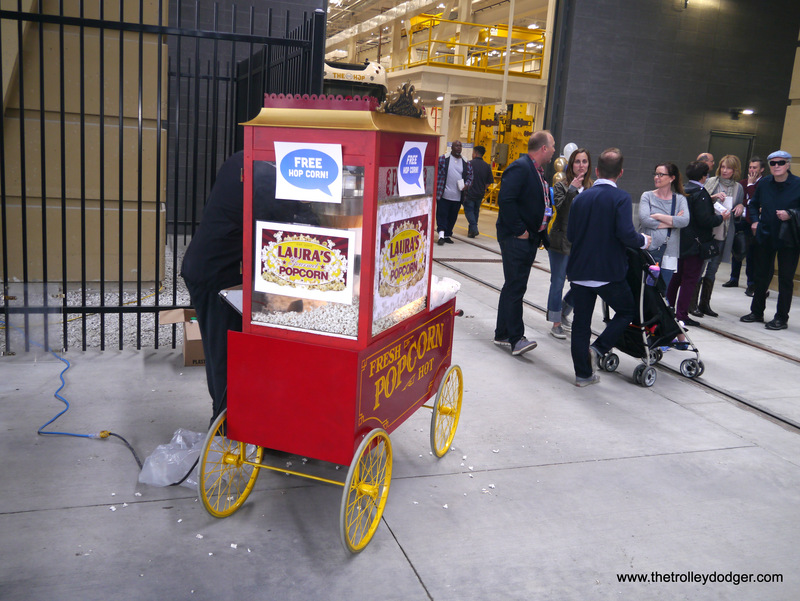 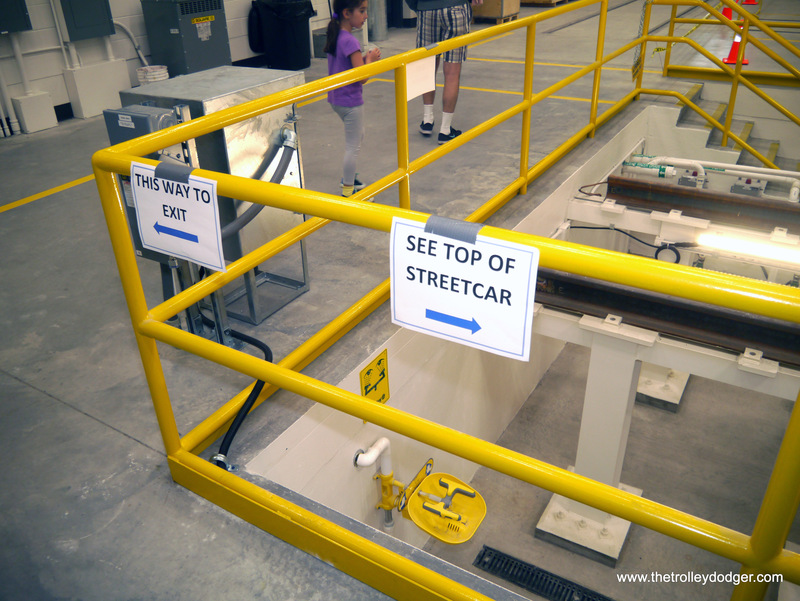 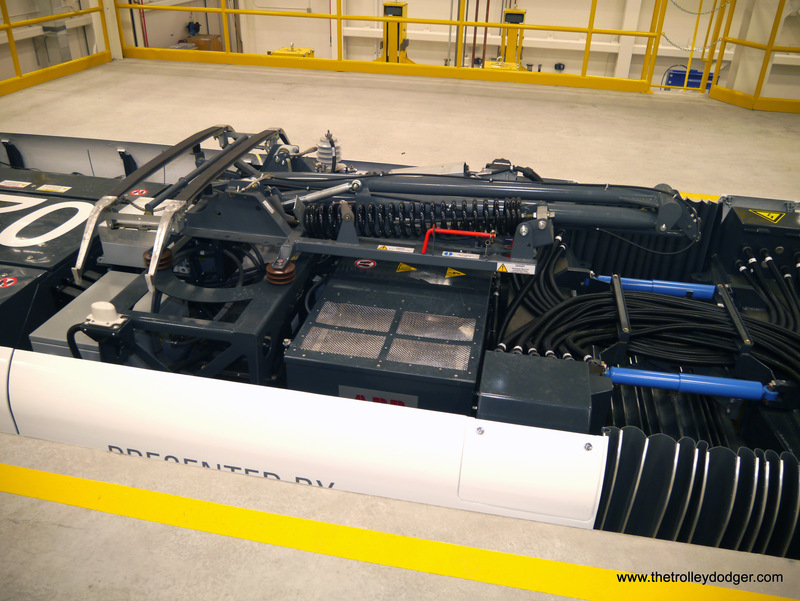 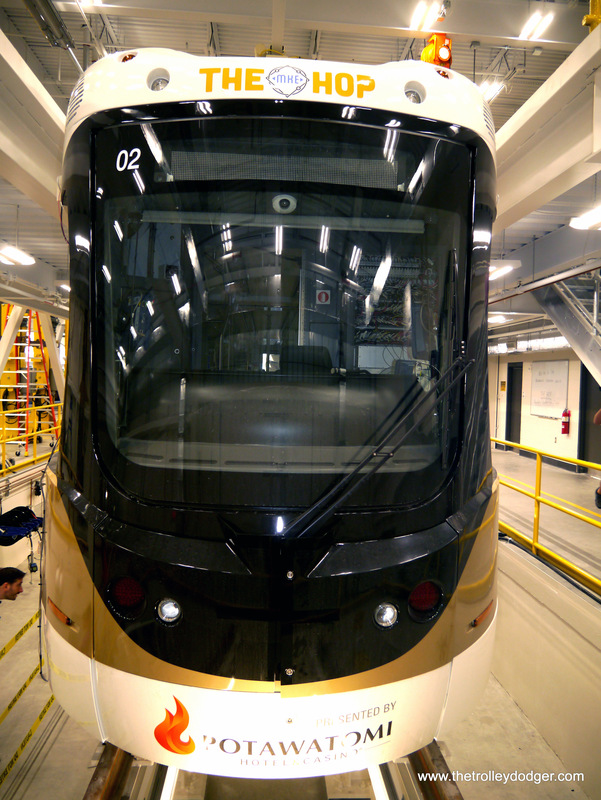 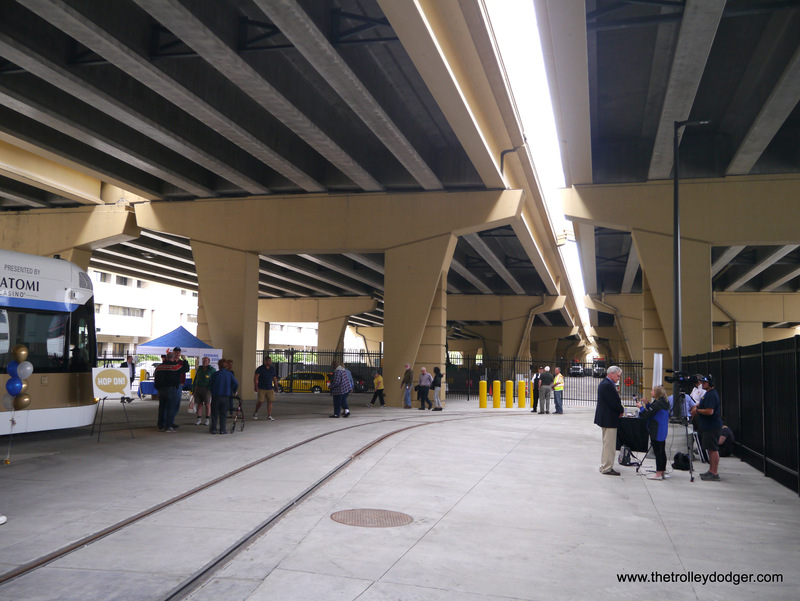 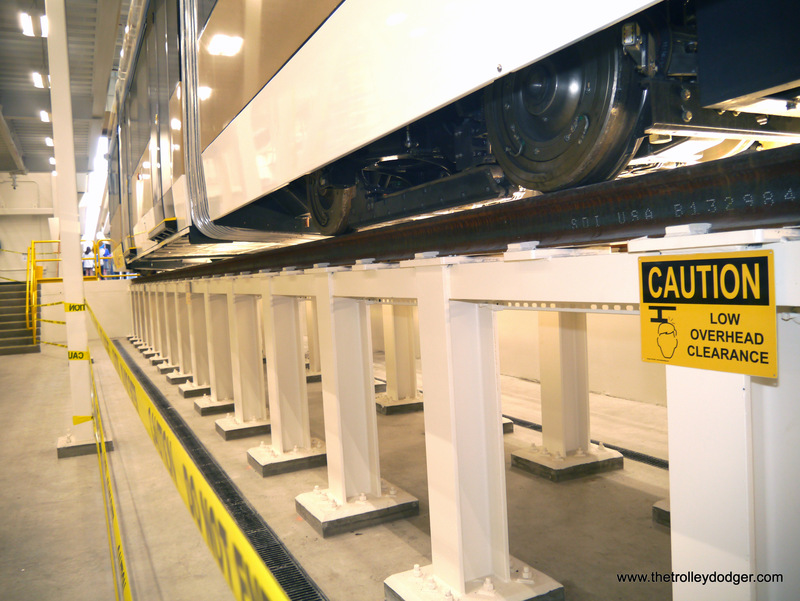 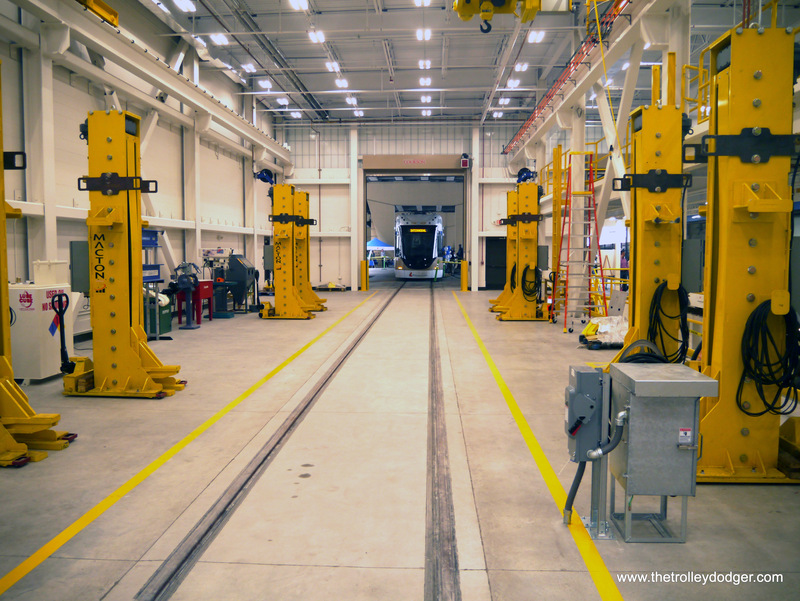 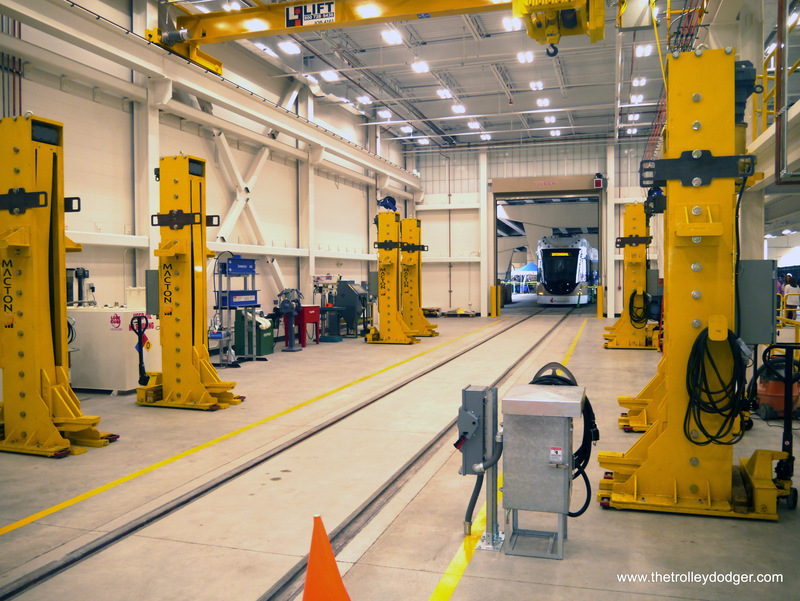 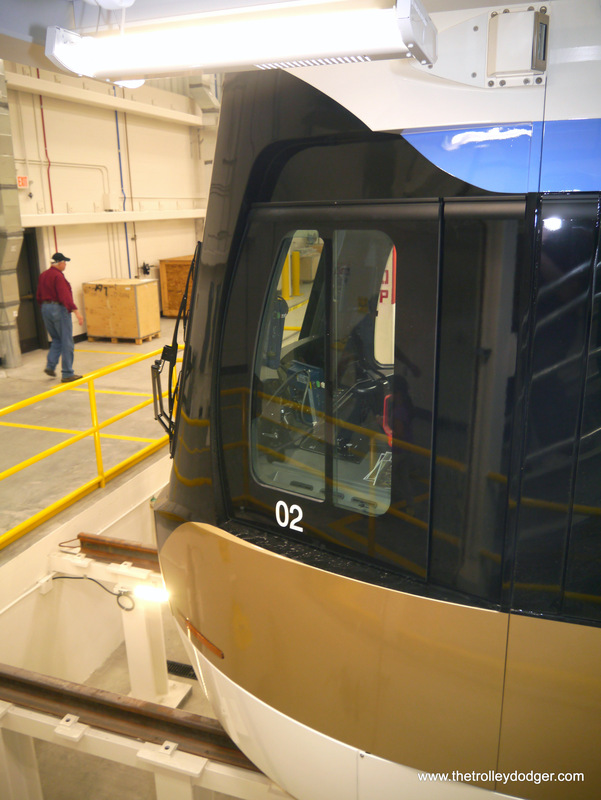 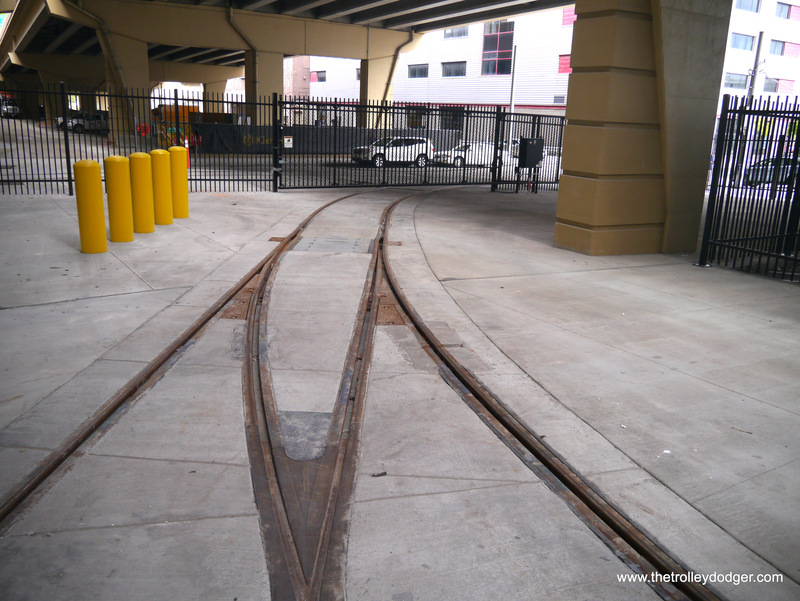 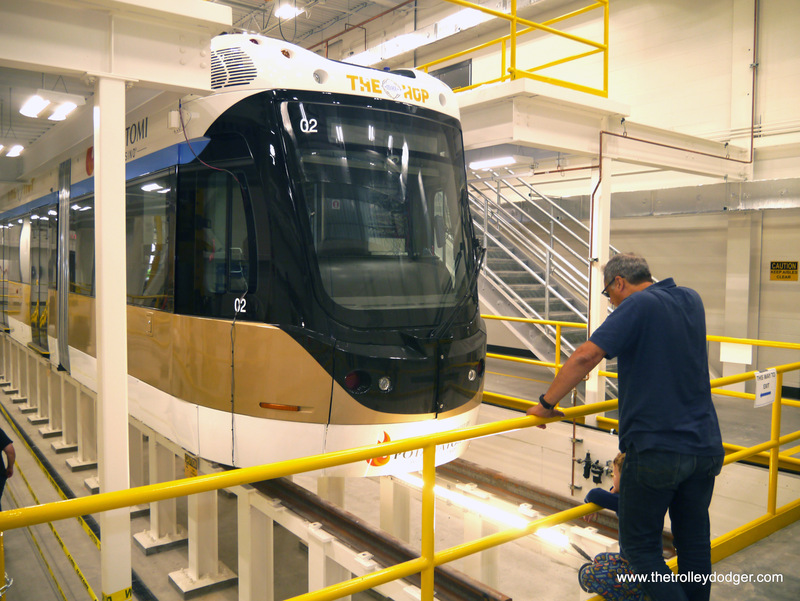 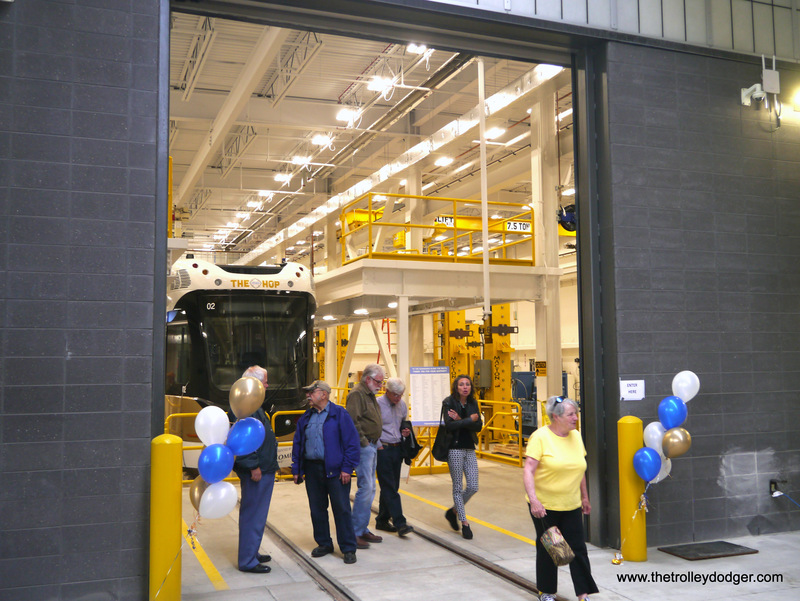 The new streetcar maintenance facility makes use of space underneath a highway. 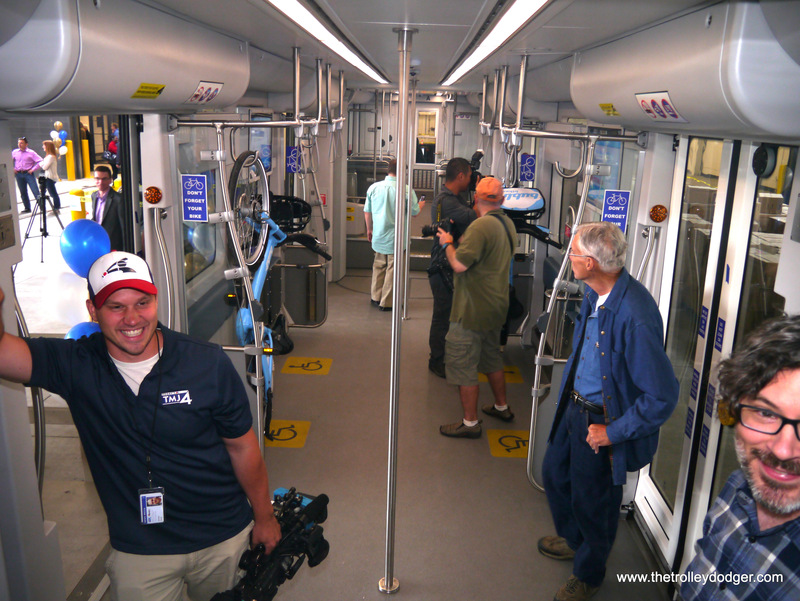 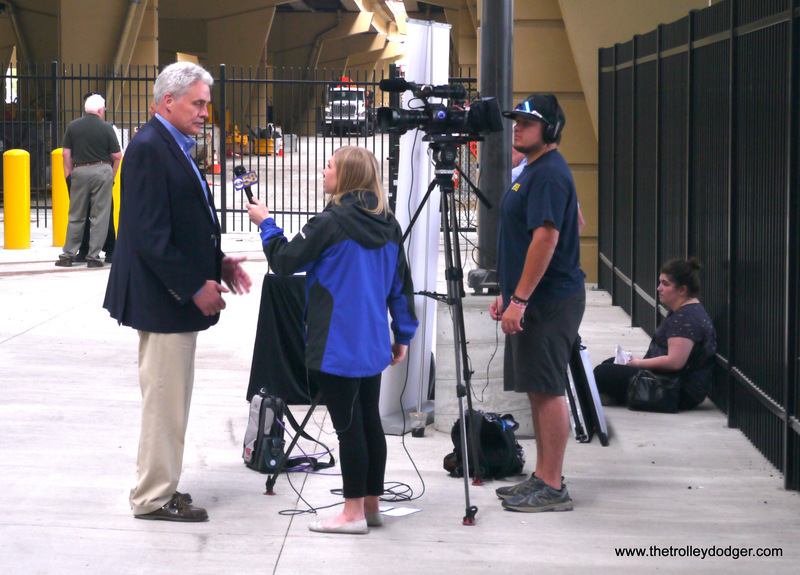 Local news reporters interviewing Alderman Bob Bauman, a strong streetcar supporter. 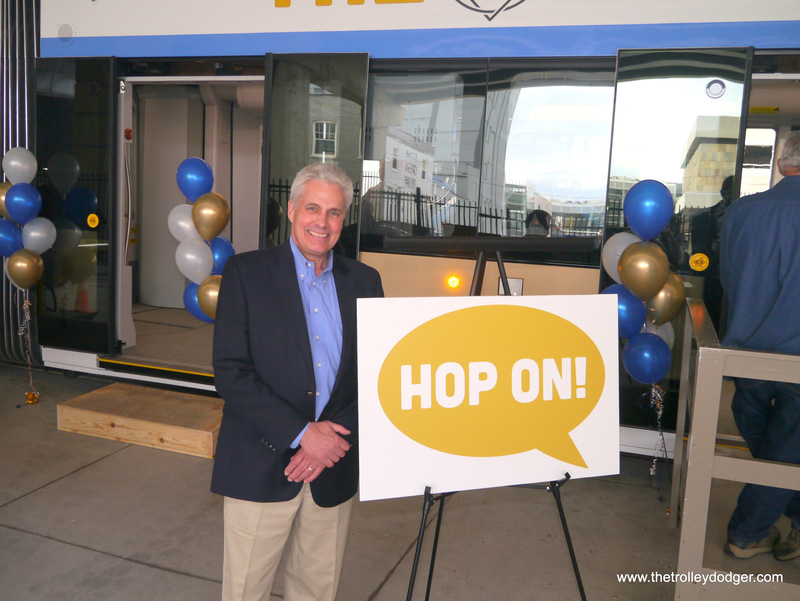 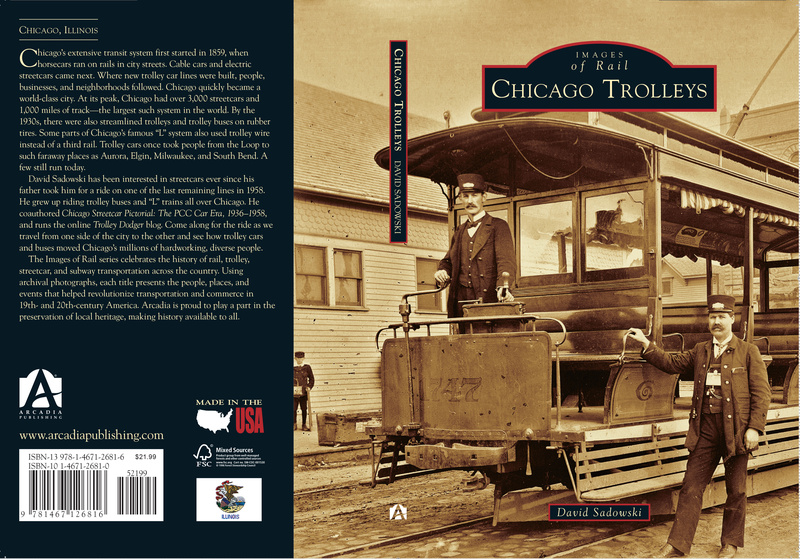 We shook Milwaukee Alderman Bob Bauman’s hand and he graciously agreed to pose for pictures for us in front of one of the new streetcars. 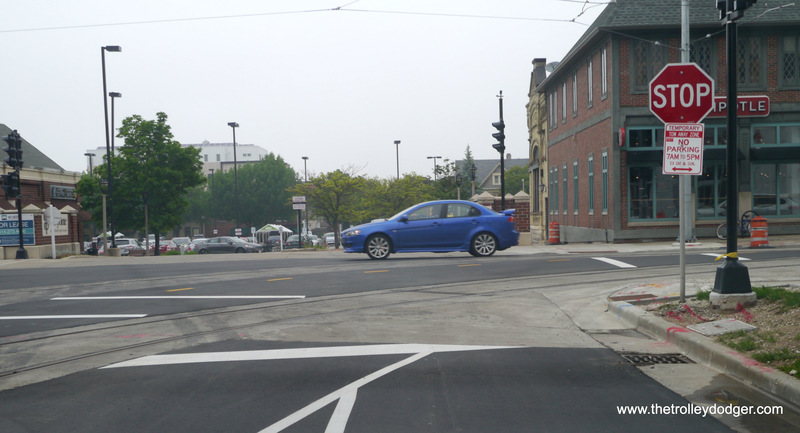 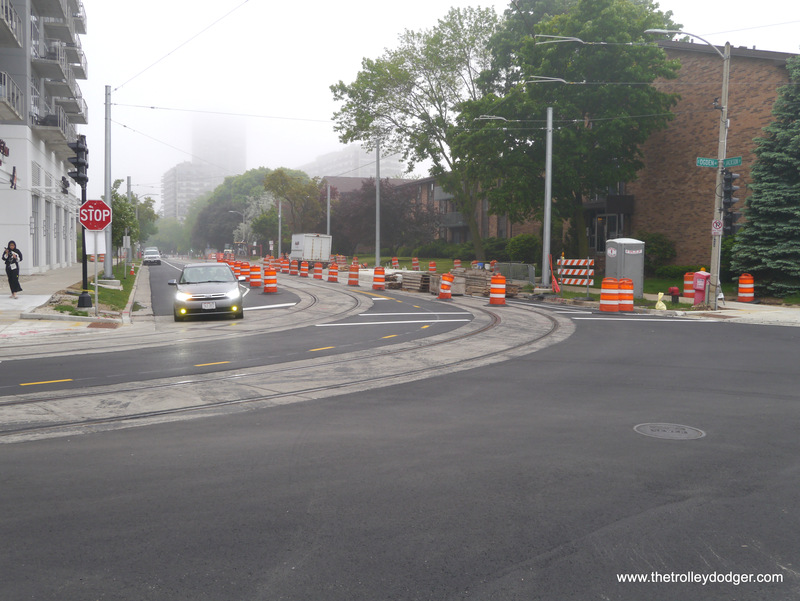 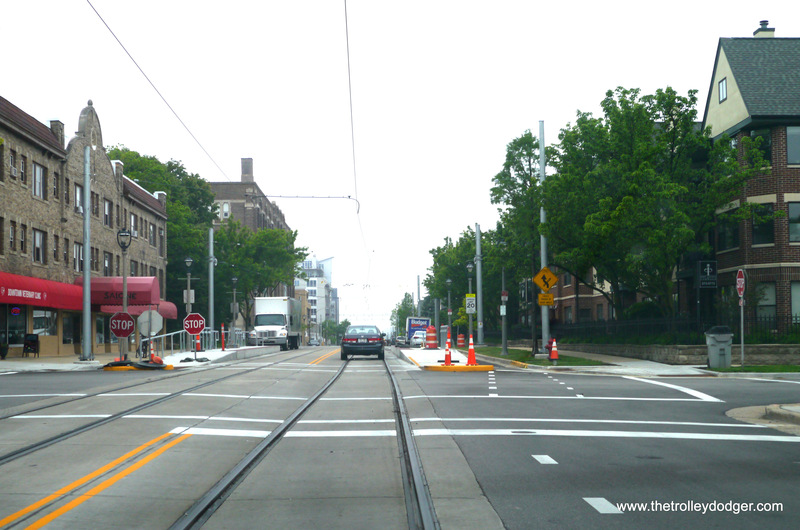 The streetcar line makes a rather tight turn at this intersection. 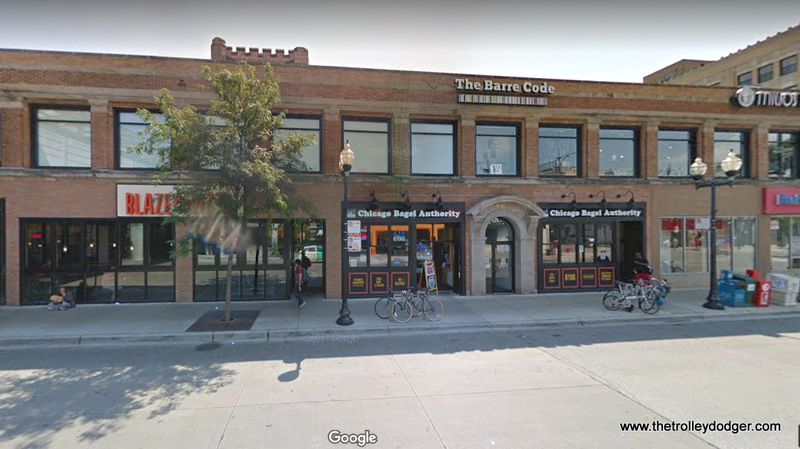 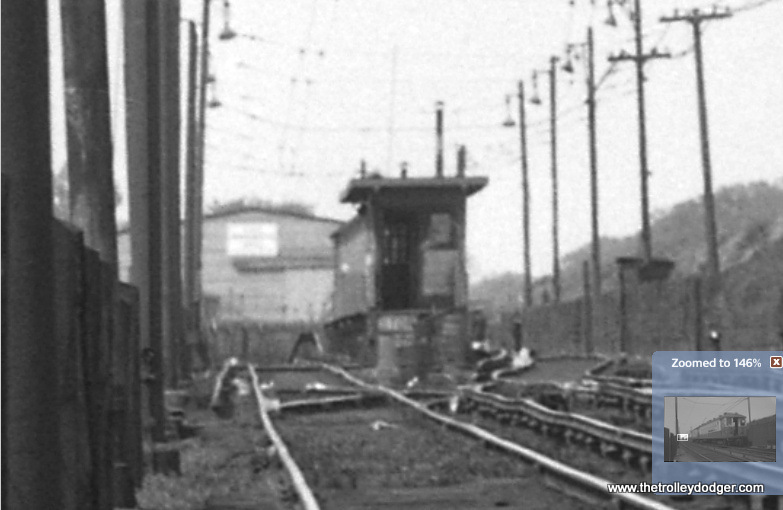 This is the northern end of the line. 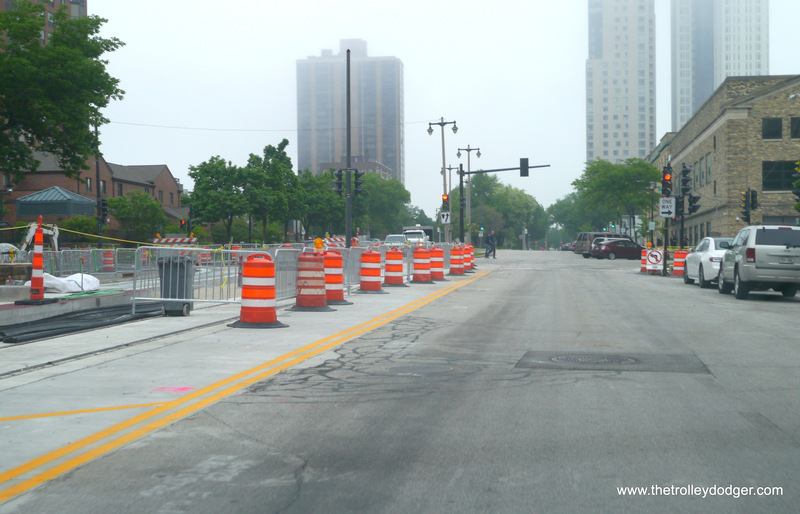 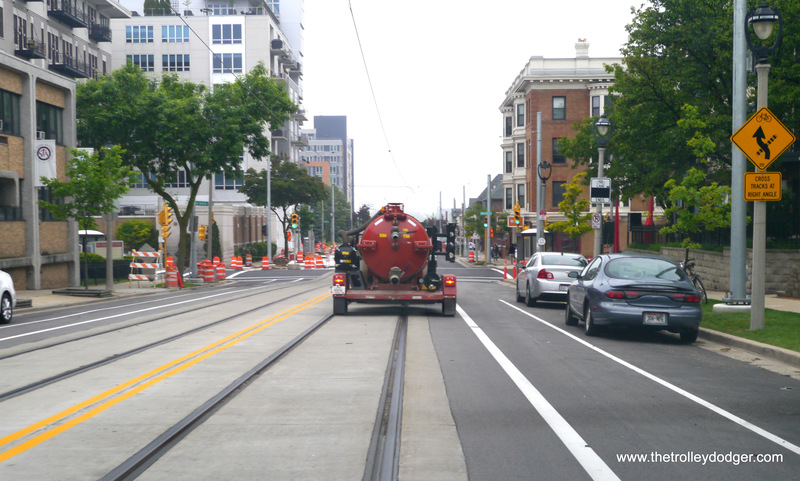 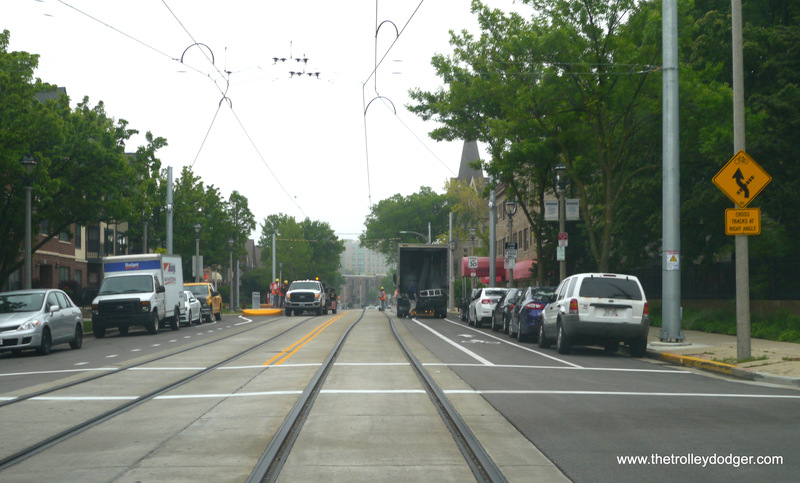 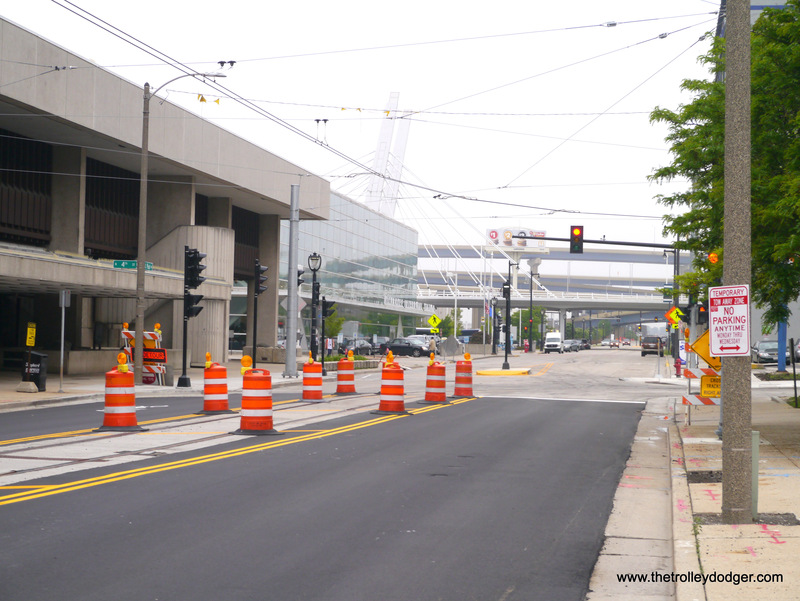 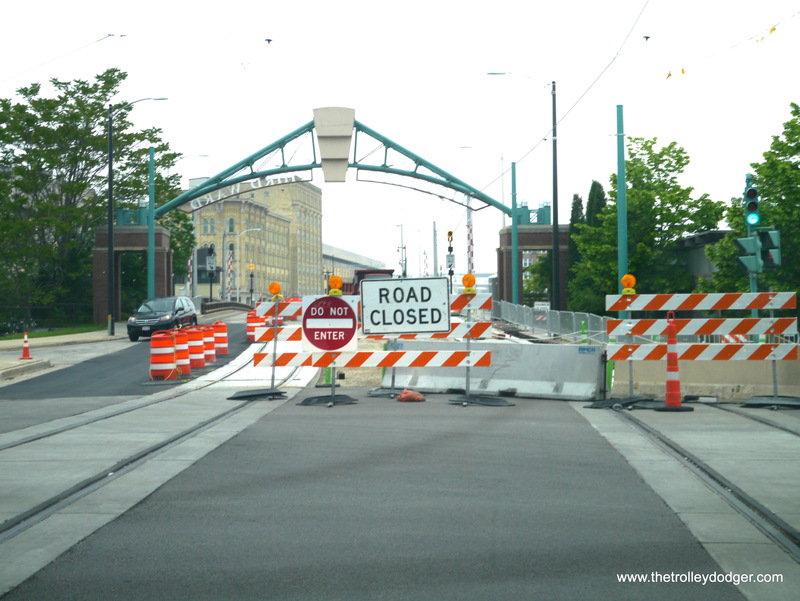 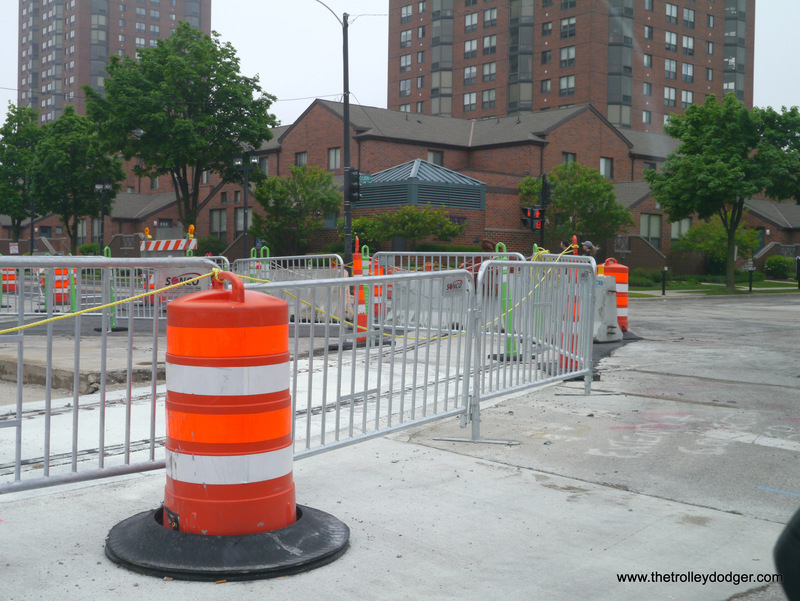 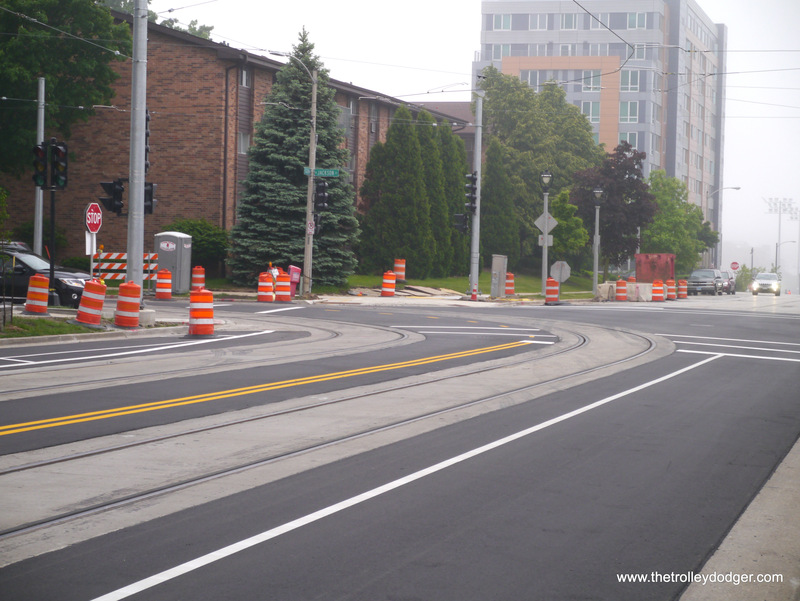 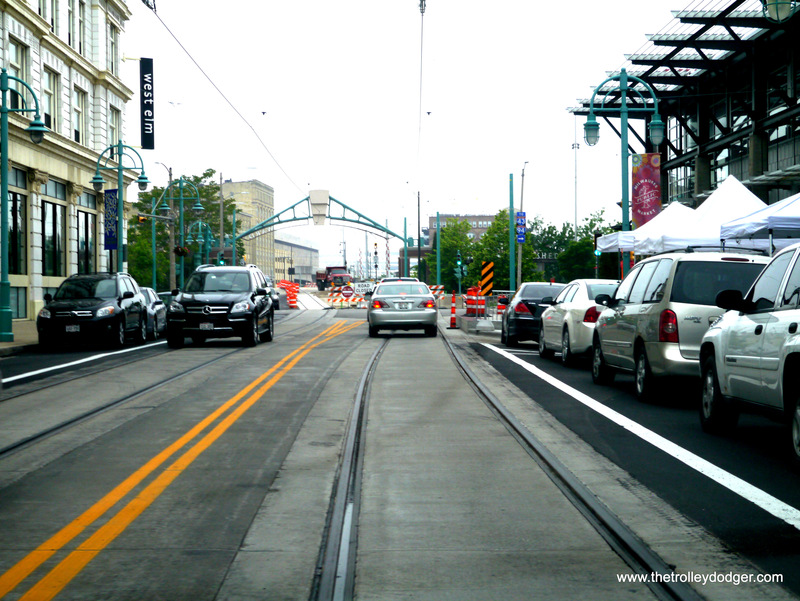 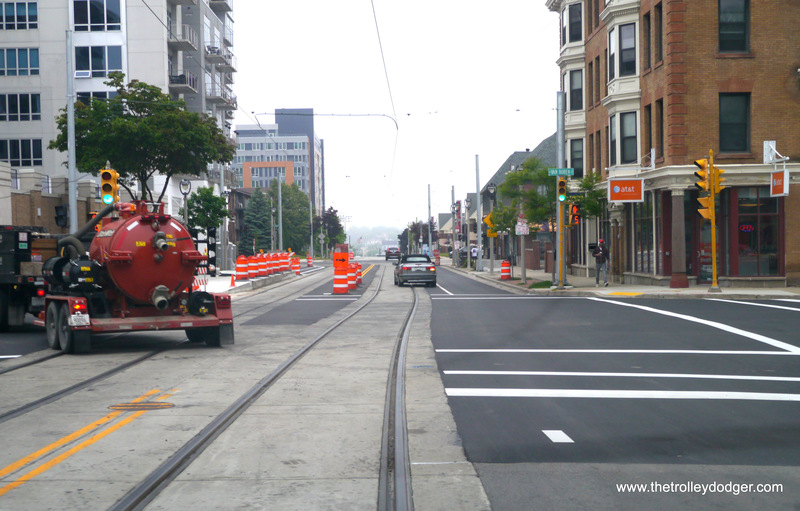 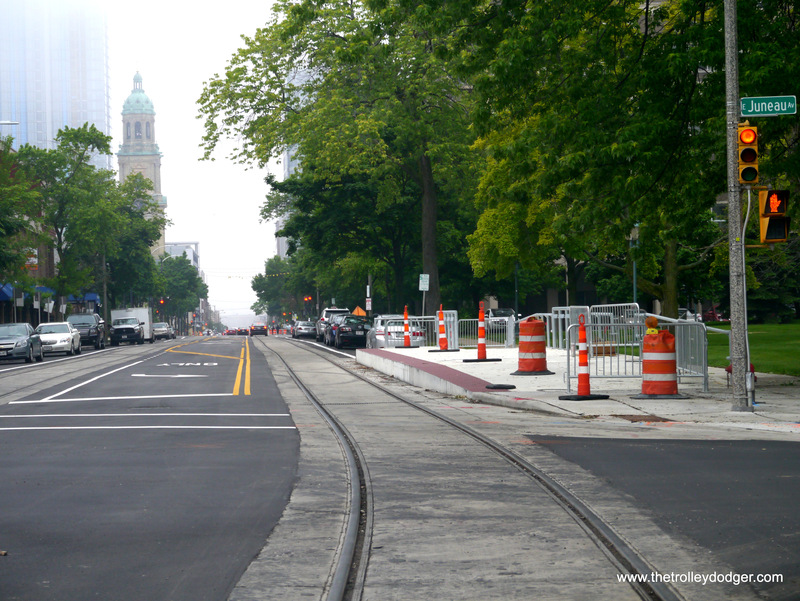 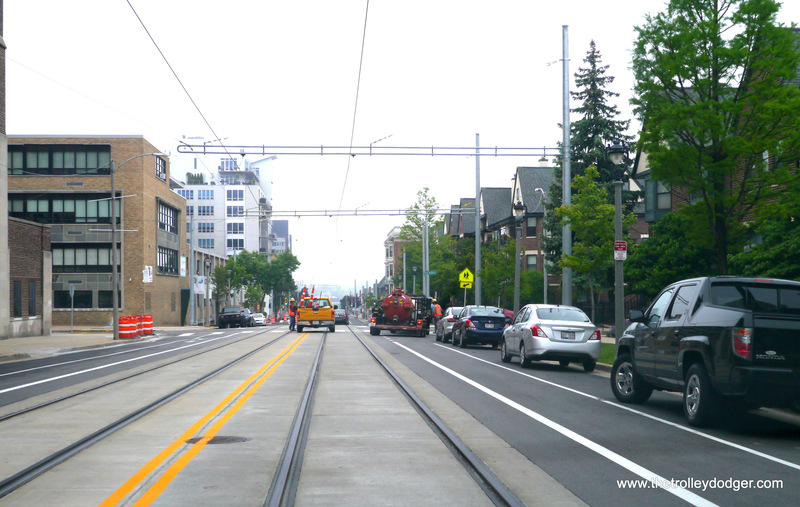 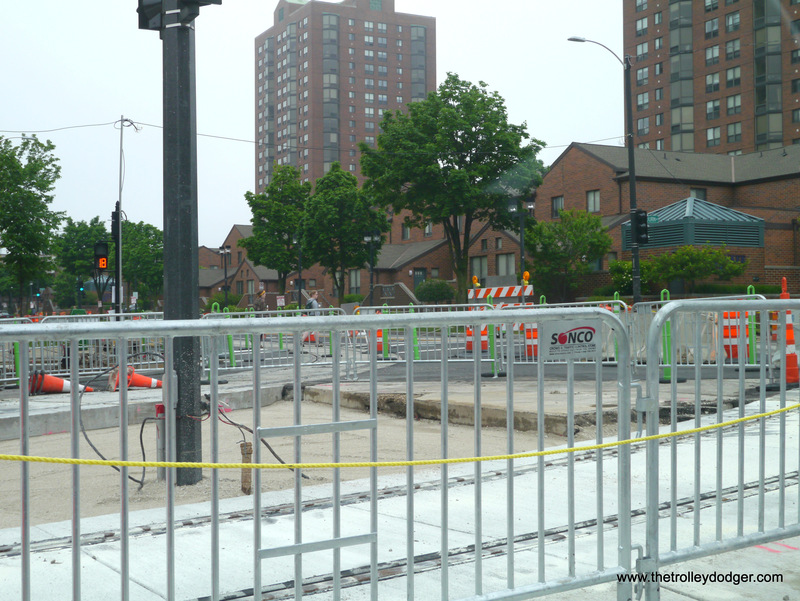 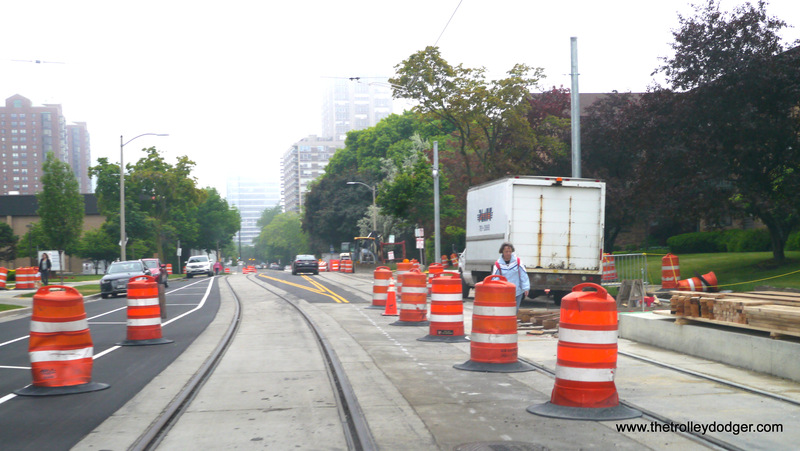 There are various obstacles blocking parts of the line, enough to make me think that it could be a month or so before the streetcars are tested out on the streets. 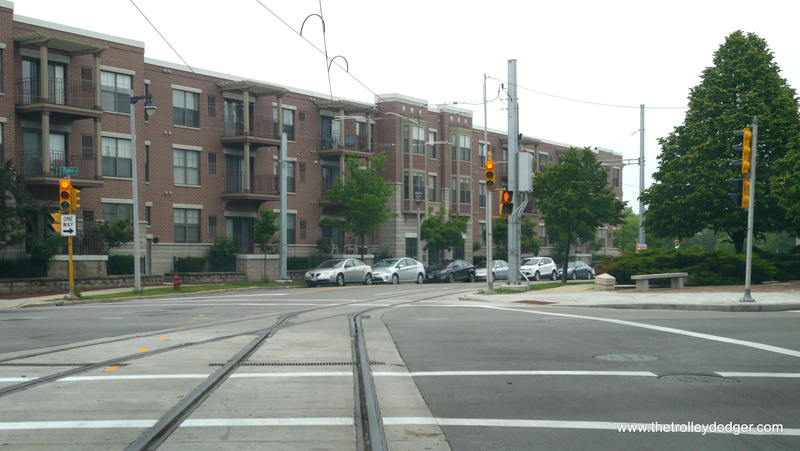 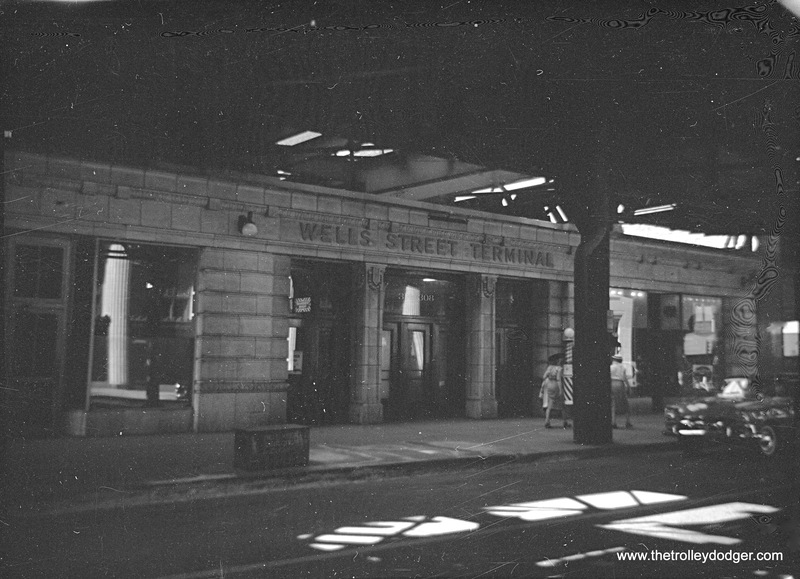 Brick surrounds the tracks at this intersection. 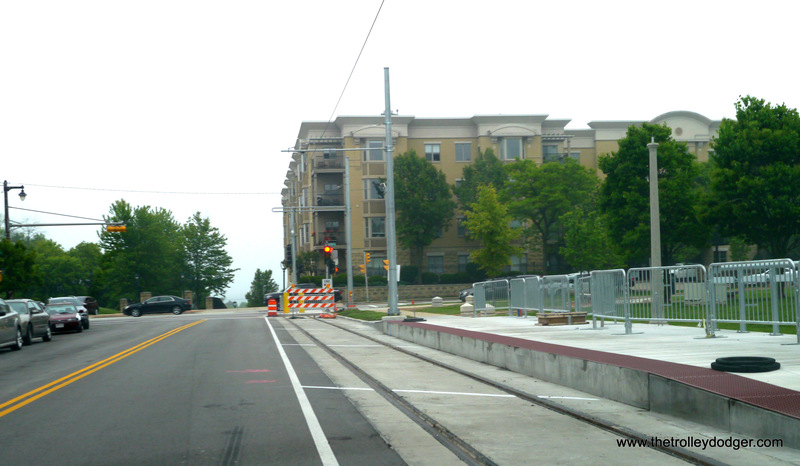 Some work still needs to be done on the various safety islands along the line. 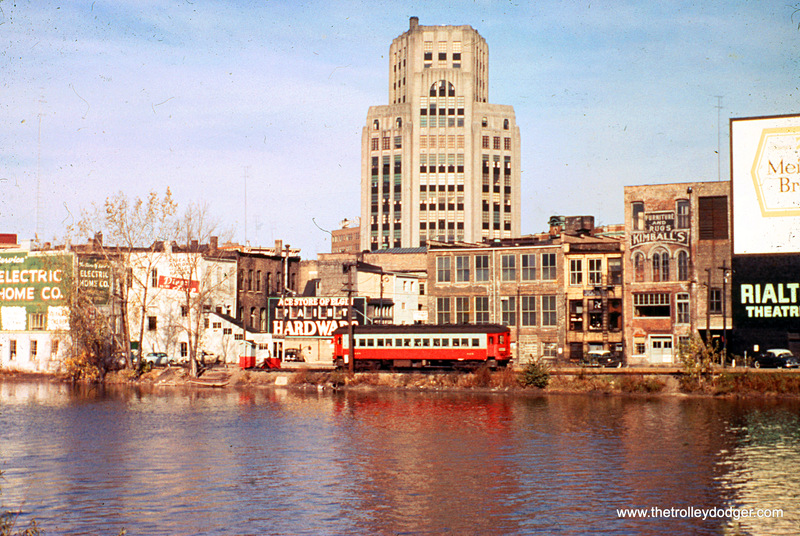 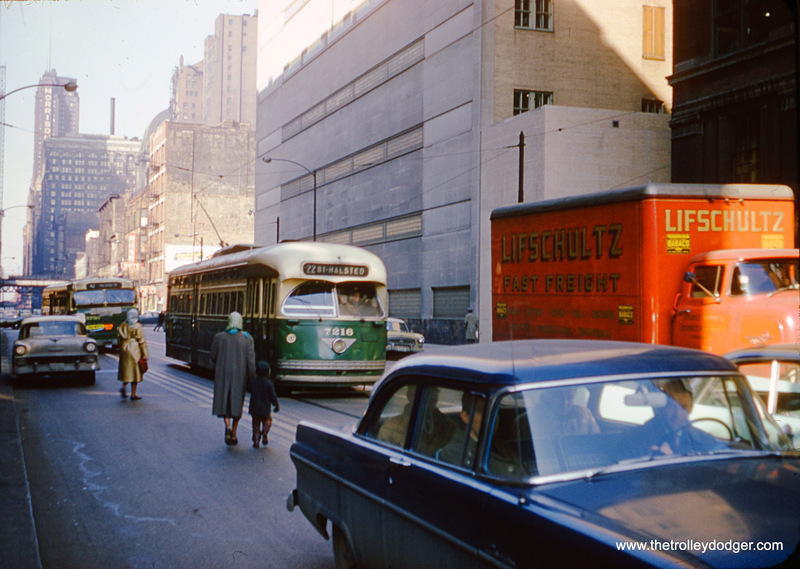 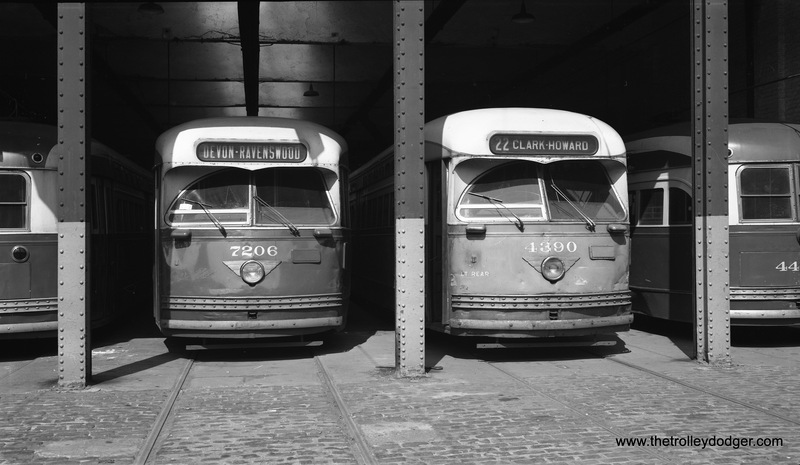 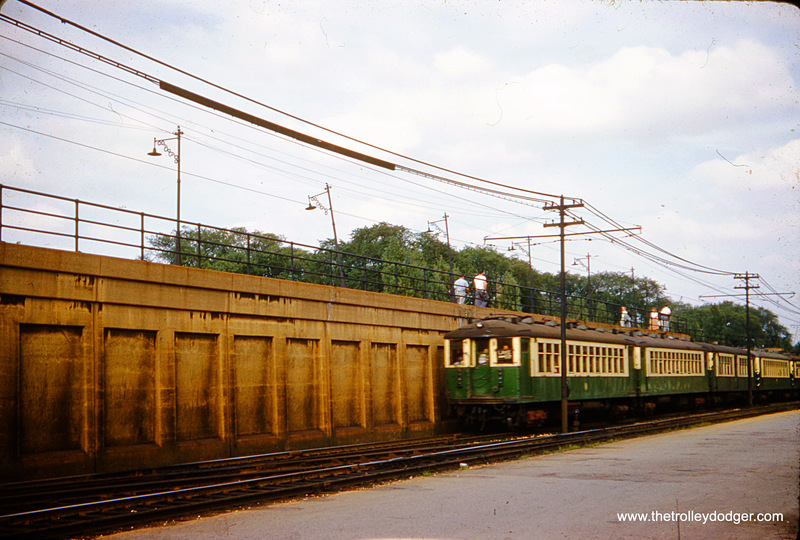 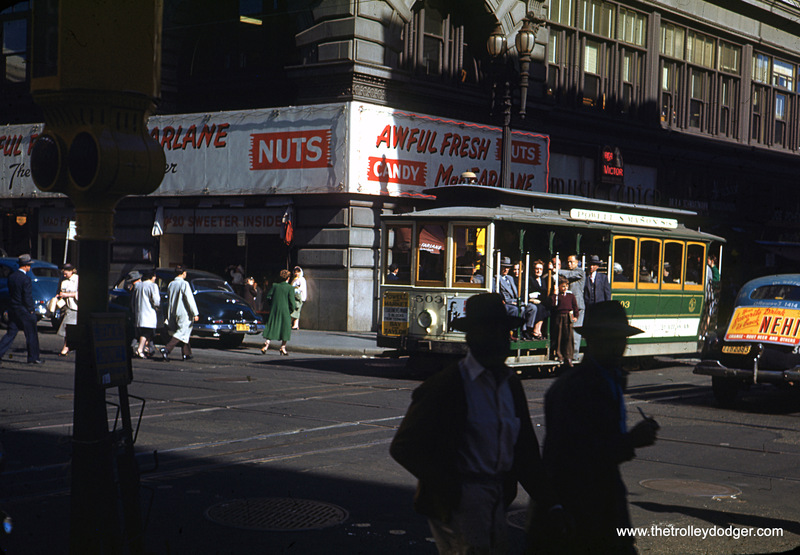 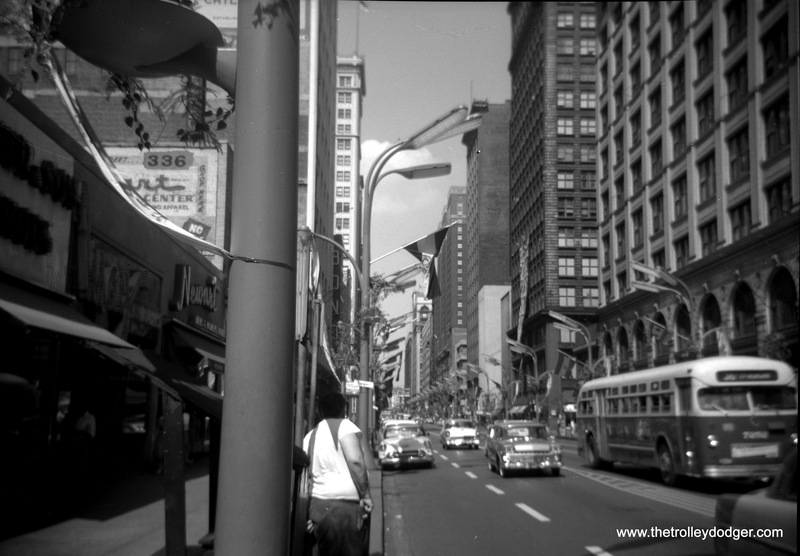 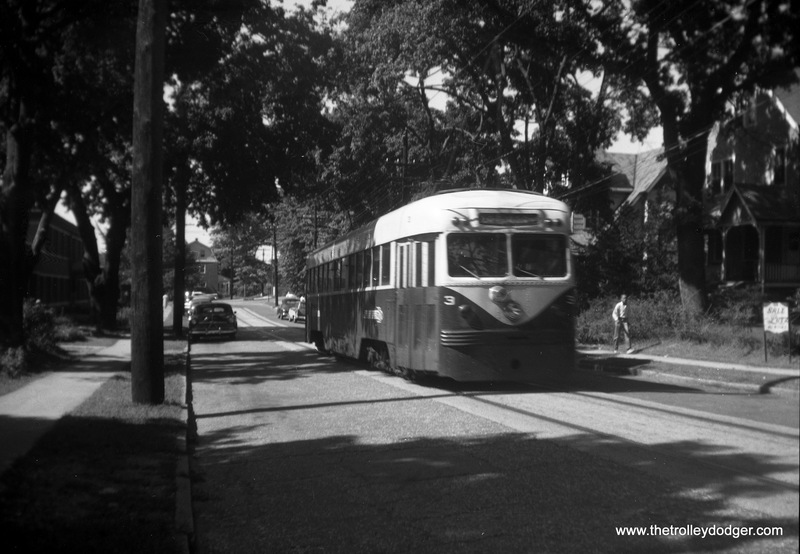 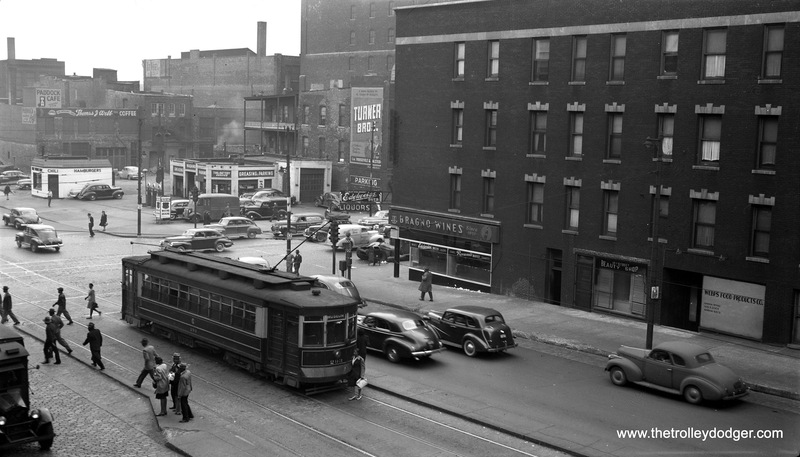 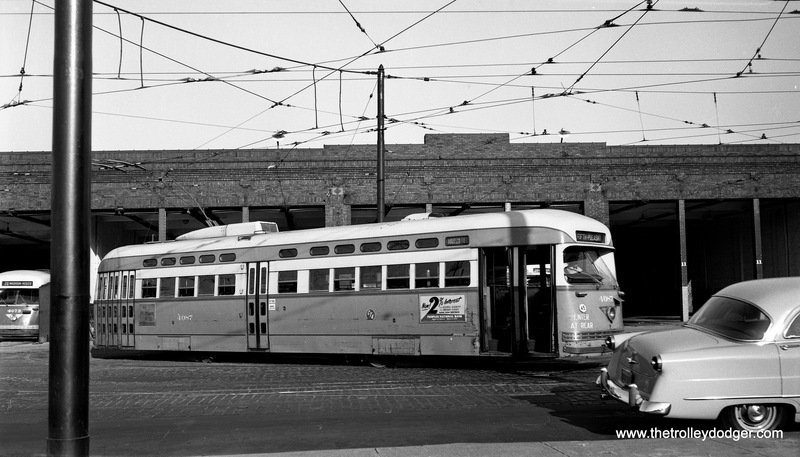 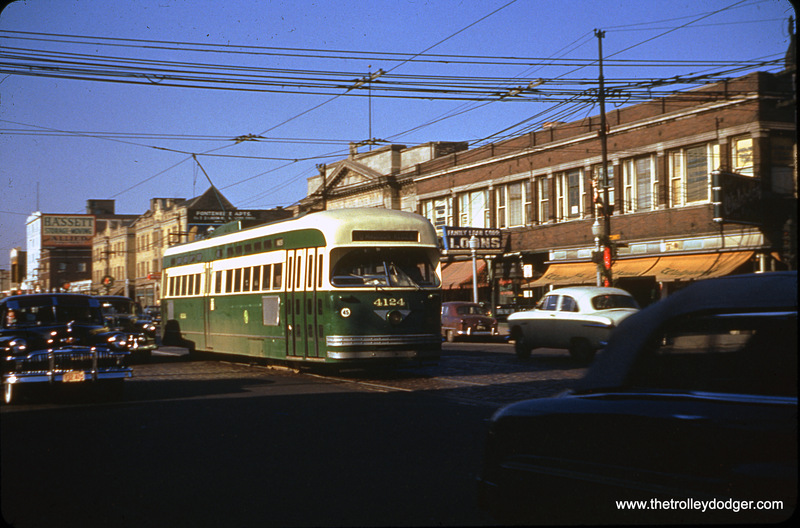 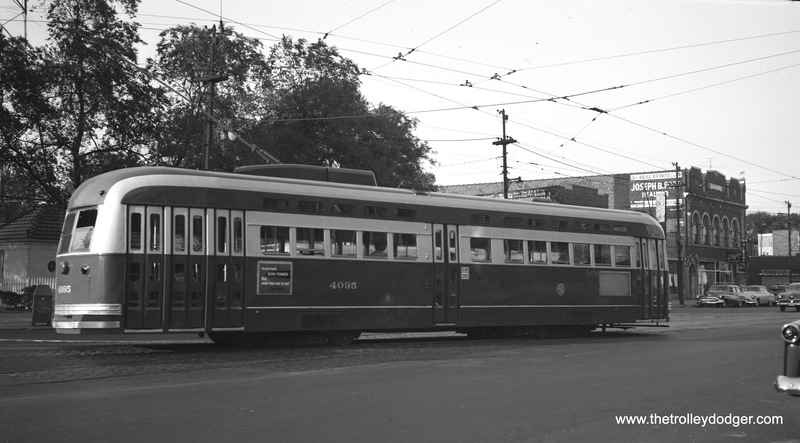 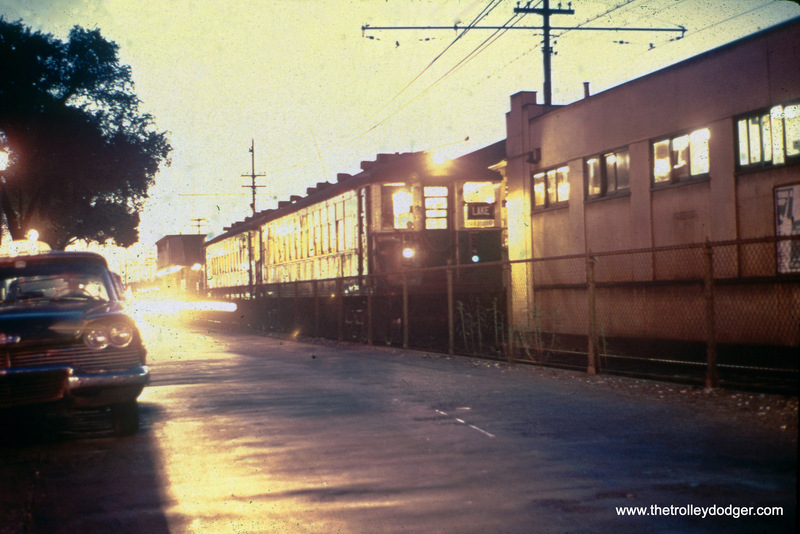 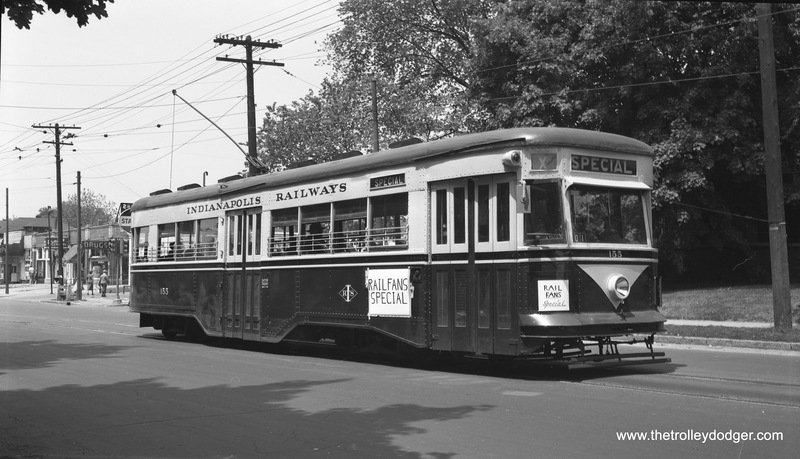 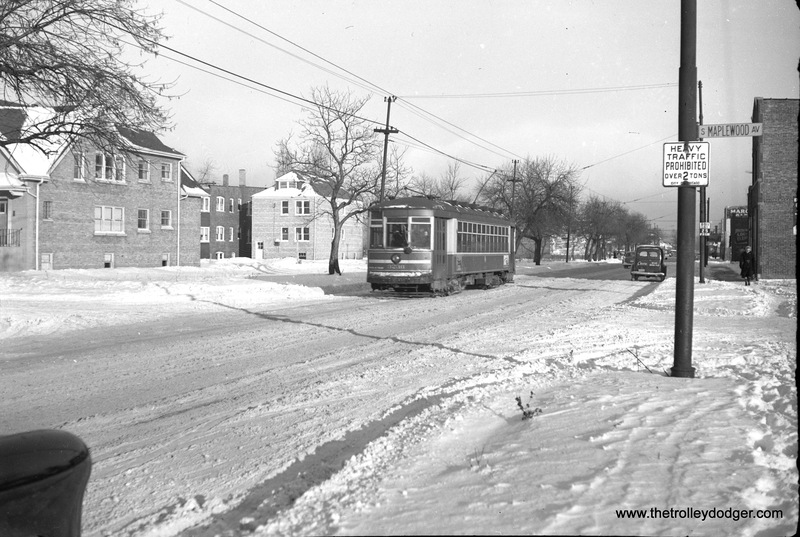 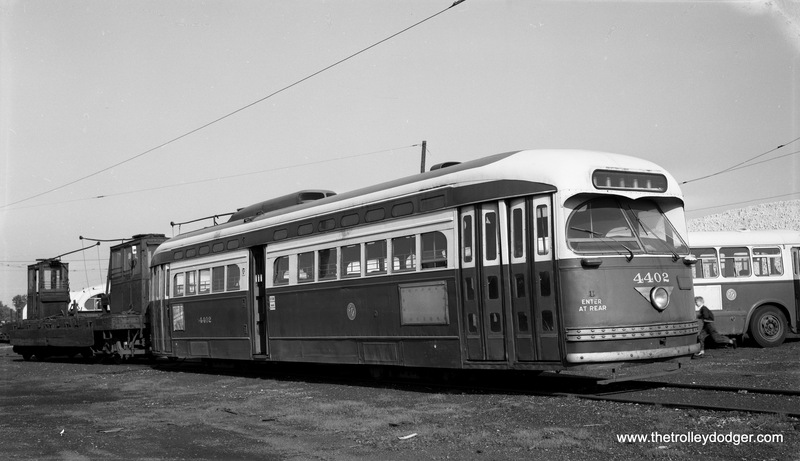 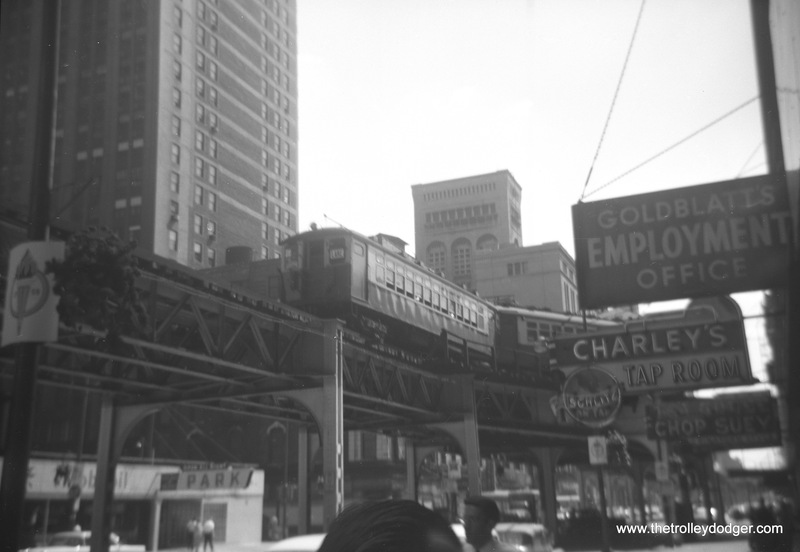 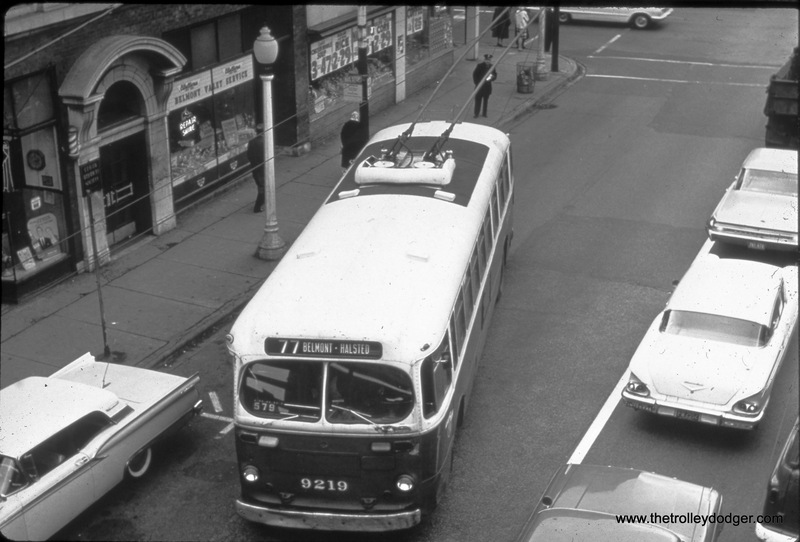 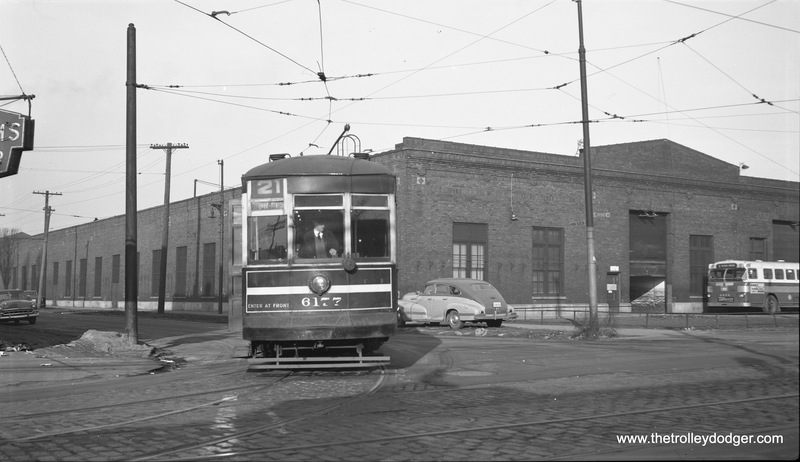 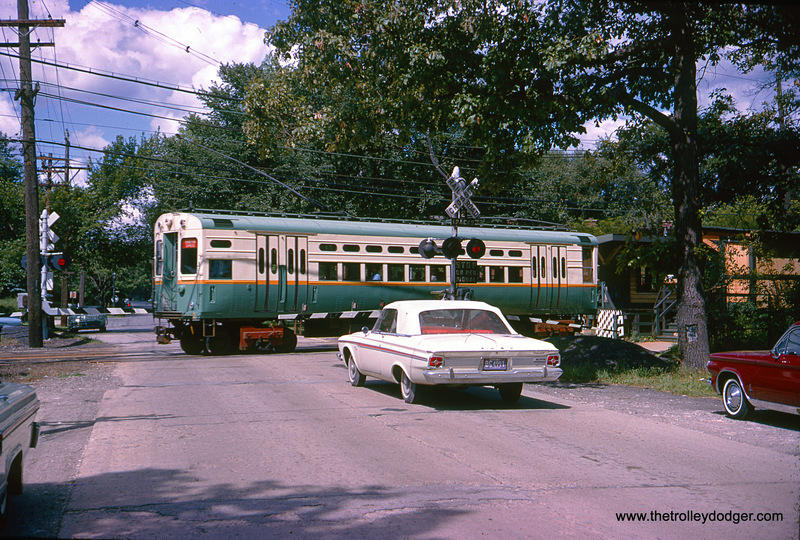 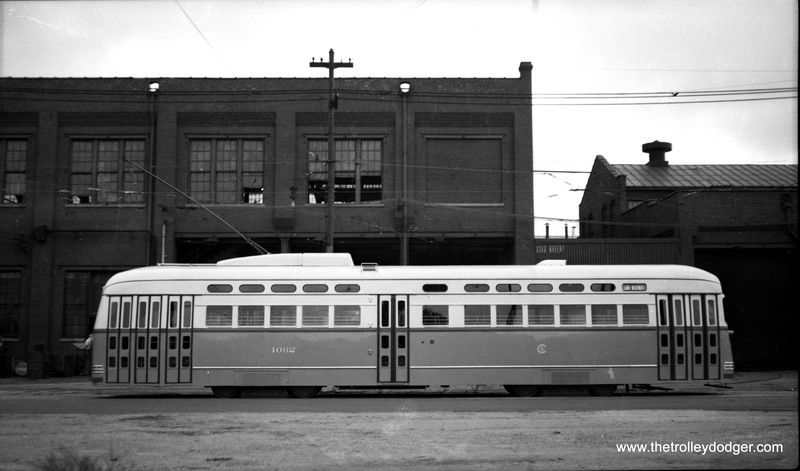 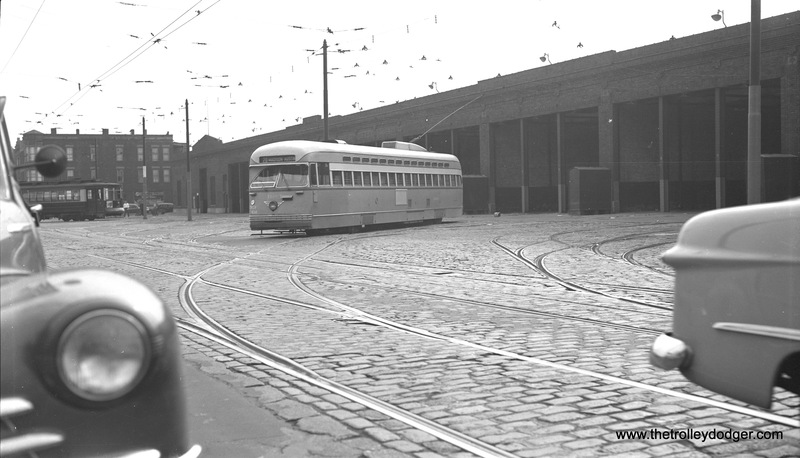 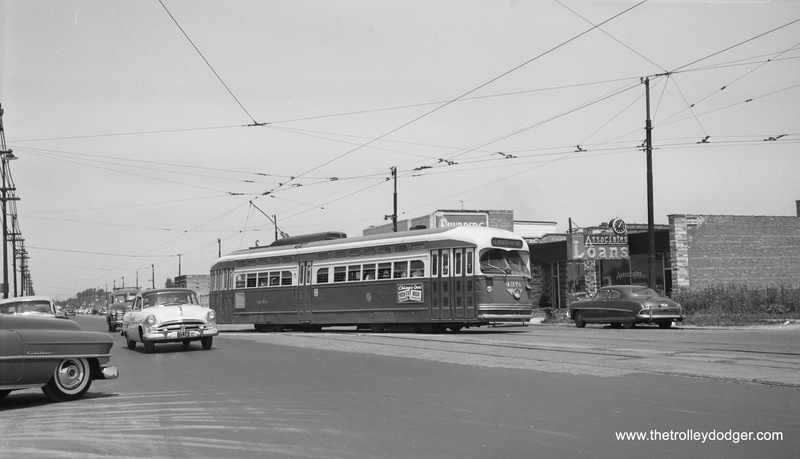 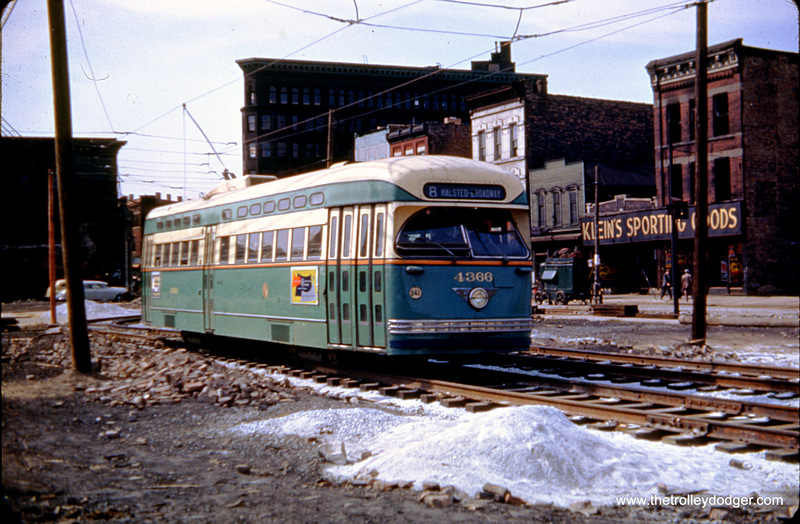 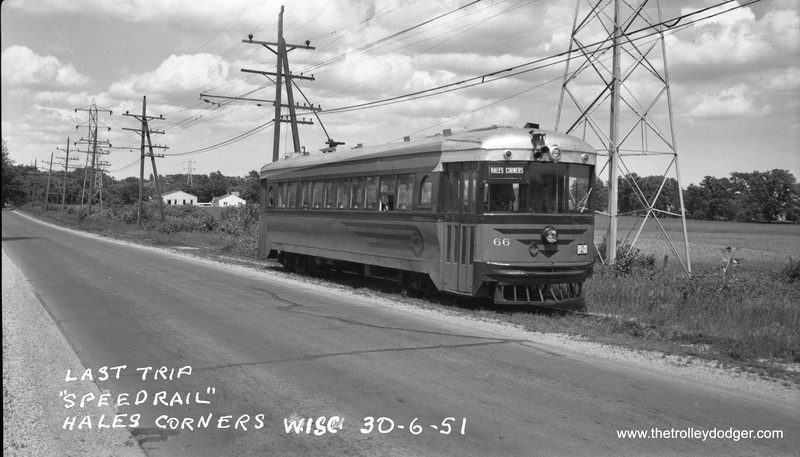 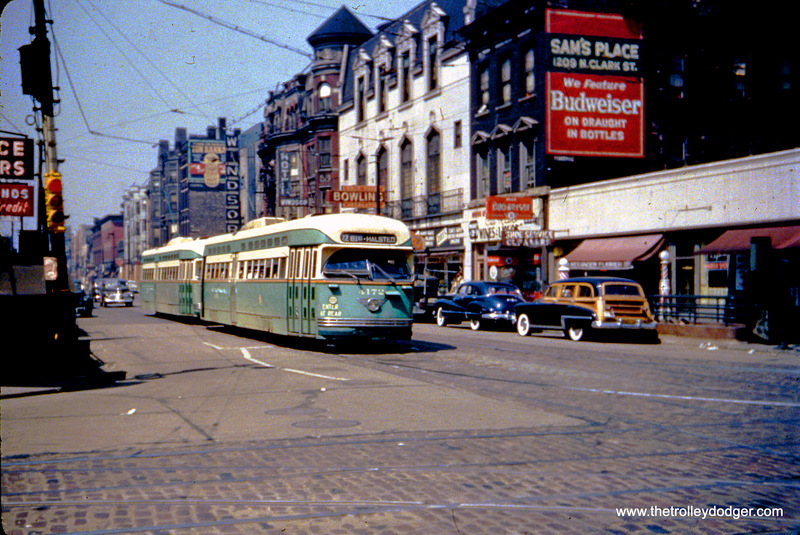 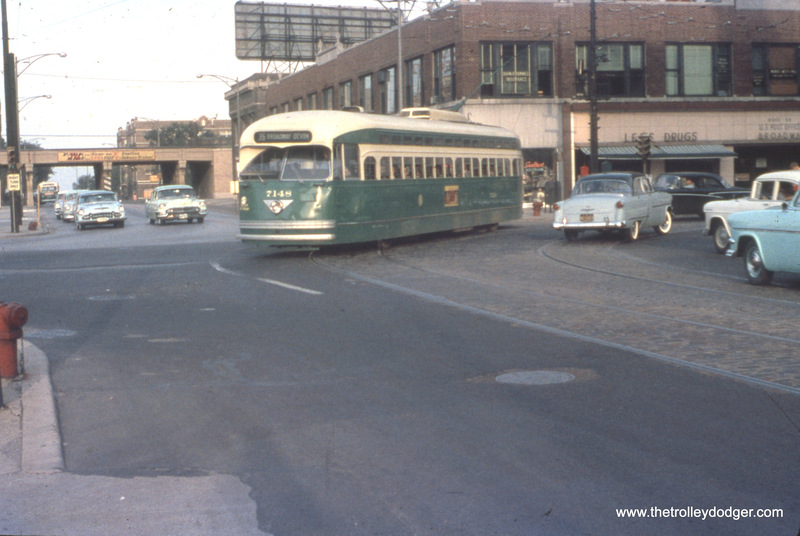 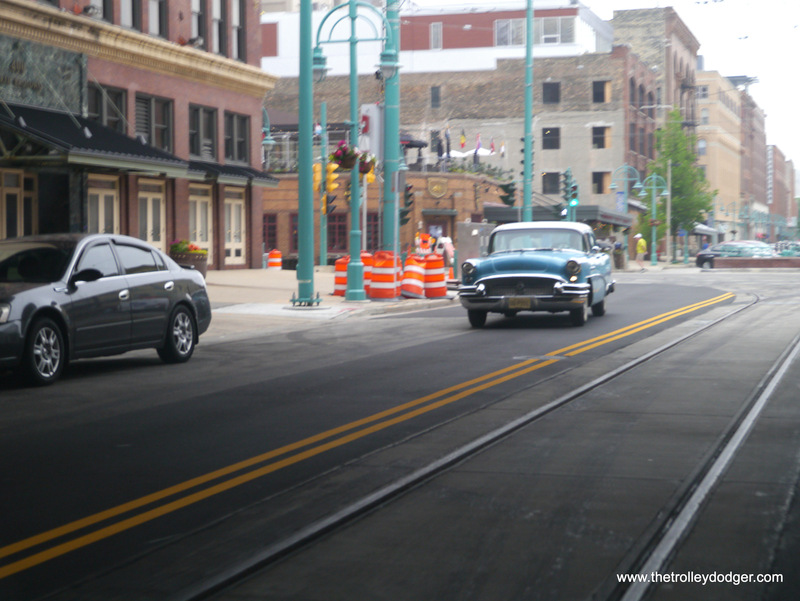 This late 1950s Buick was new around the time streetcars last ran in Milwaukee. 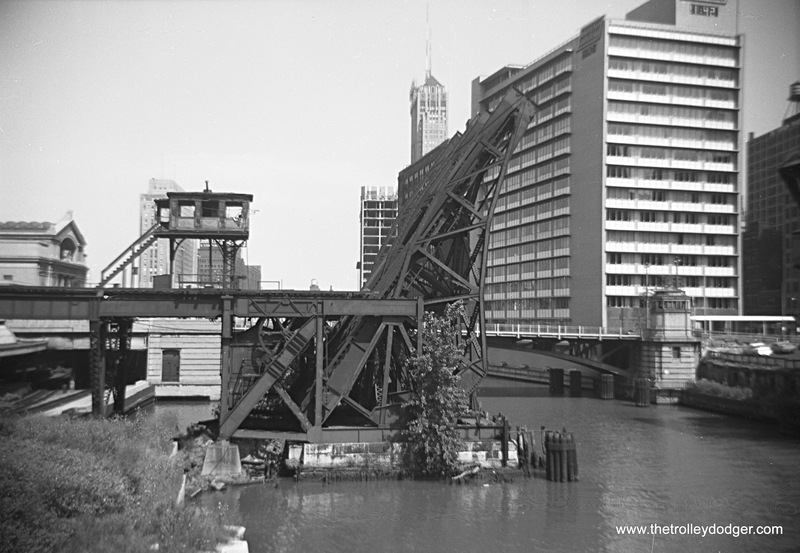 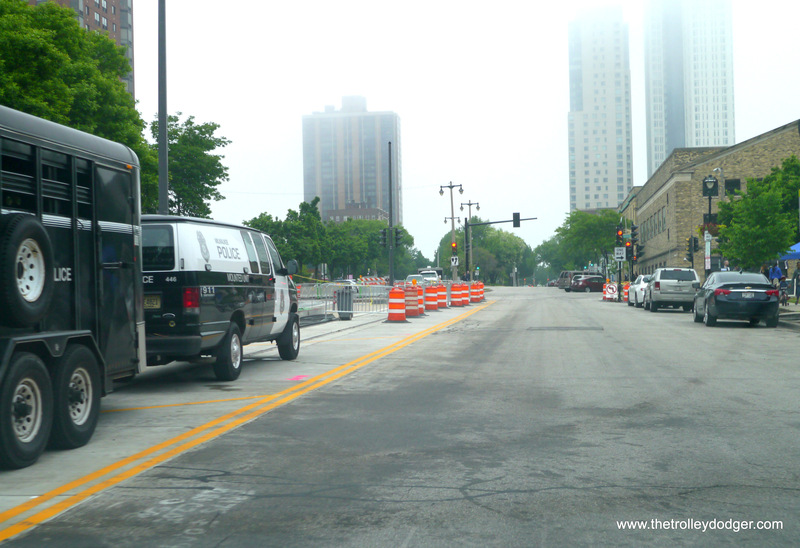 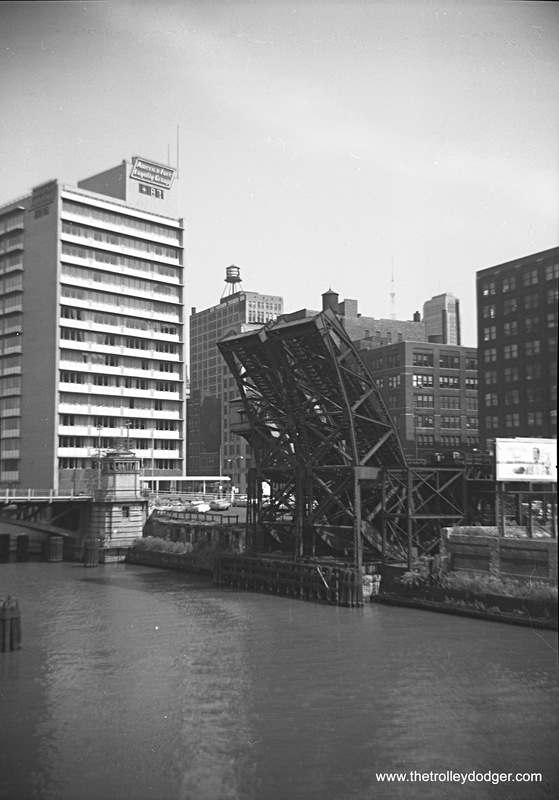 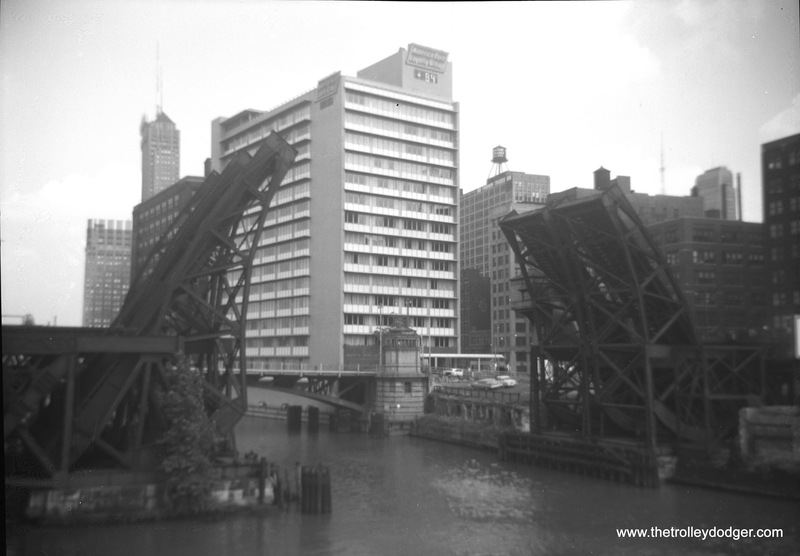 Only eastbound car and truck traffic was allowed on this bridge over the Milwaukee River. 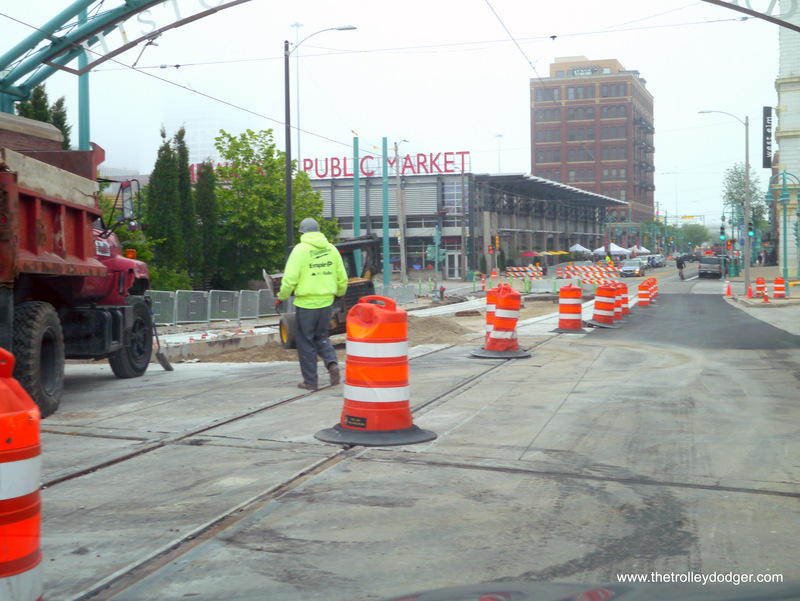 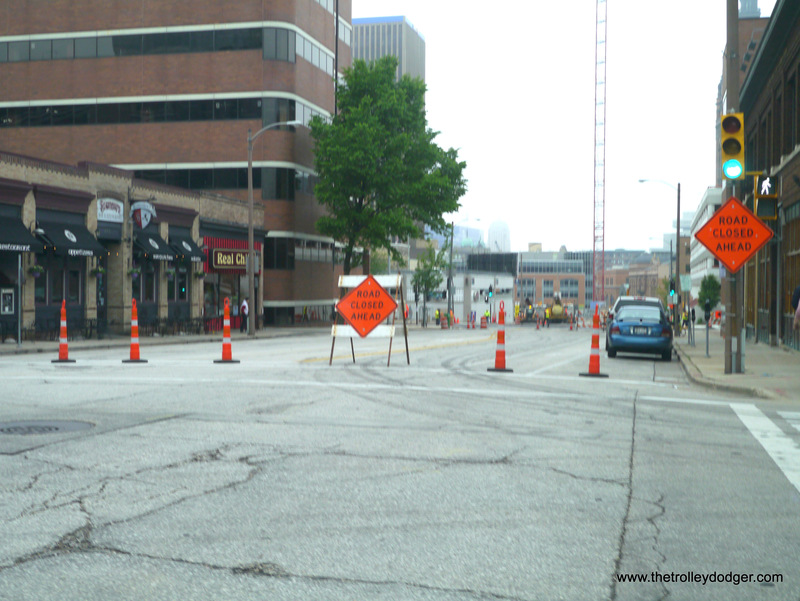 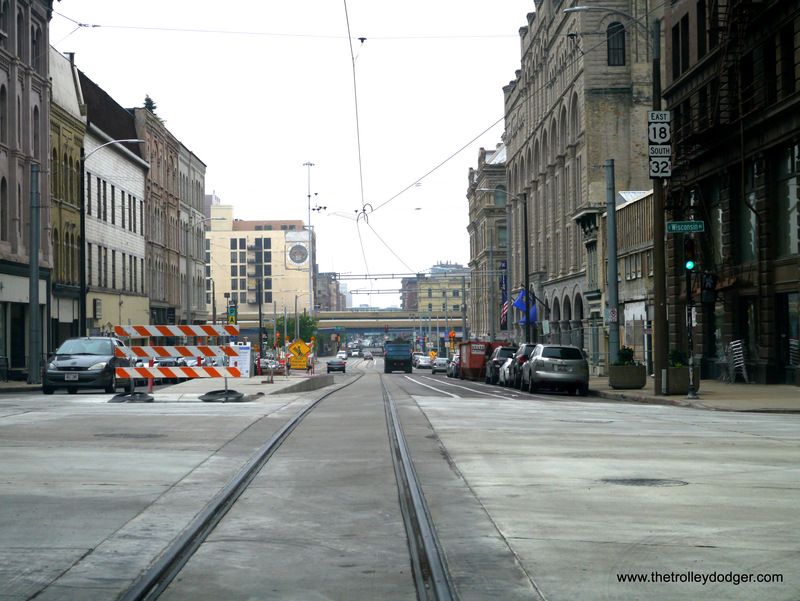 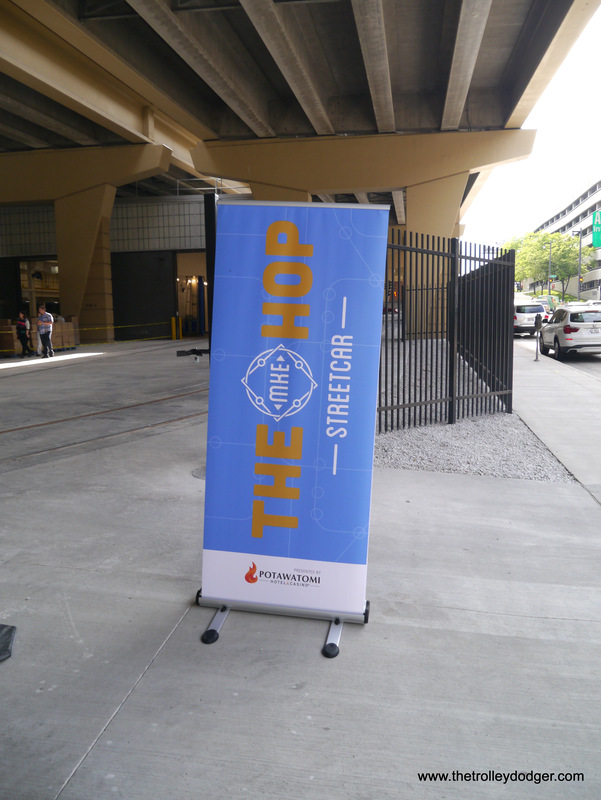 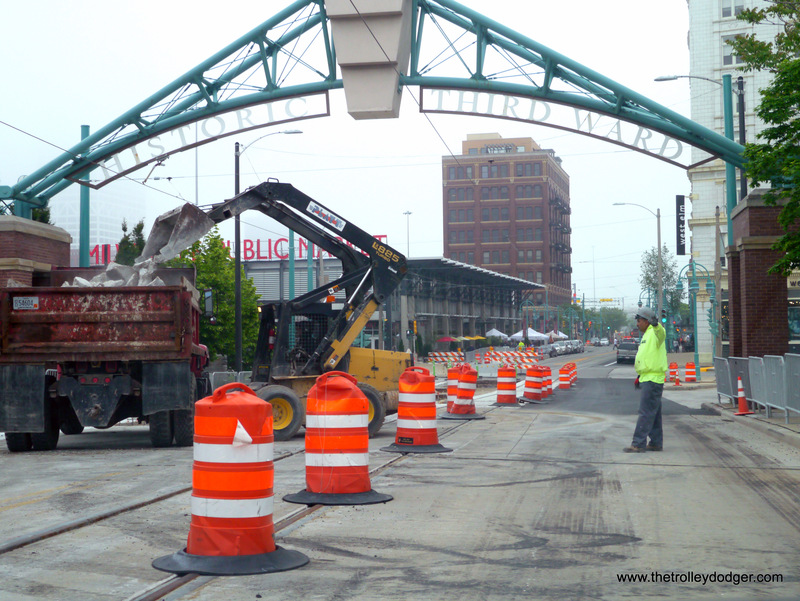 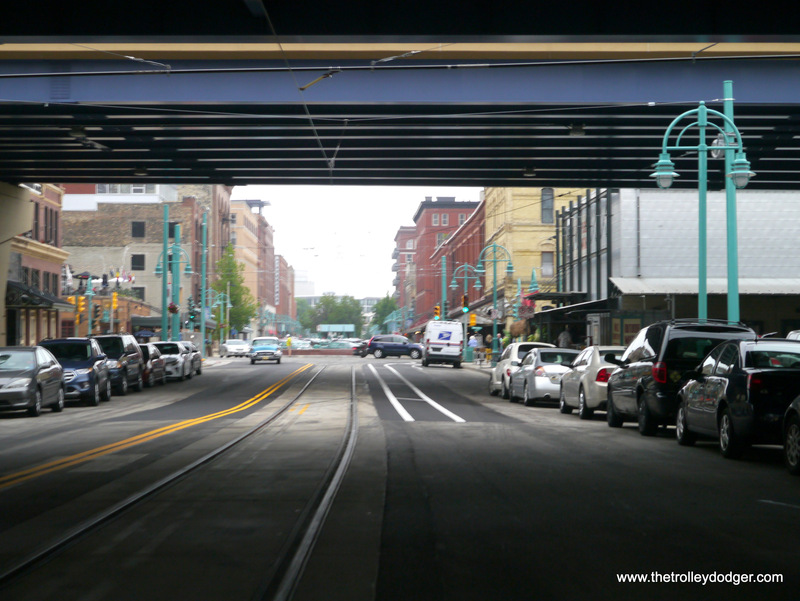 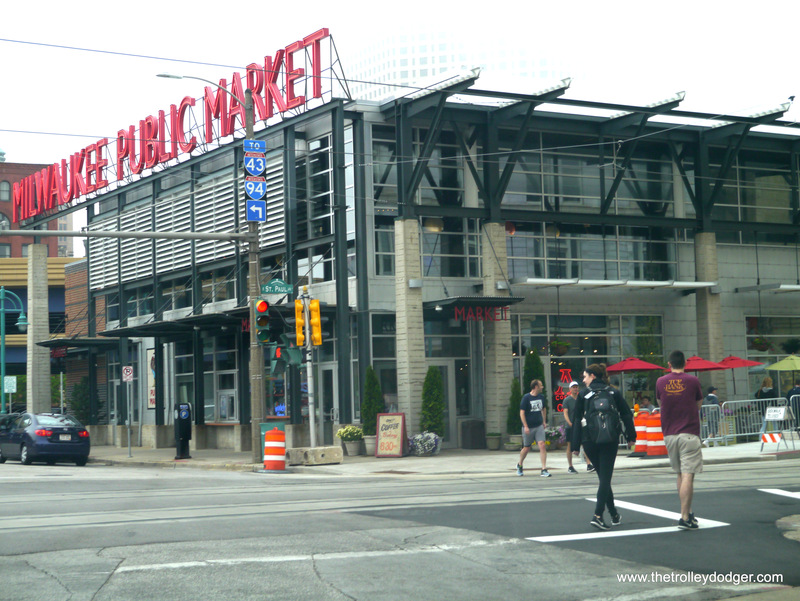 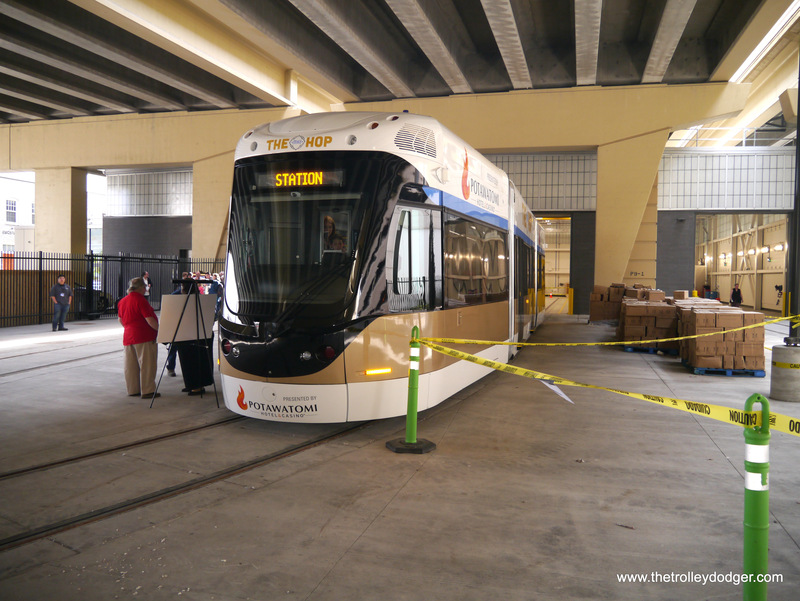 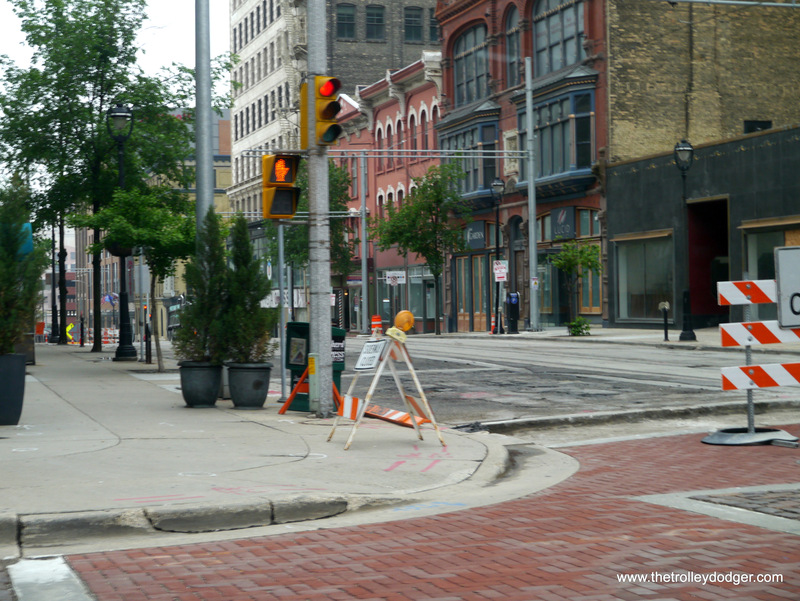 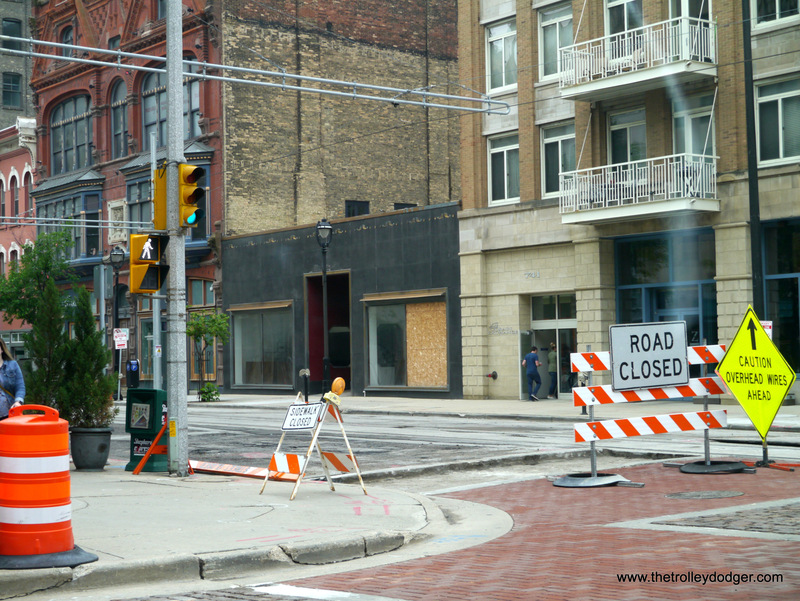 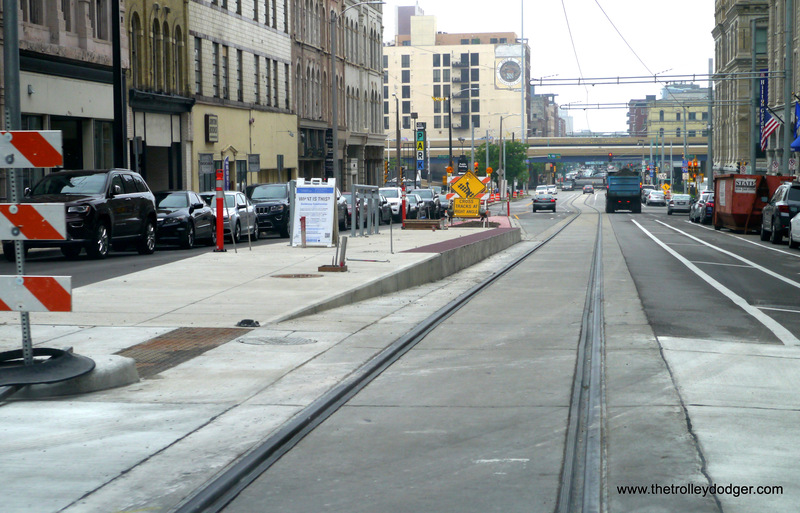 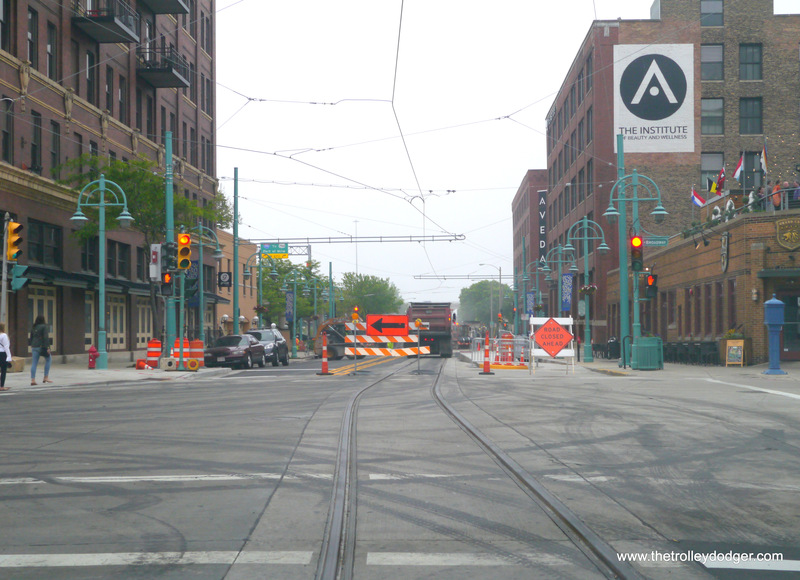 The streetcar will serve Milwaukee’s busy Public Market in the historic Third Ward. 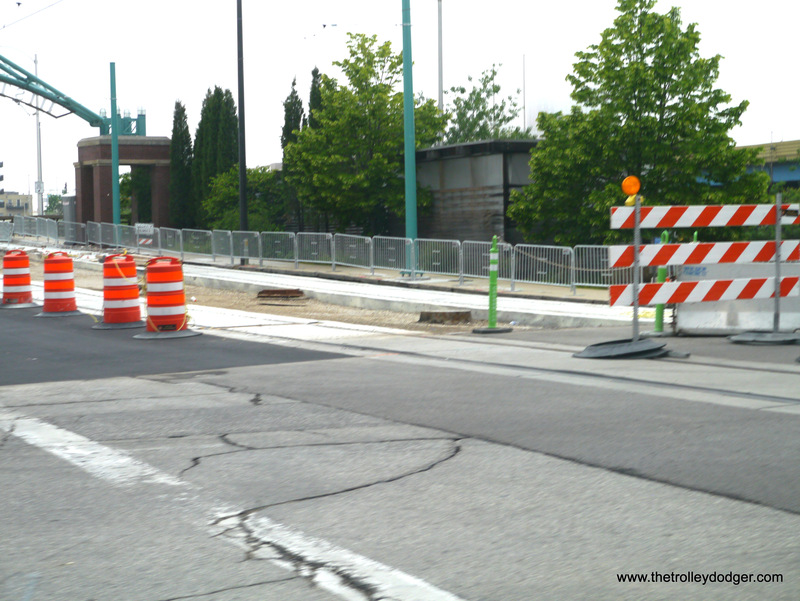 Cement work was still being done on the bridge approach. 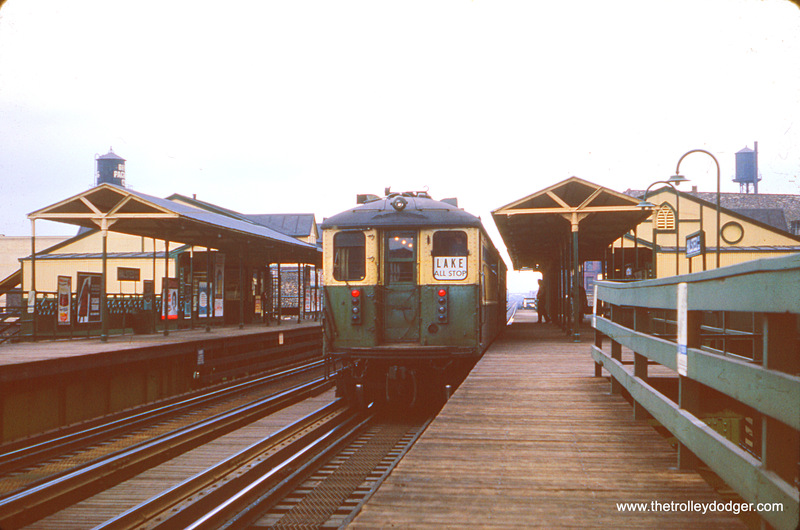 TMER&T 846 approaches the Elegant Farmer. 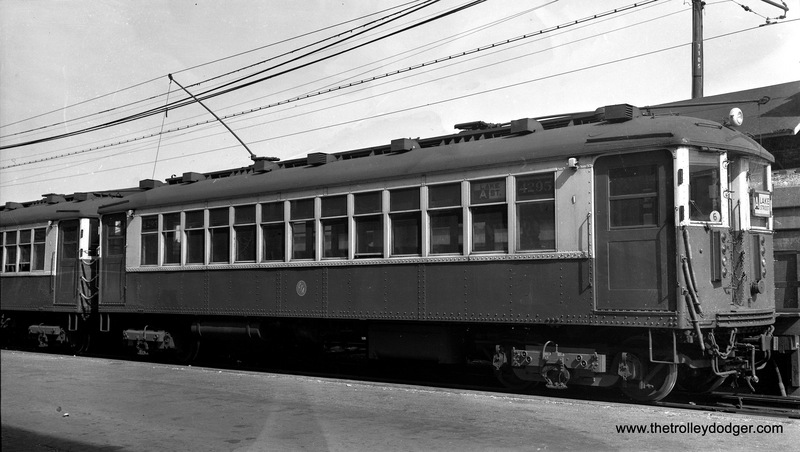 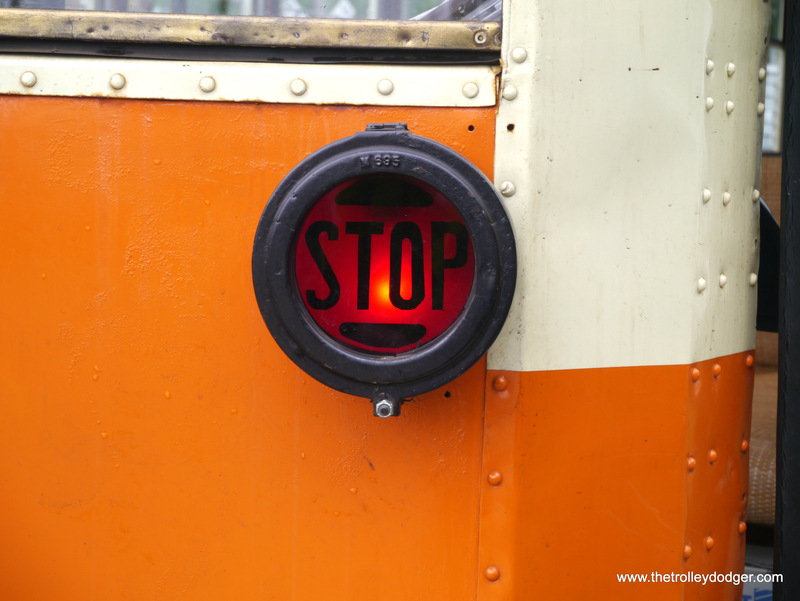 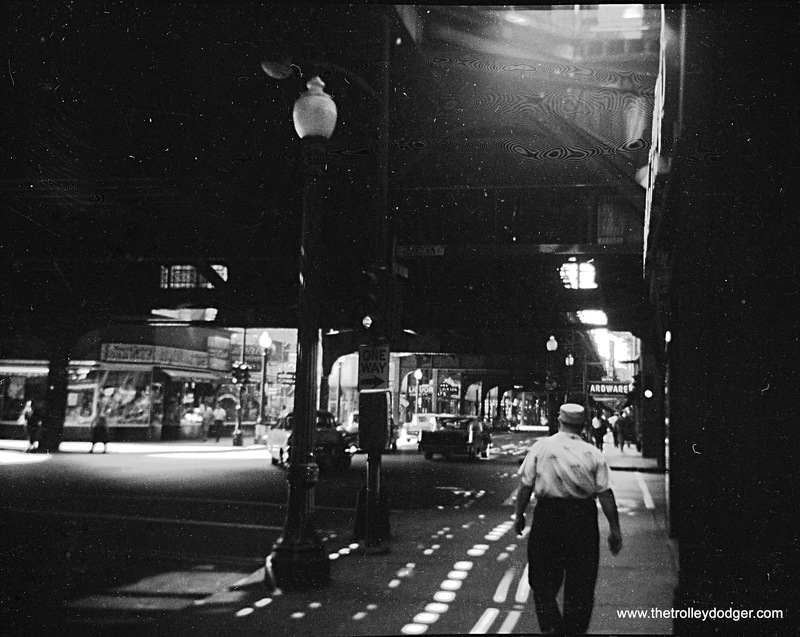 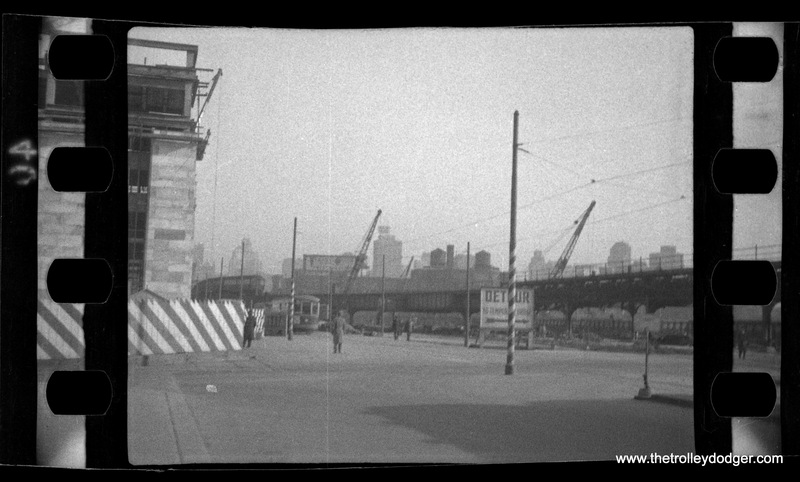 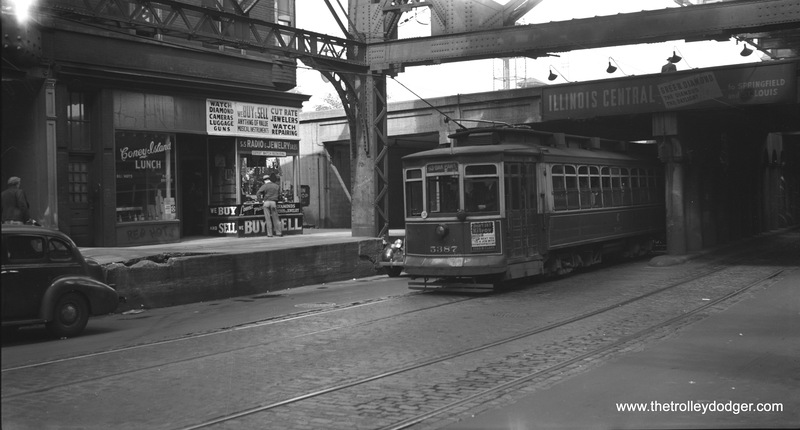 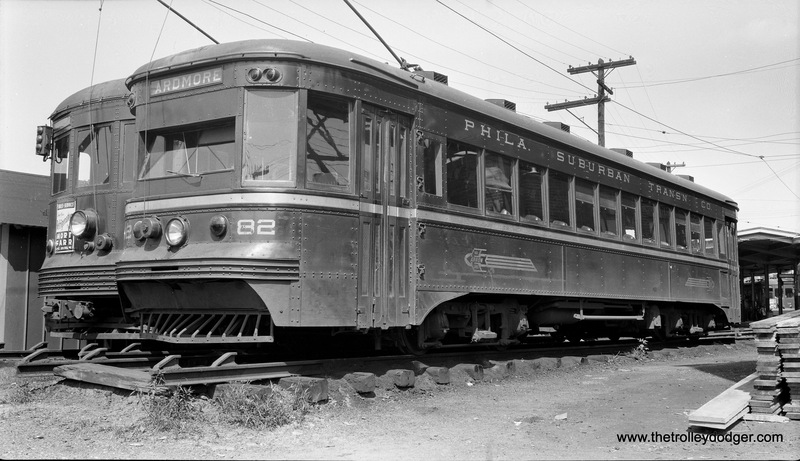 Rear taillights were being added to autos in the 1920s, so it should not be too surprising they began to appear on streetcars of the same era. 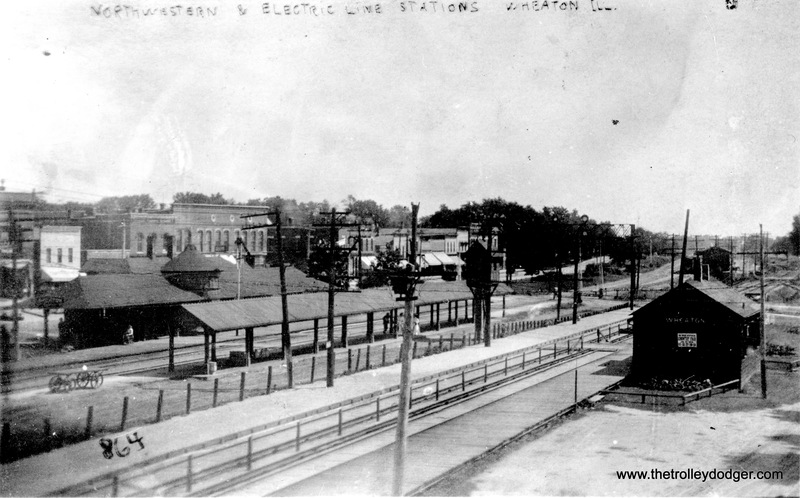 The former East Troy substation, now the museum’s depot. 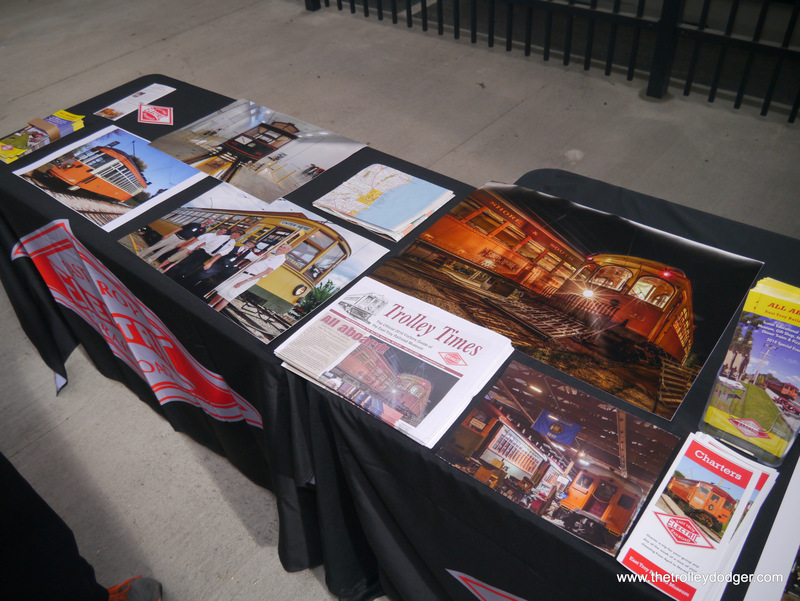 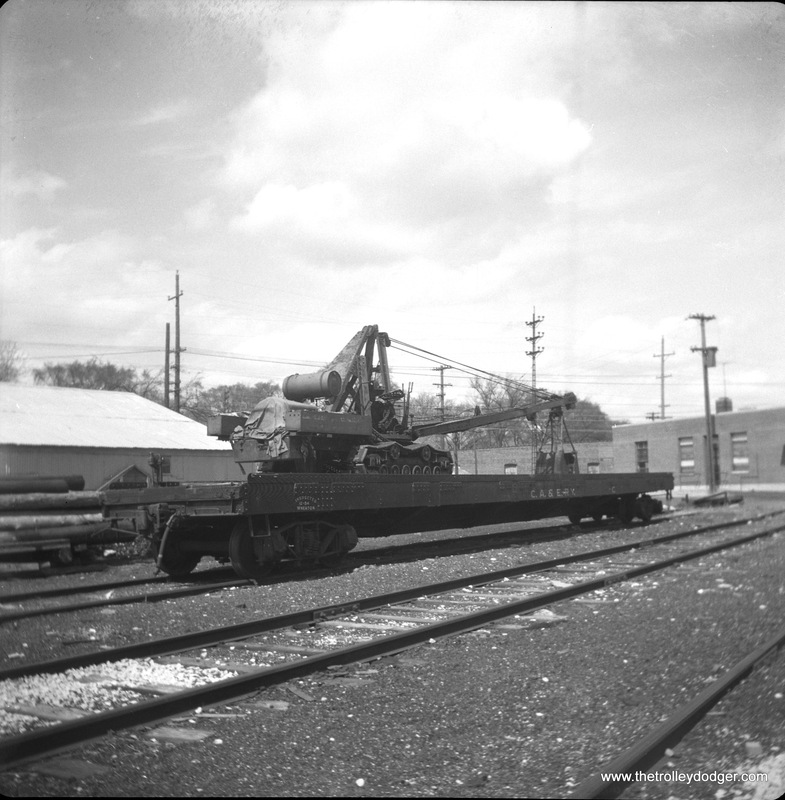 At the East Troy depot. 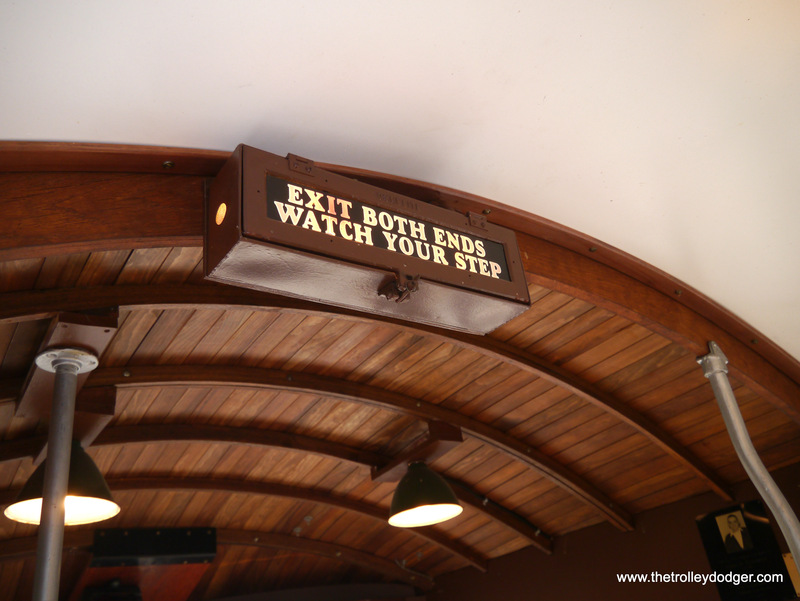 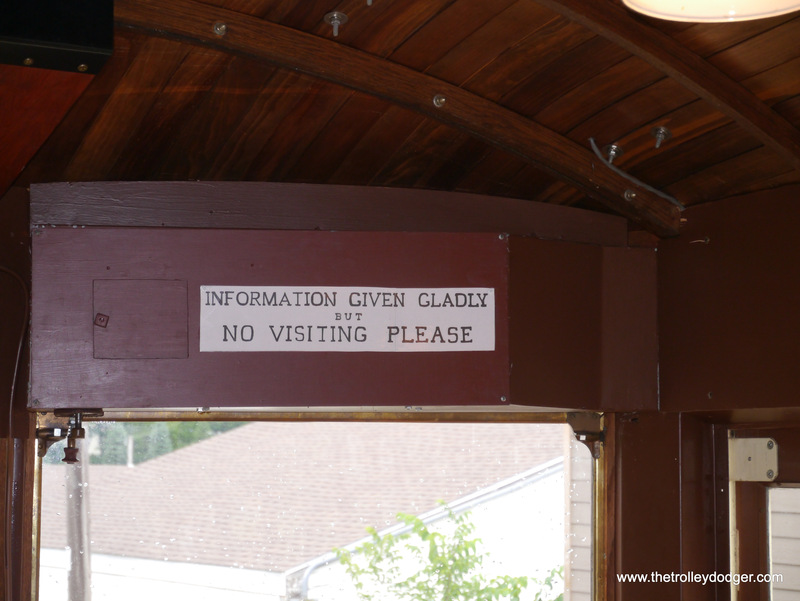 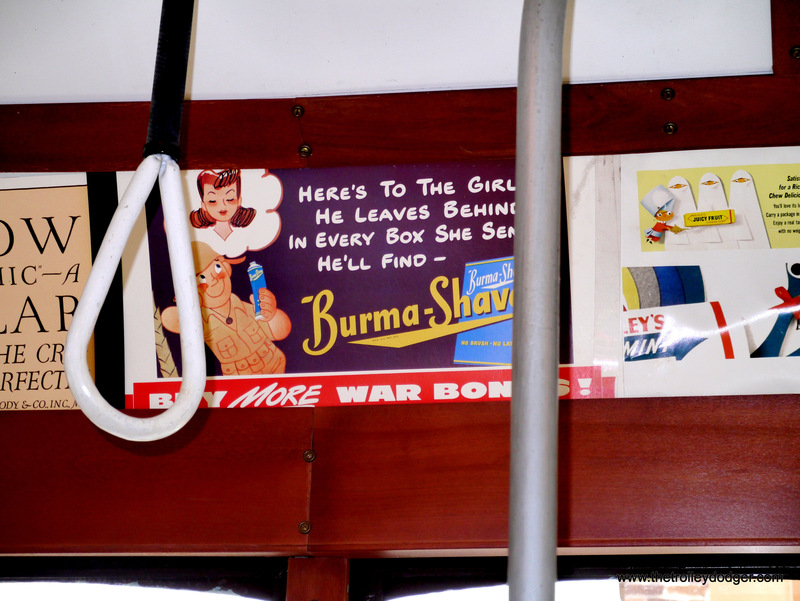 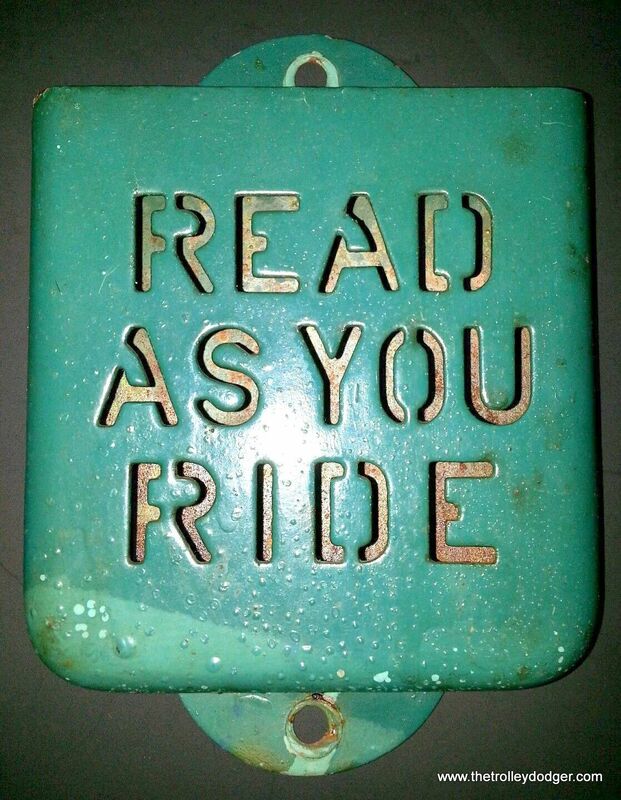 Not sure if this sign is original to the trolley or was added in museum service. 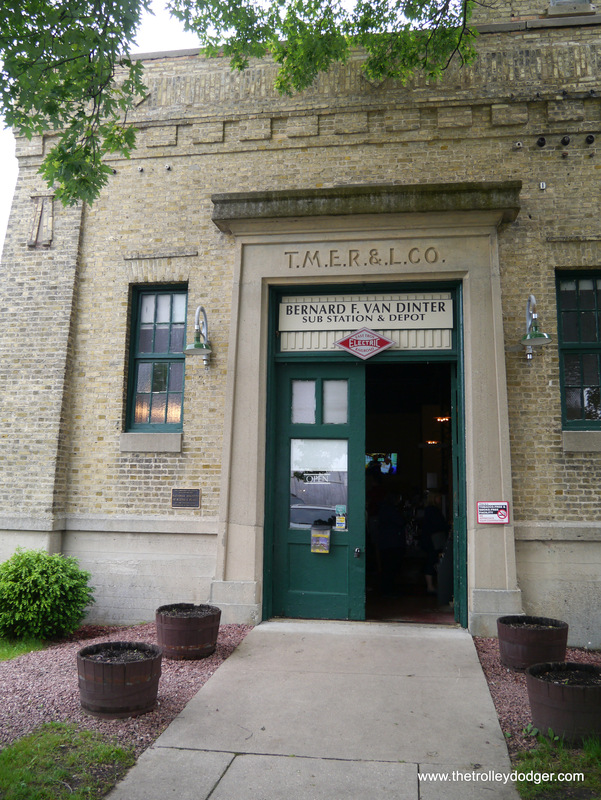 Unloading at the Elegant Farmer in Muckwonago. 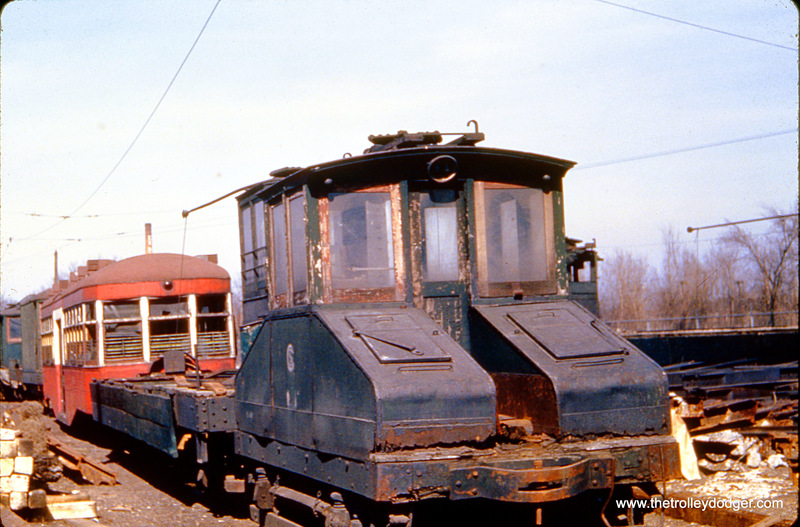 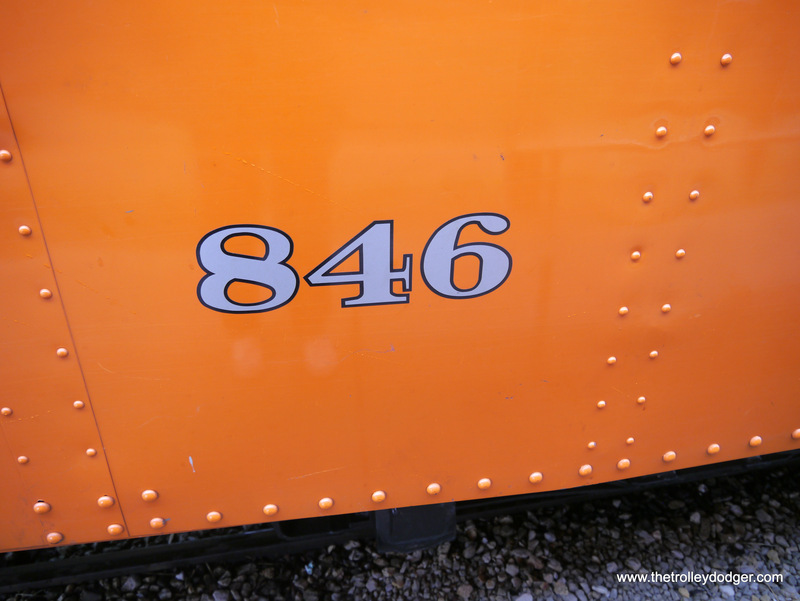 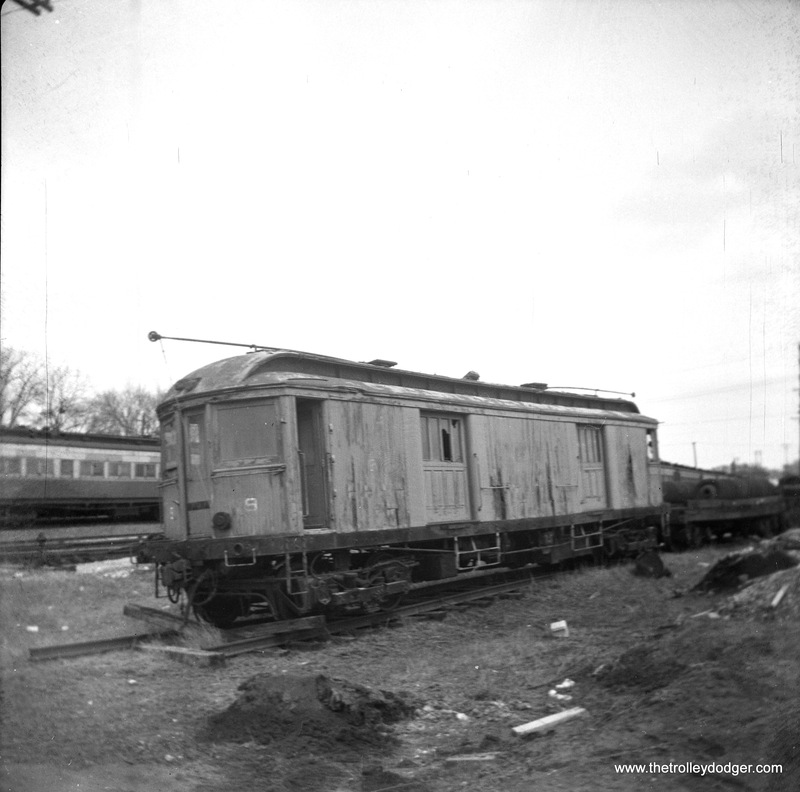 This is our 213th post, and we are gradually creating a body of work and an online resource for the benefit of all railfans, everywhere. 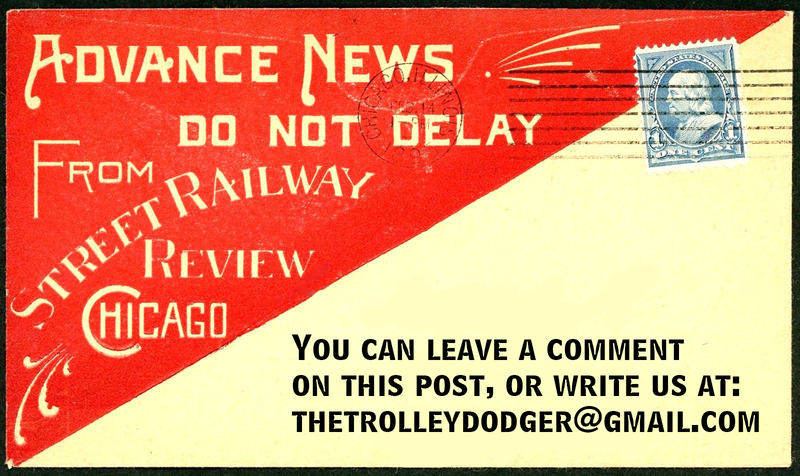 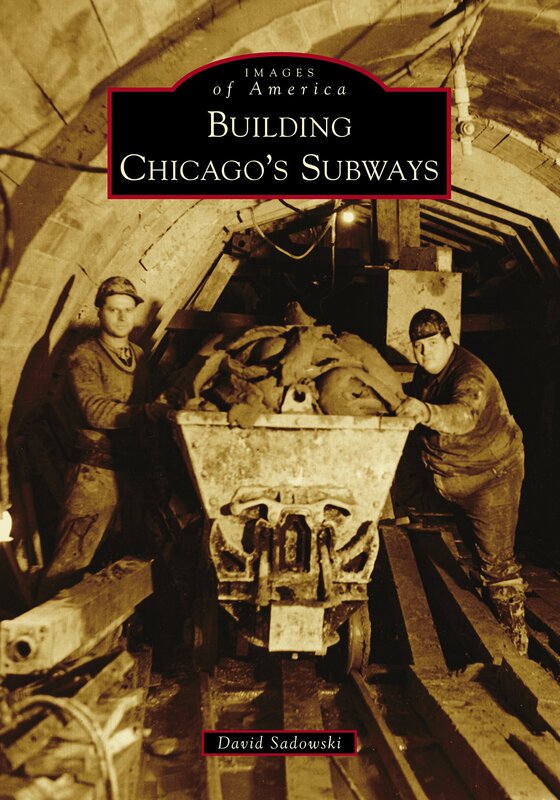 To date, we have received over 411,000 page views, for which we are very grateful.